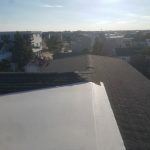 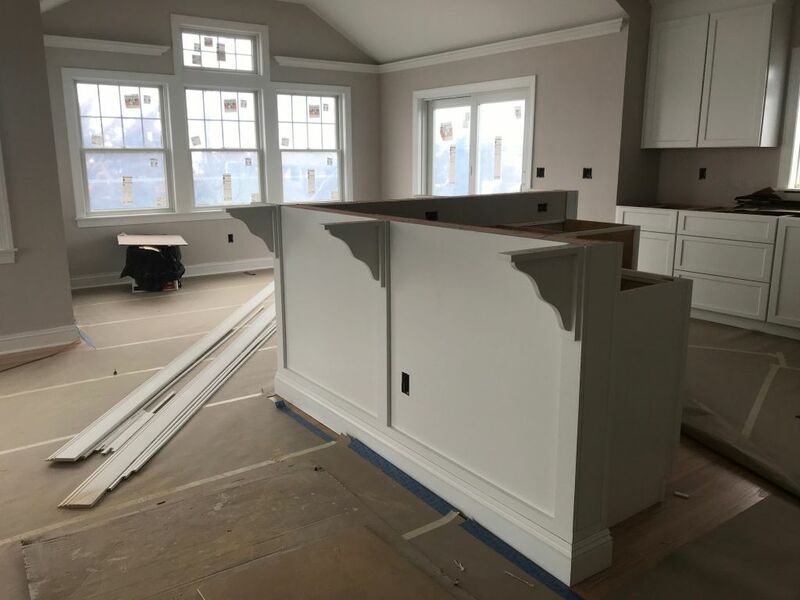 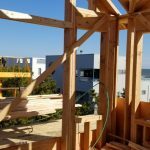 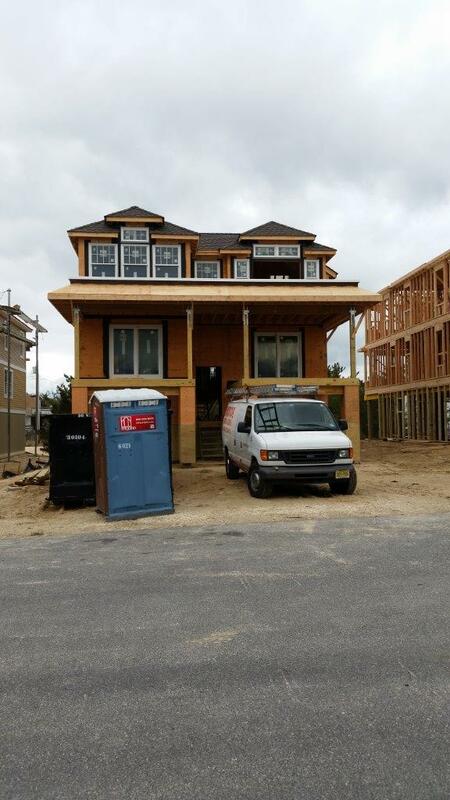 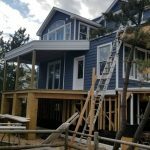 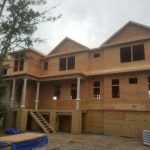 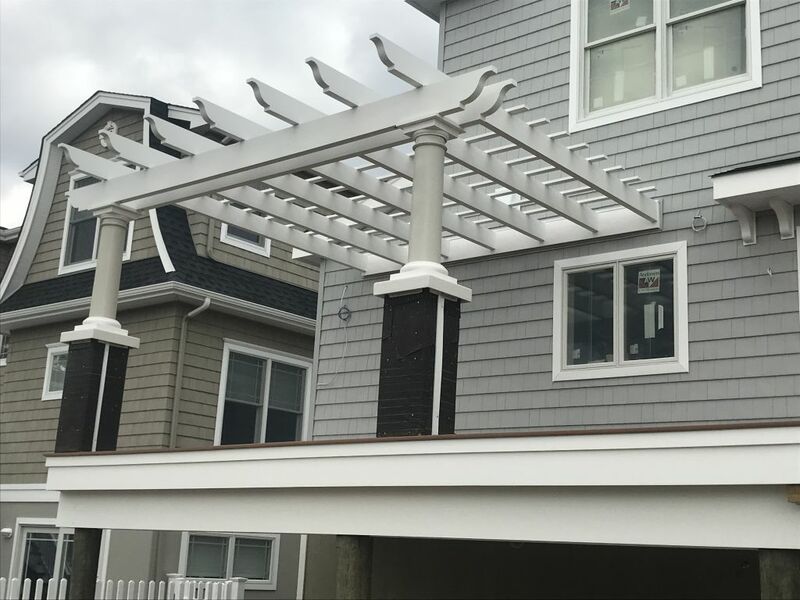 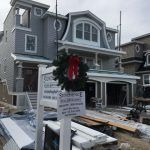 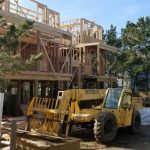 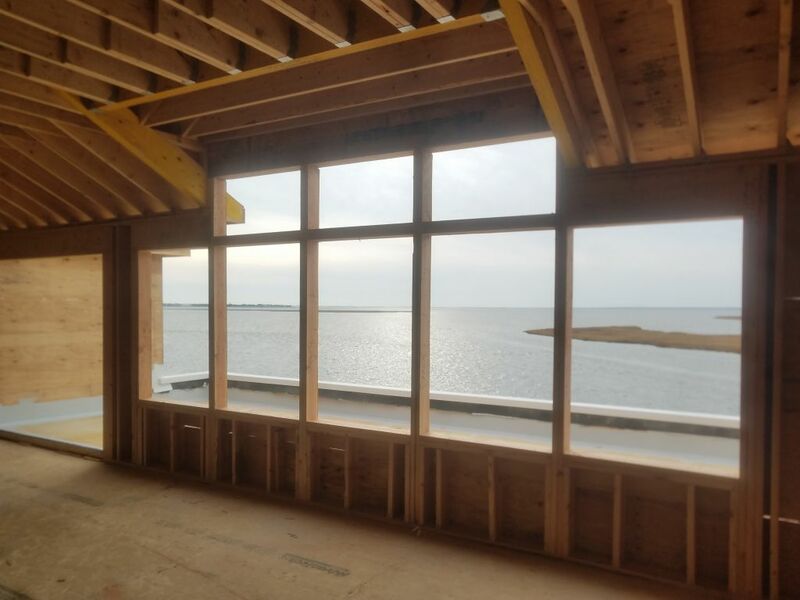 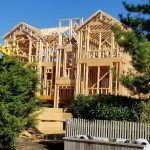 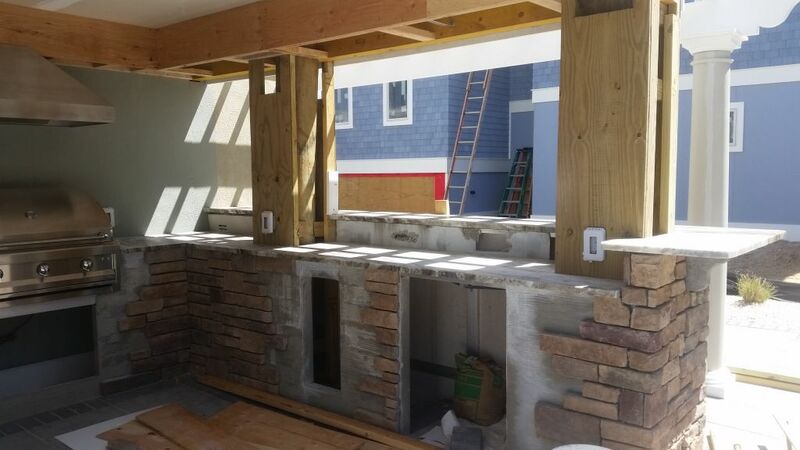 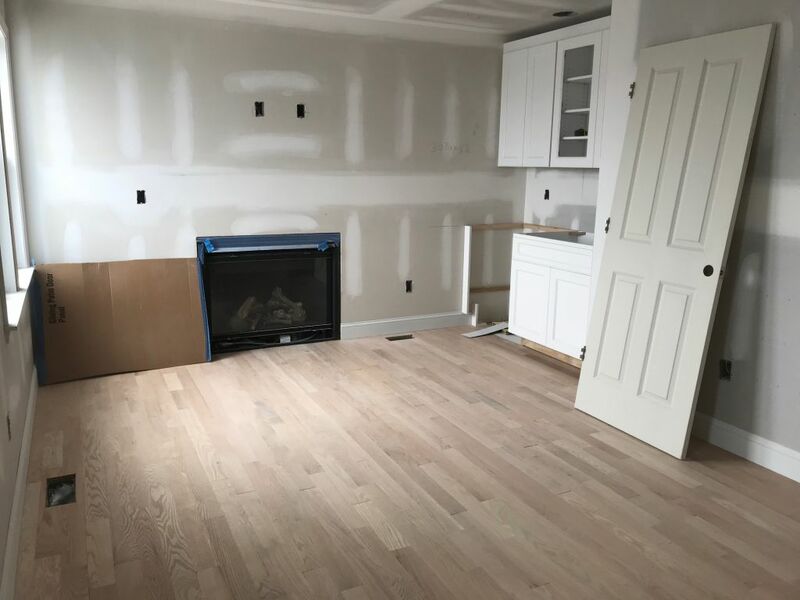 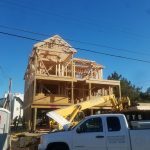 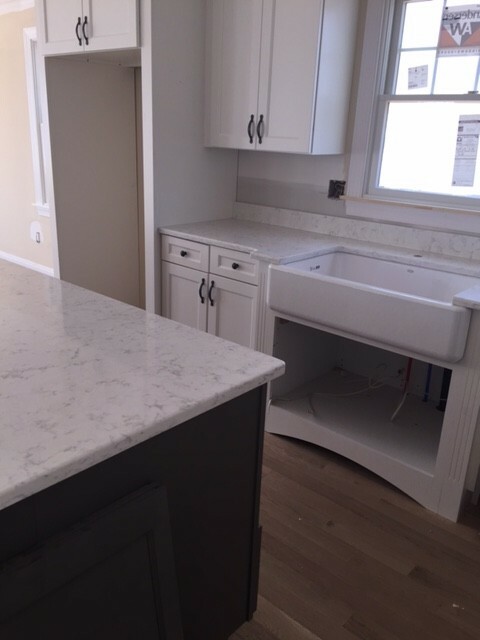 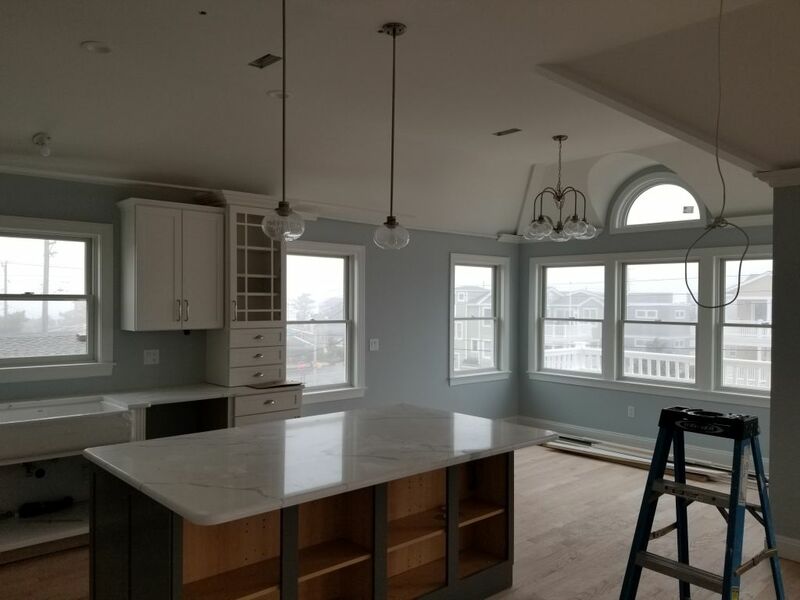 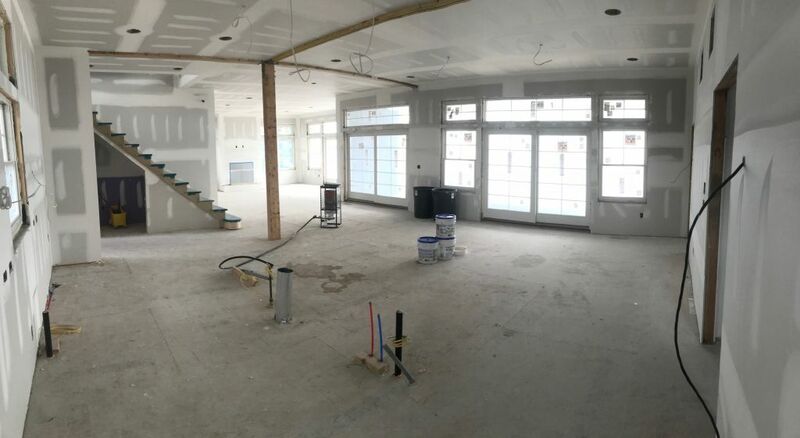 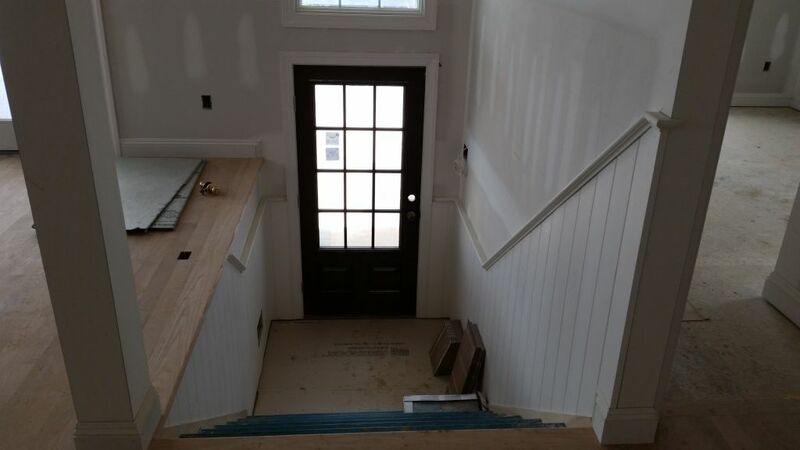 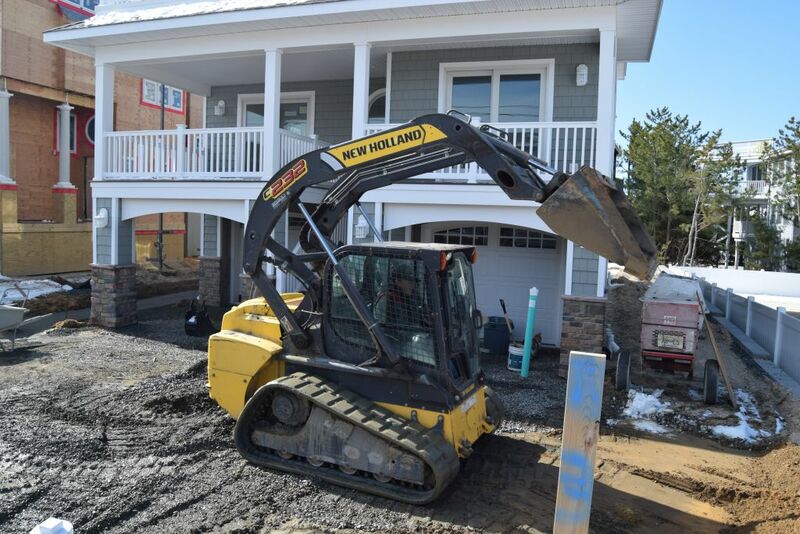 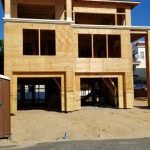 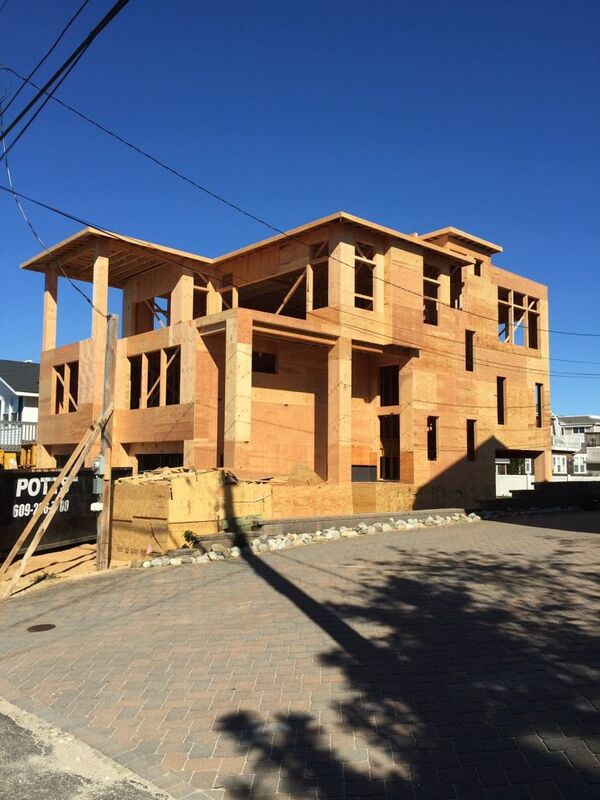 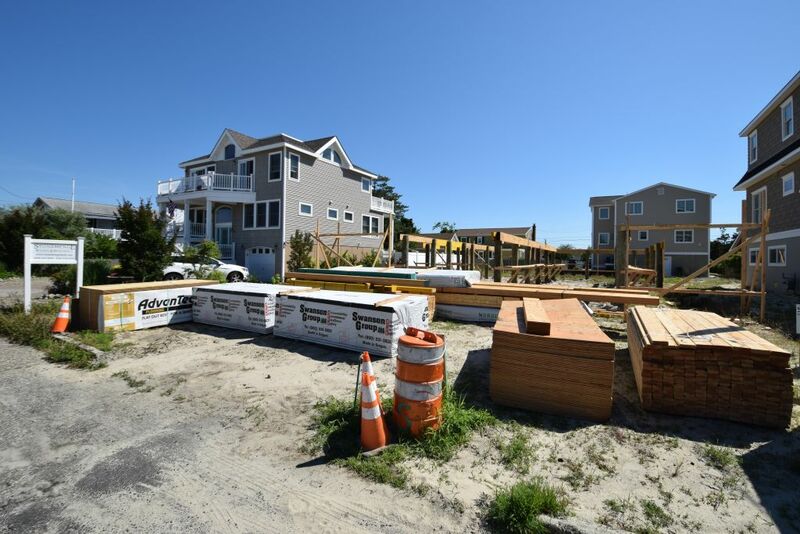 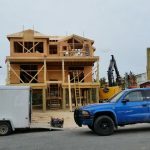 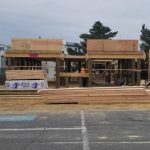 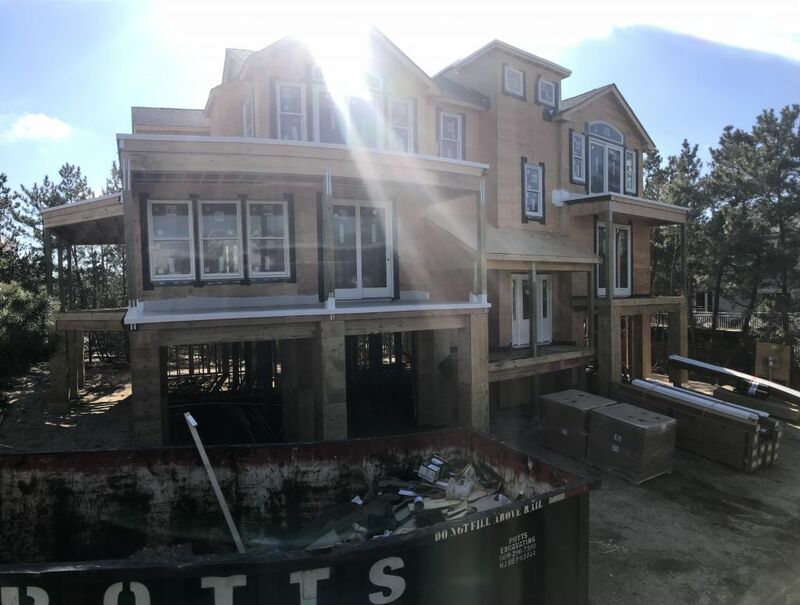 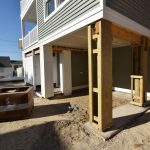 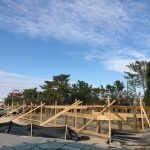 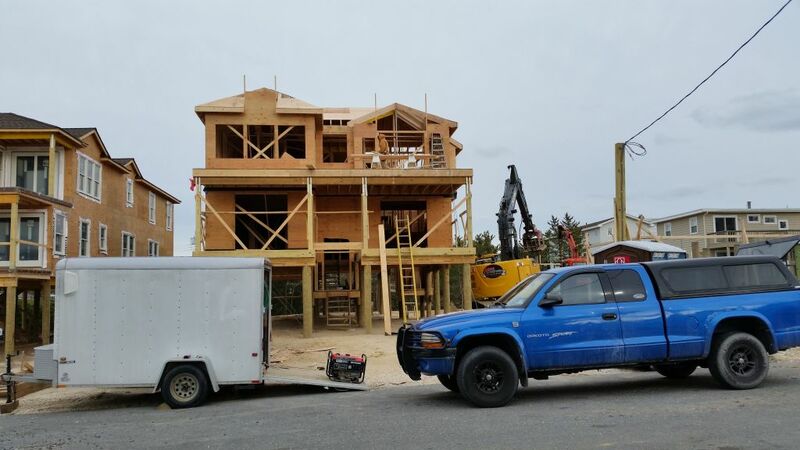 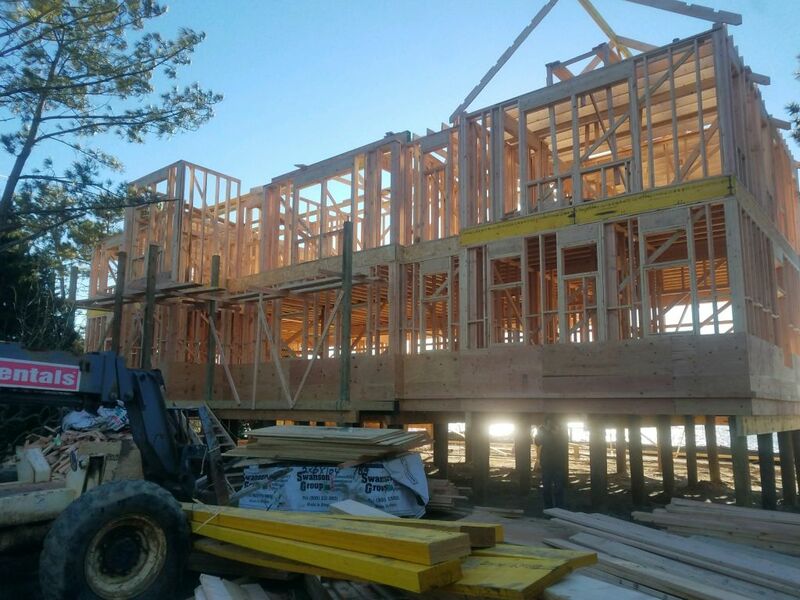 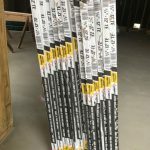 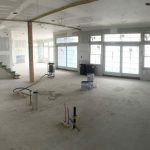 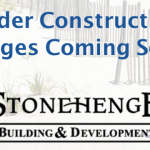 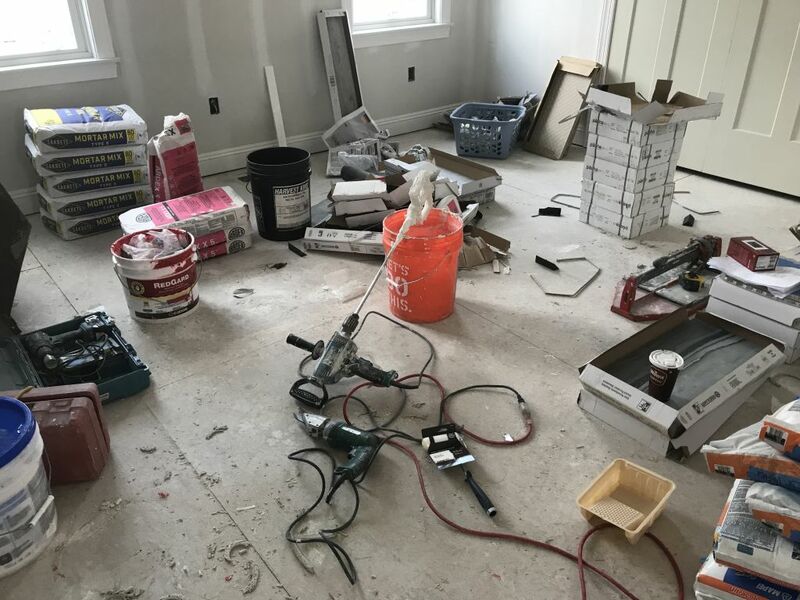 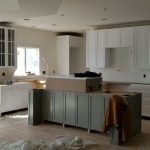 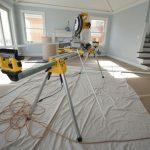 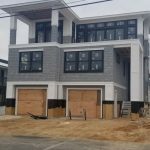 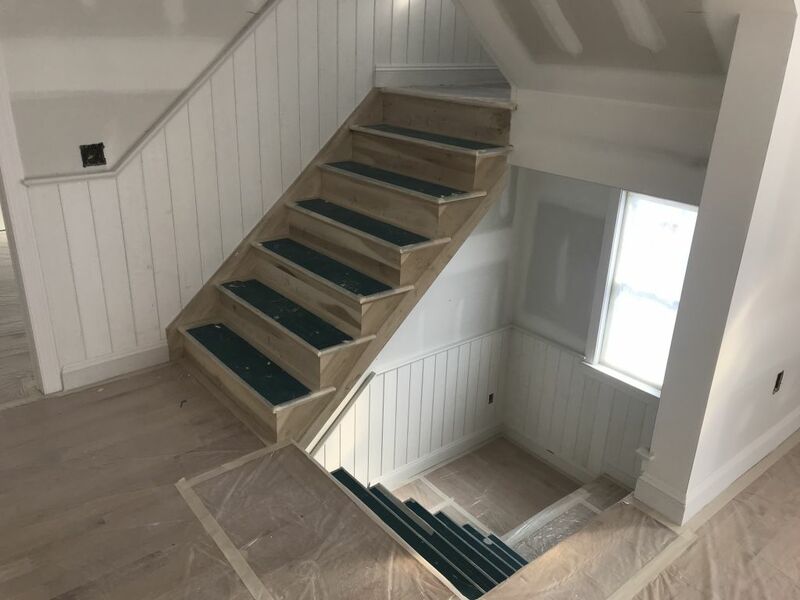 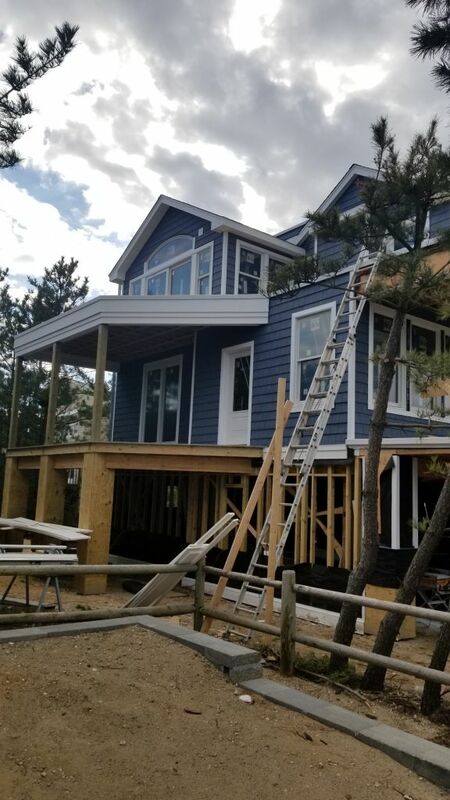 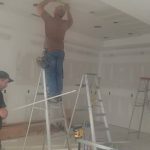 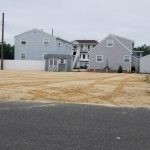 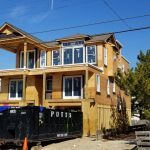 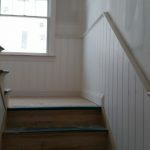 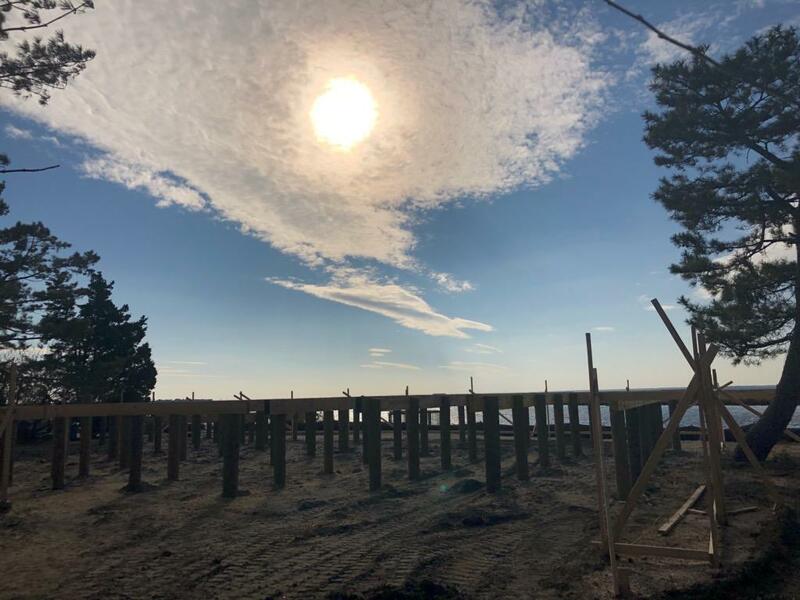 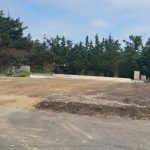 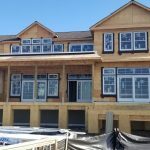 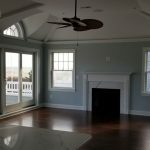 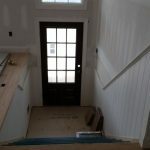 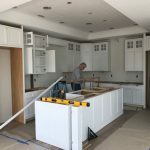 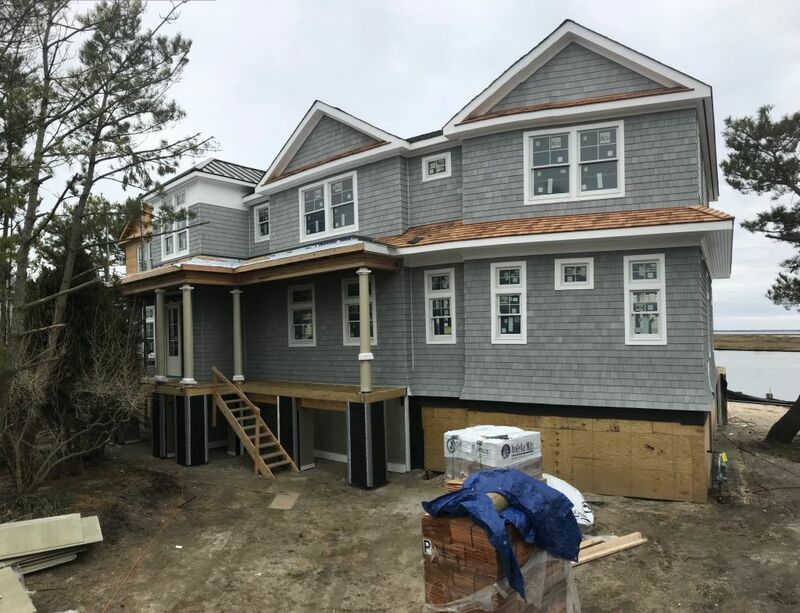 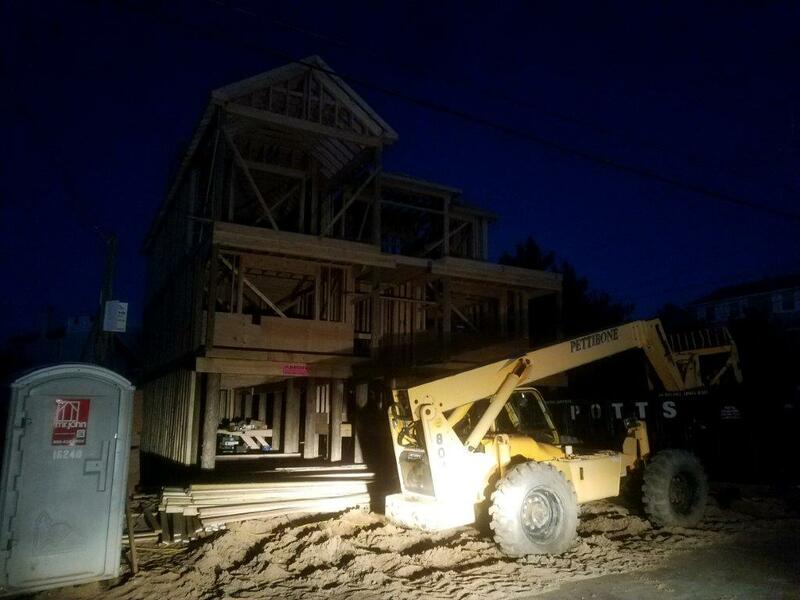 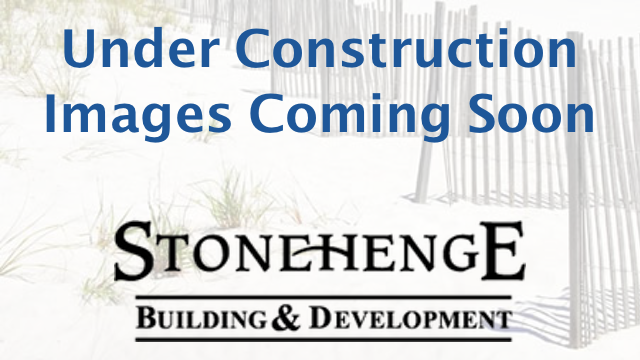 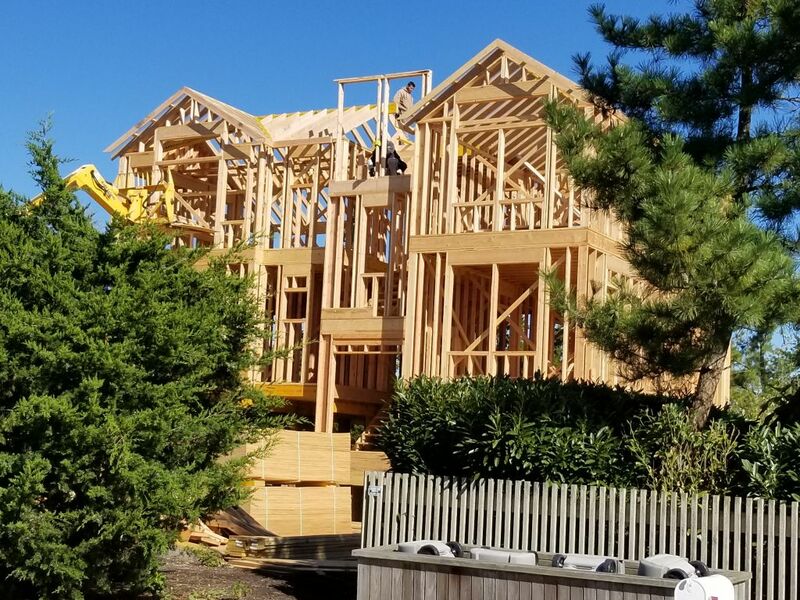 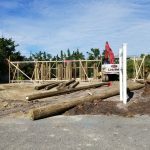 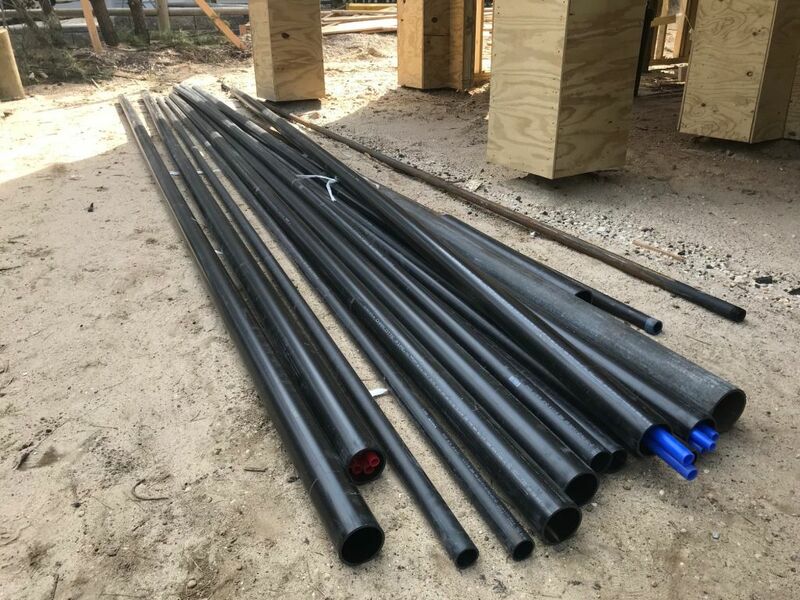 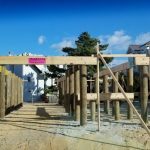 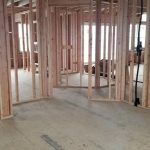 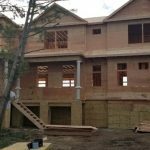 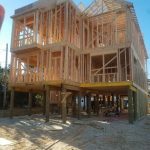 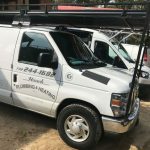 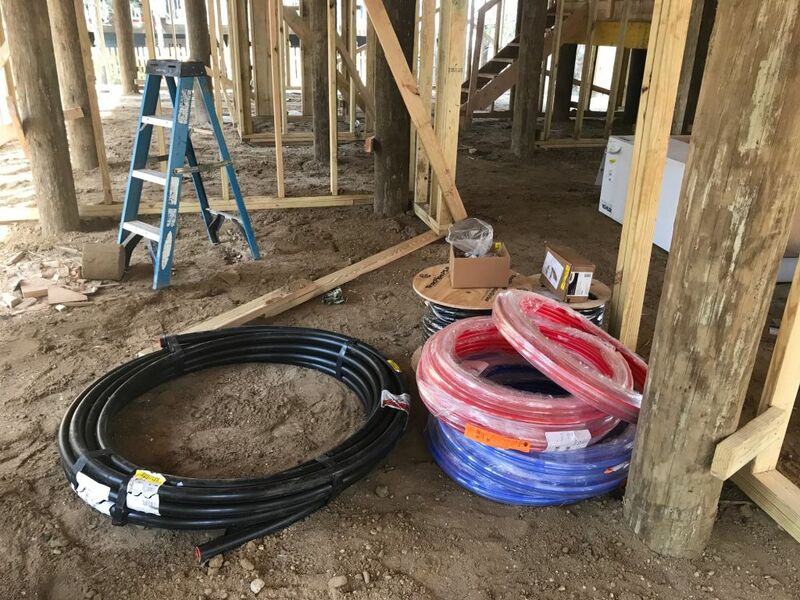 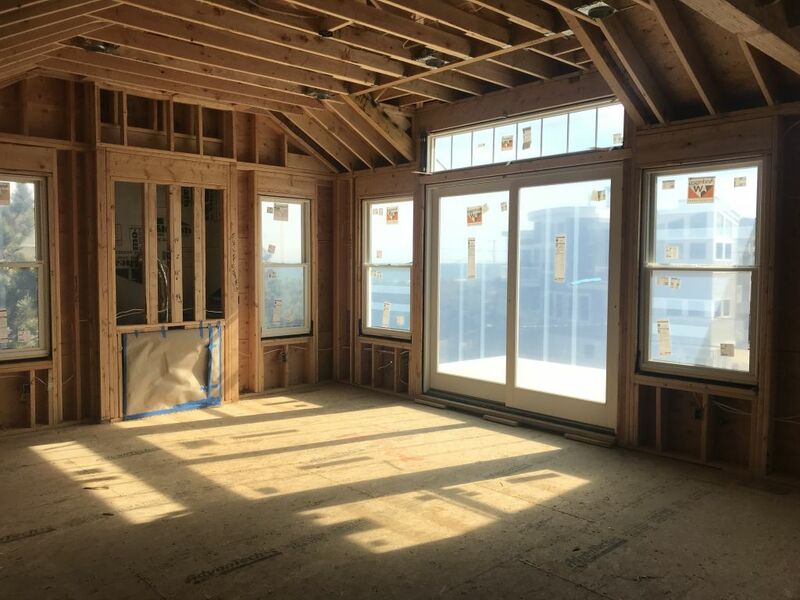 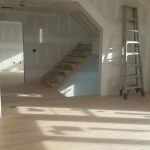 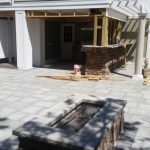 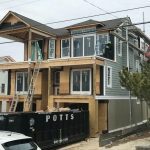 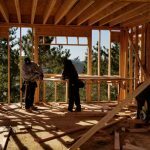 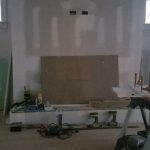 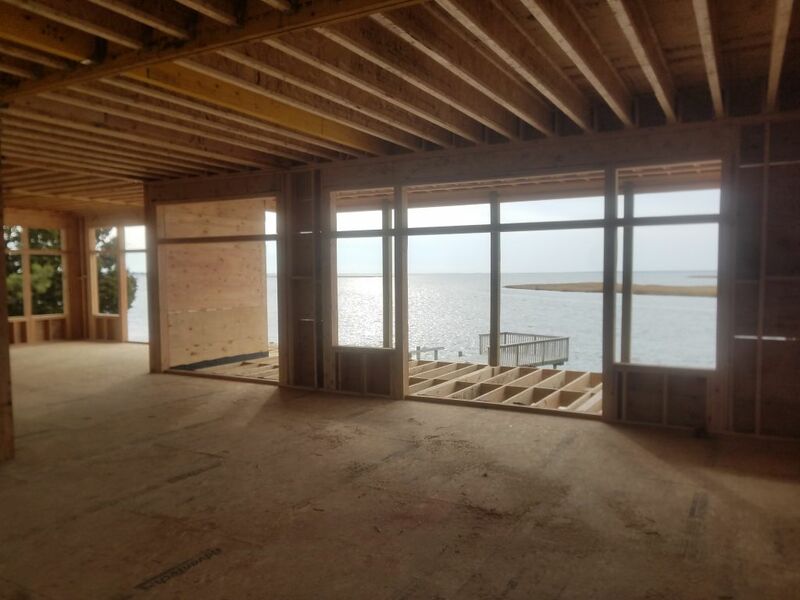 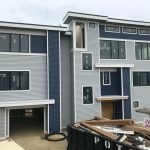 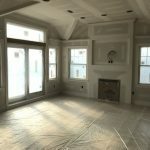 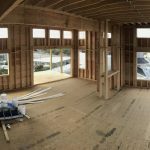 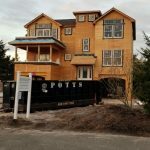 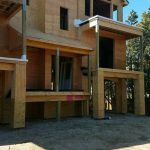 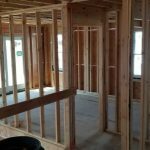 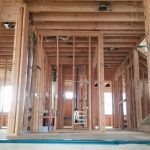 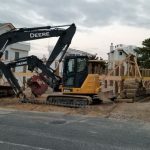 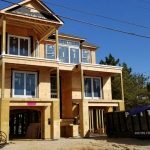 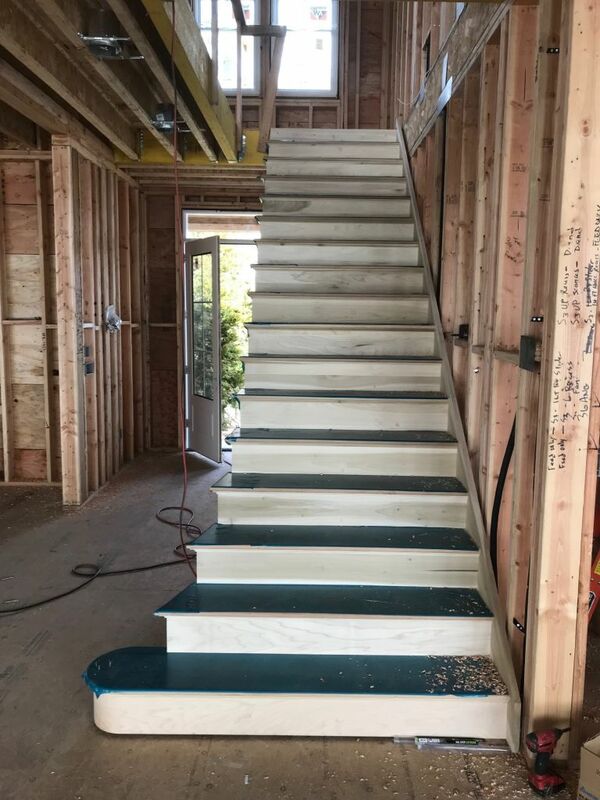 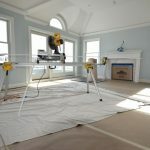 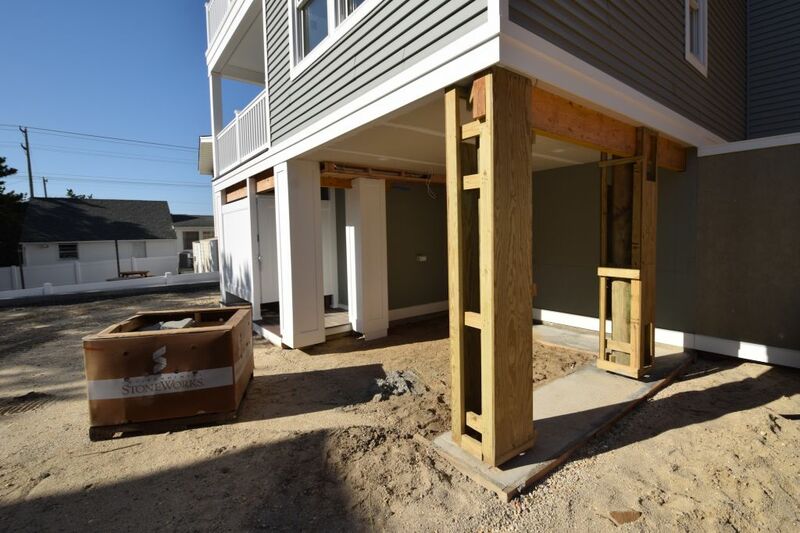 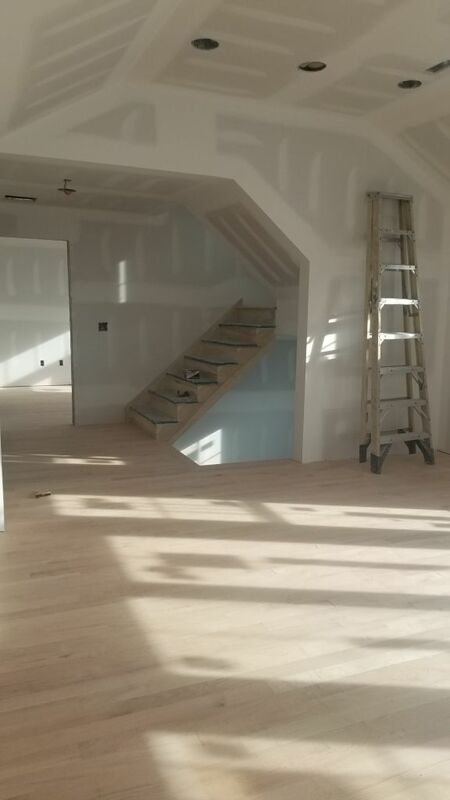 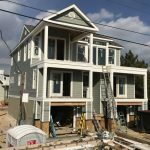 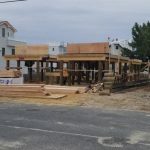 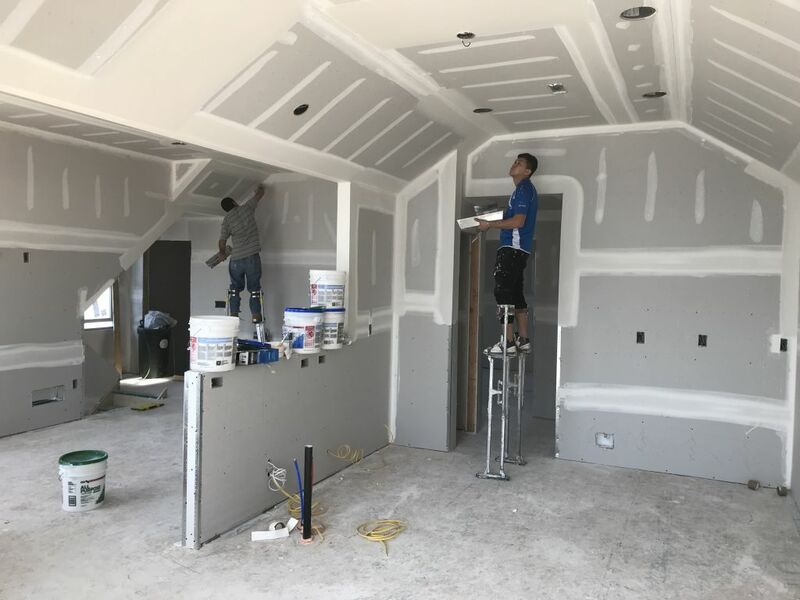 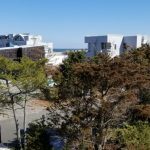 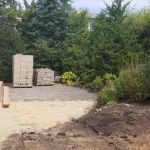 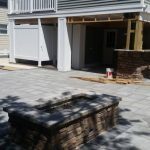 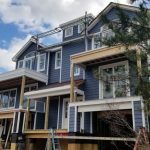 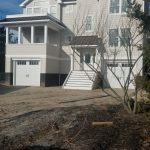 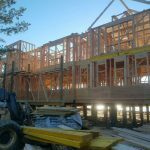 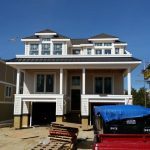 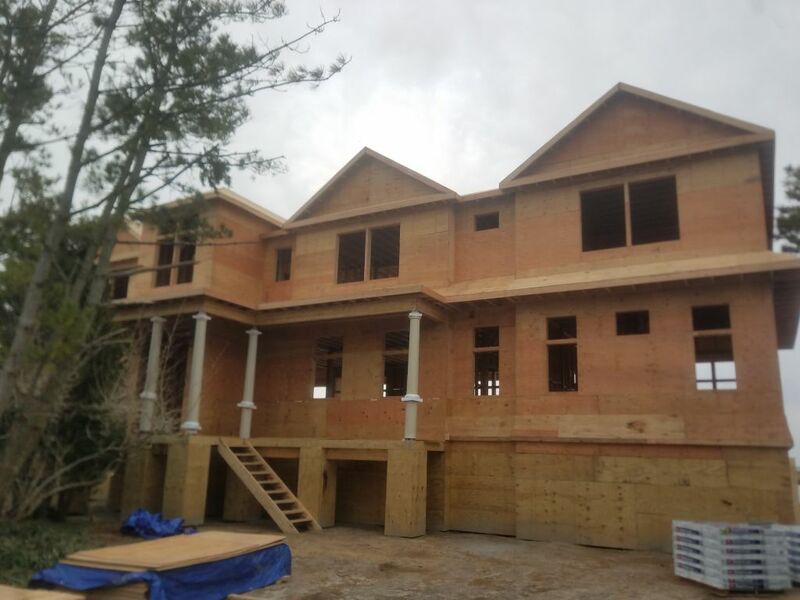 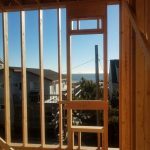 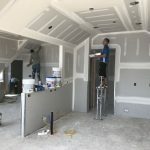 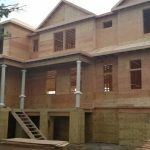 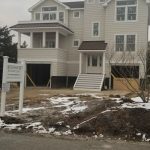 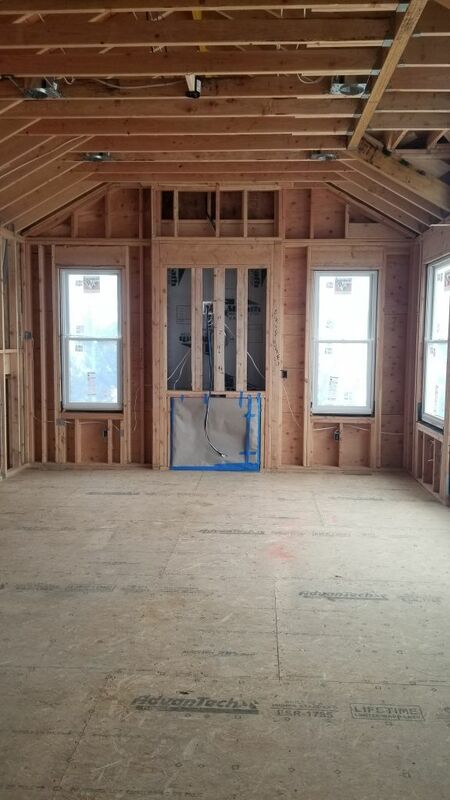 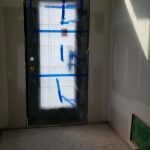 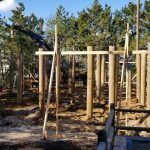 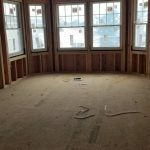 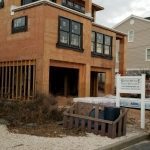 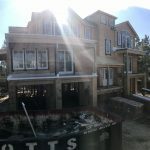 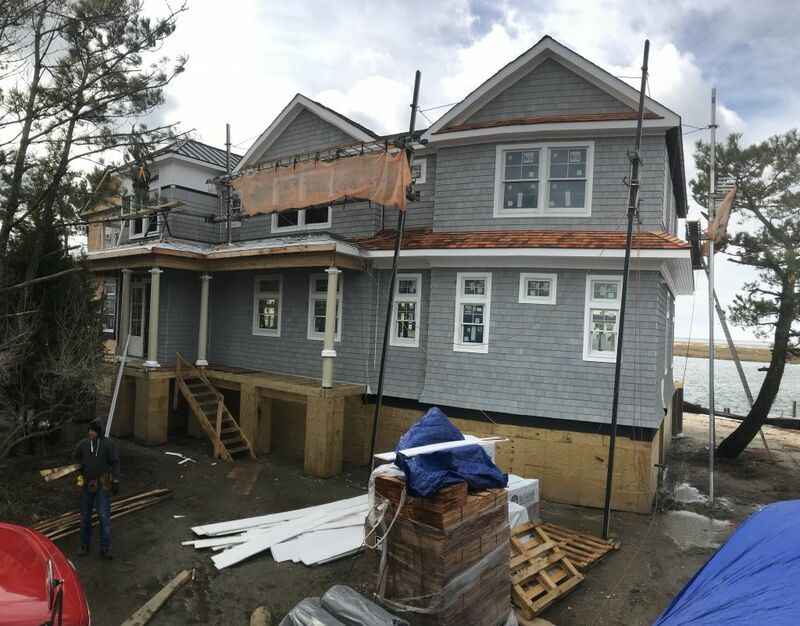 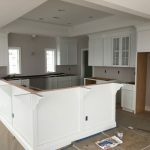 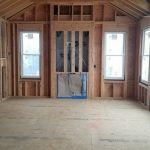 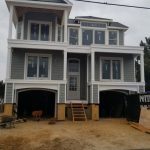 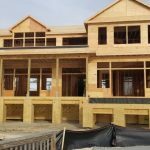 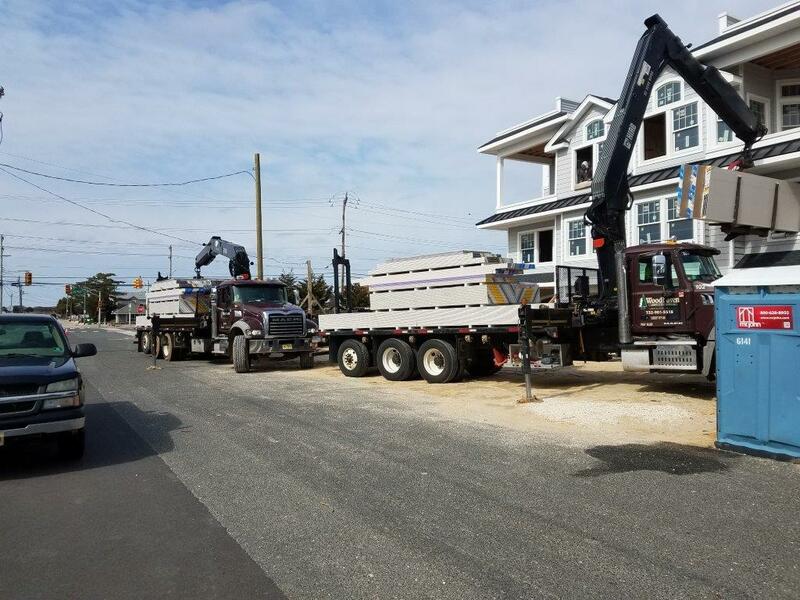 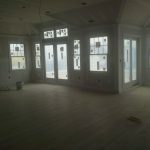 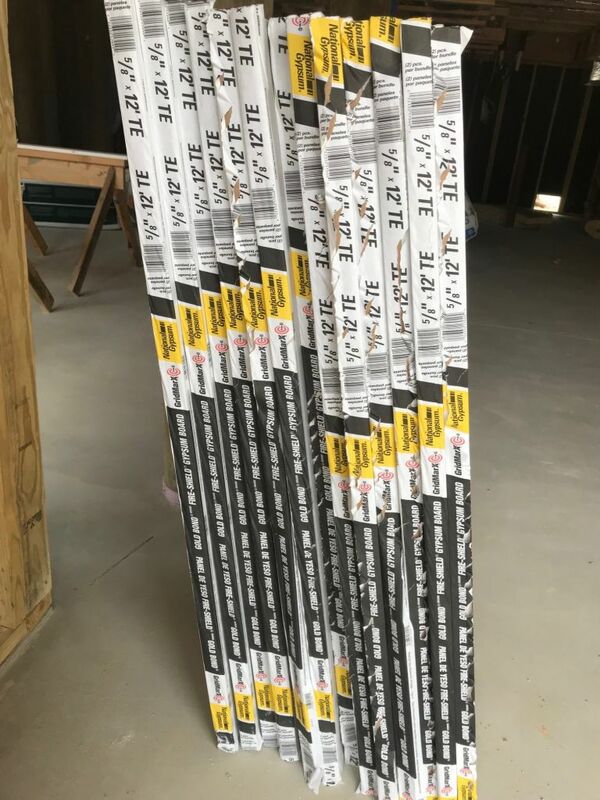 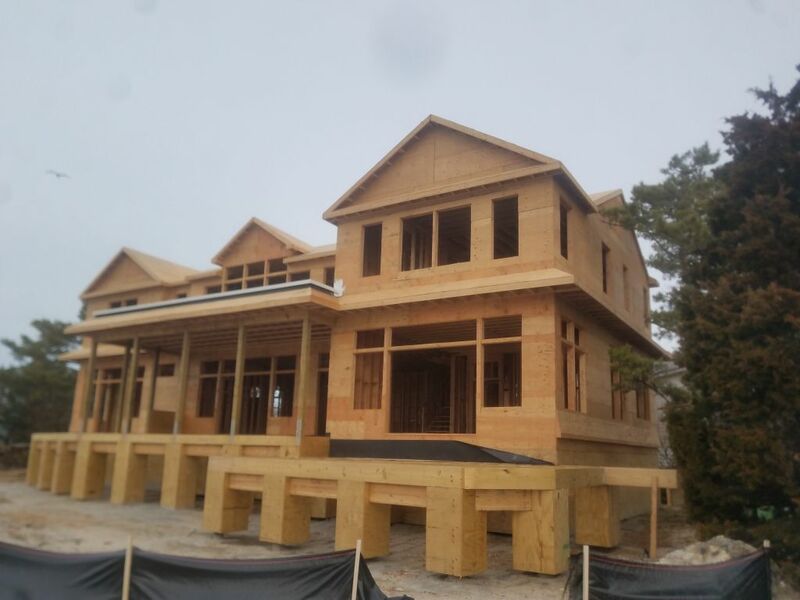 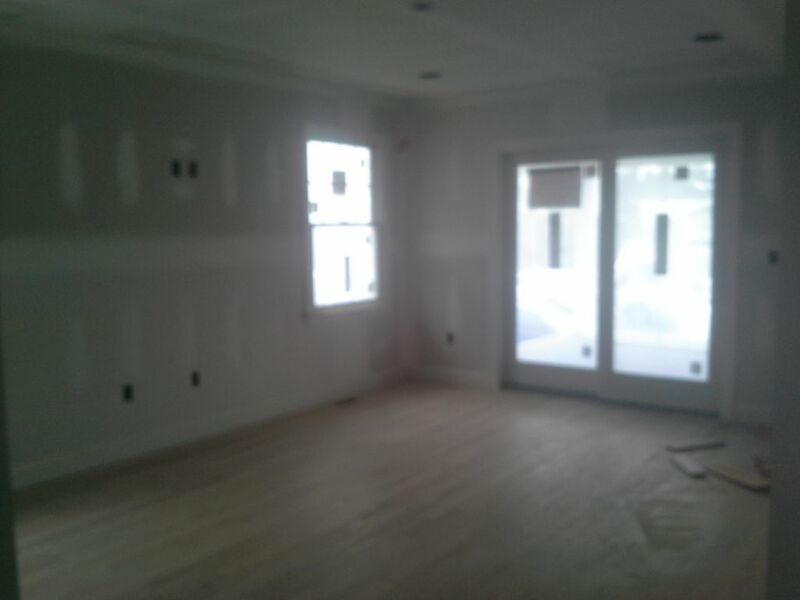 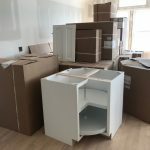 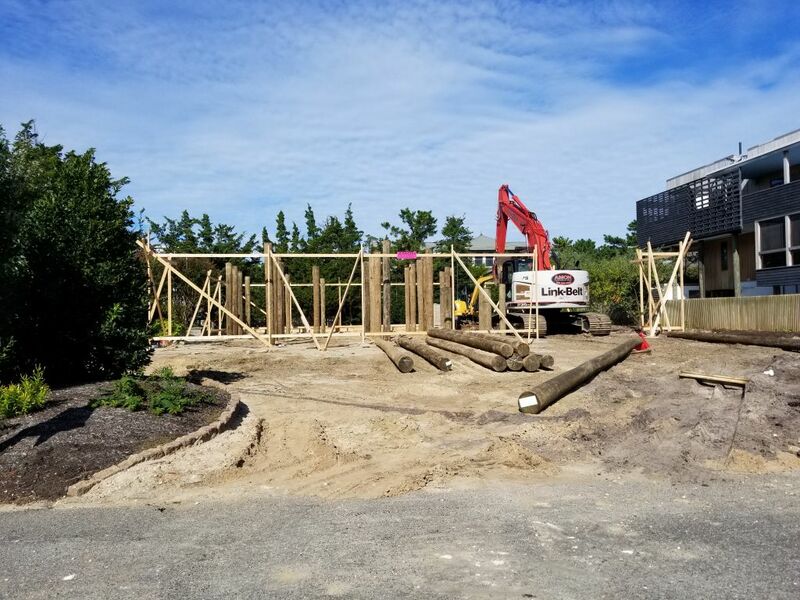 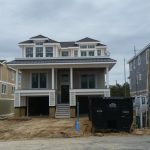 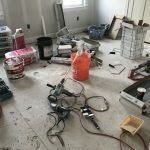 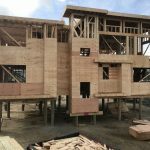 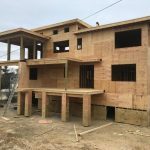 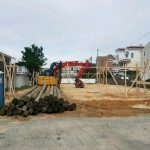 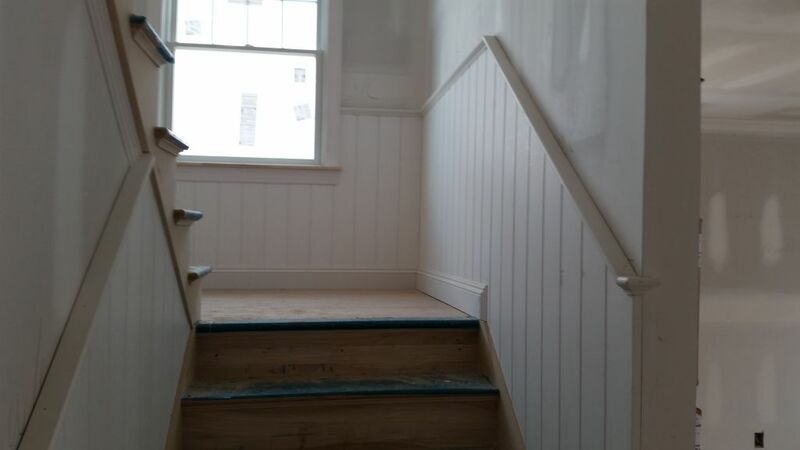 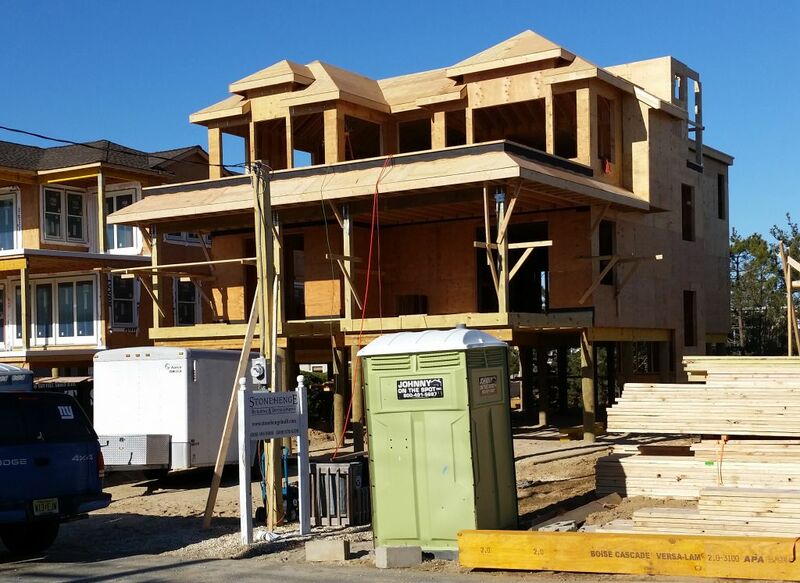 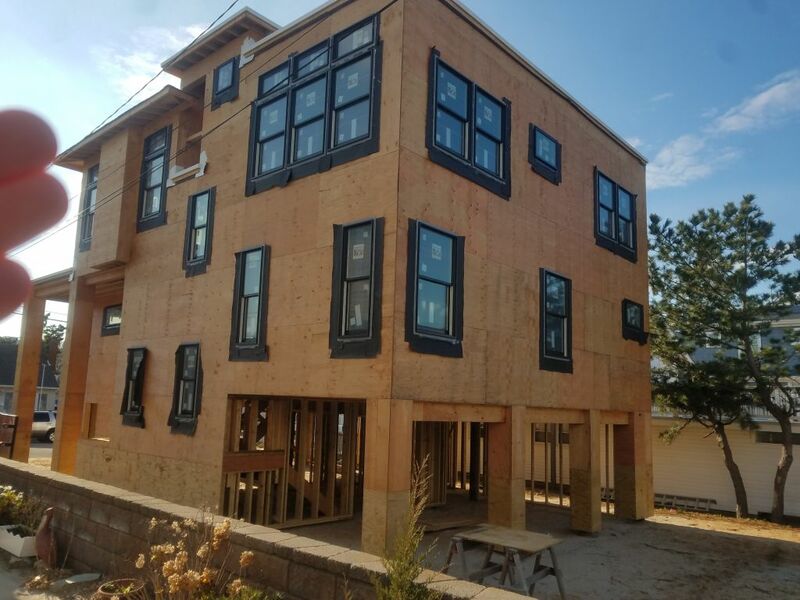 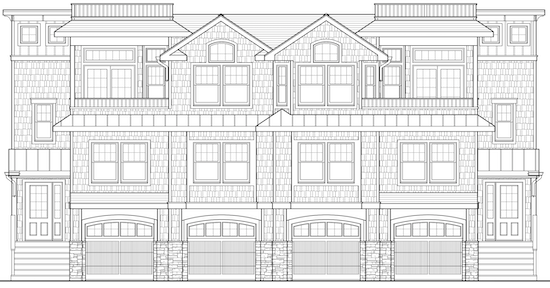 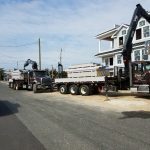 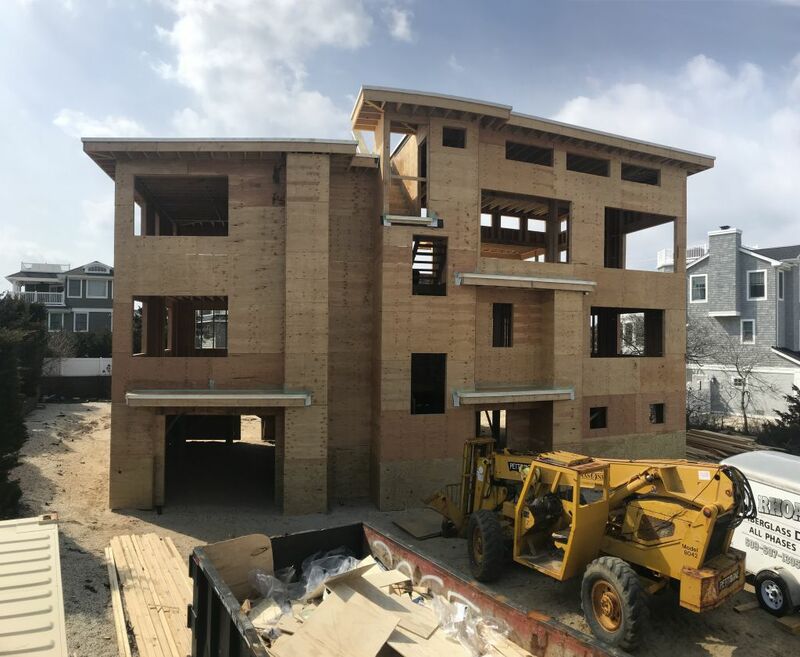 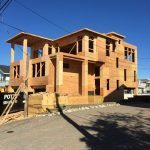 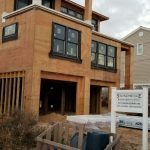 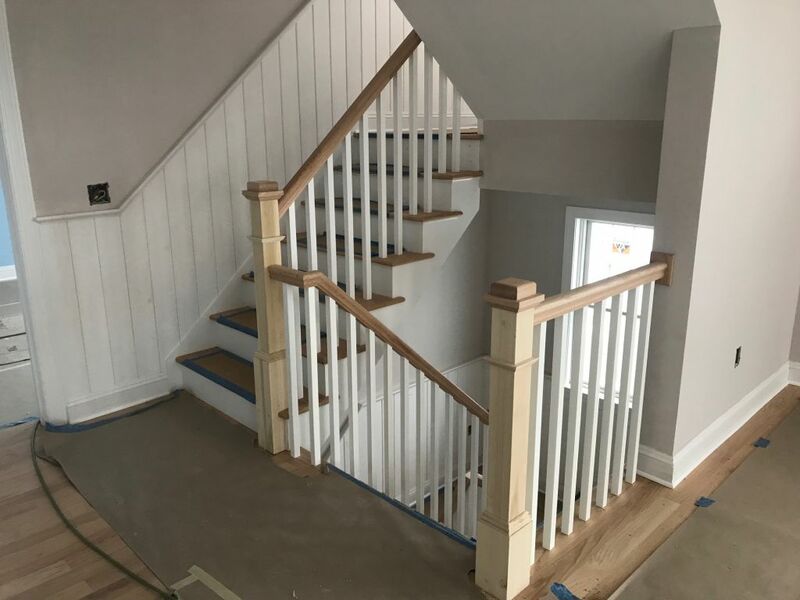 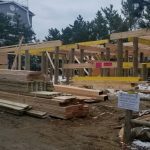 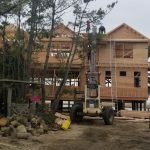 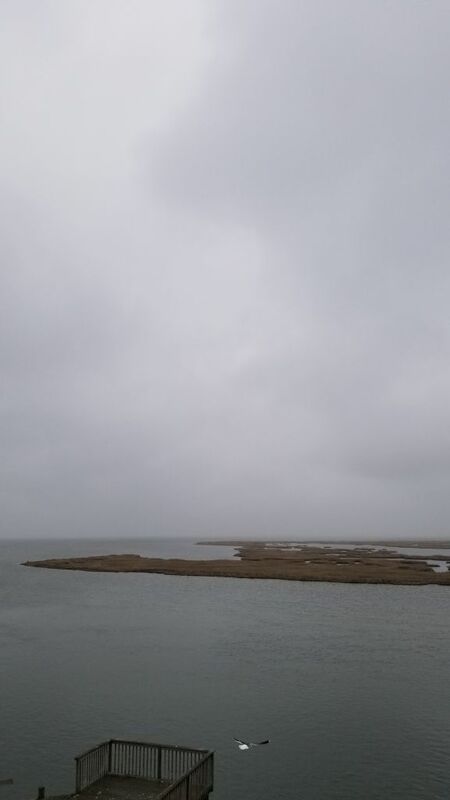 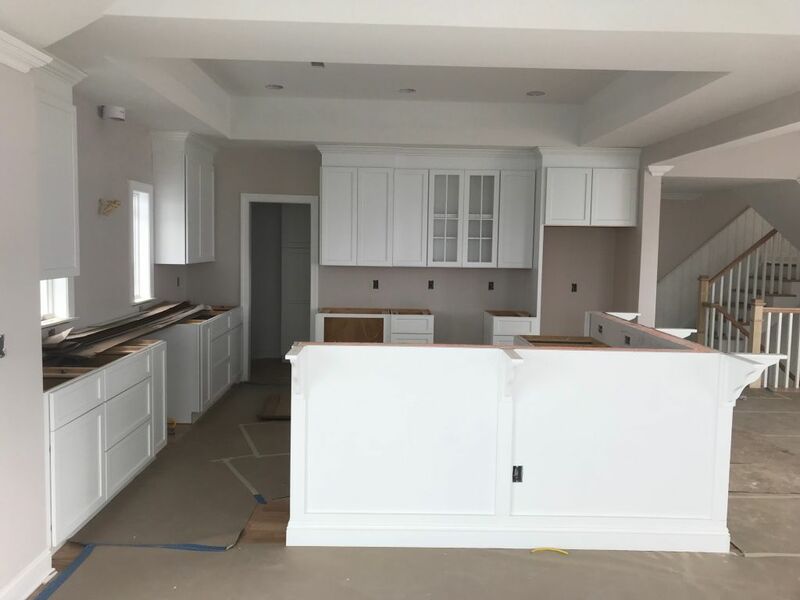 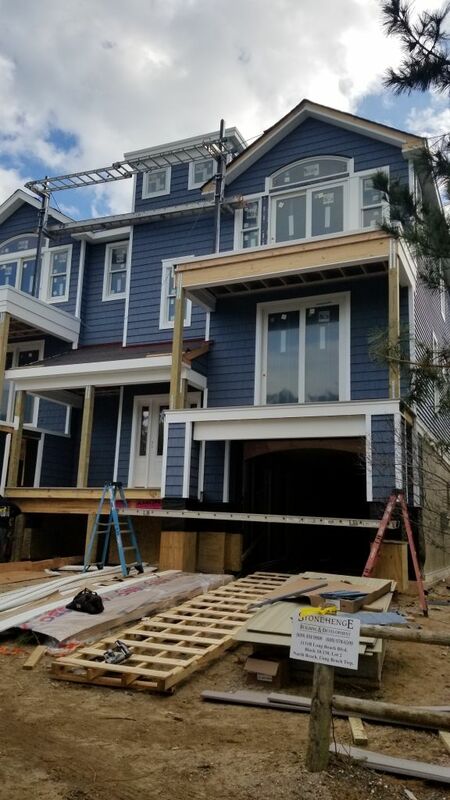 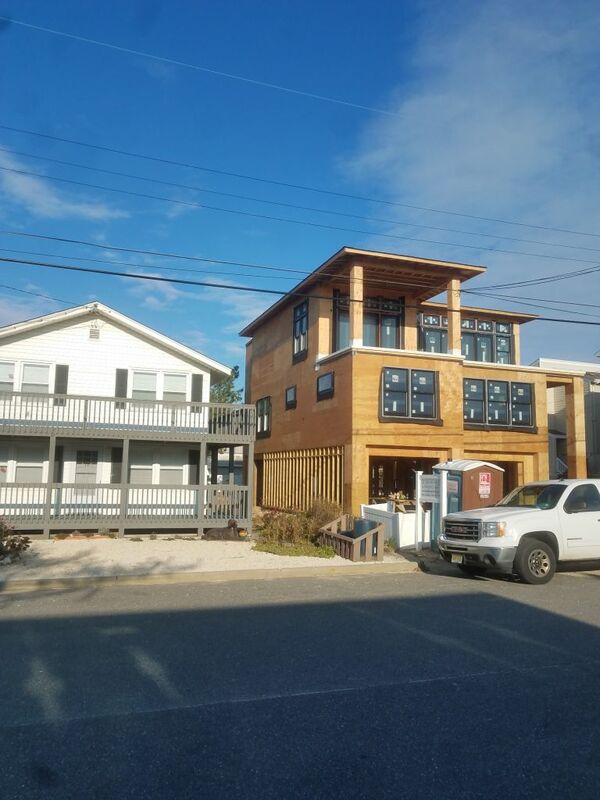 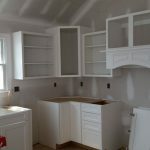 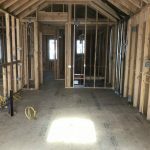 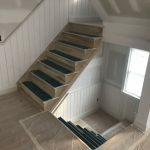 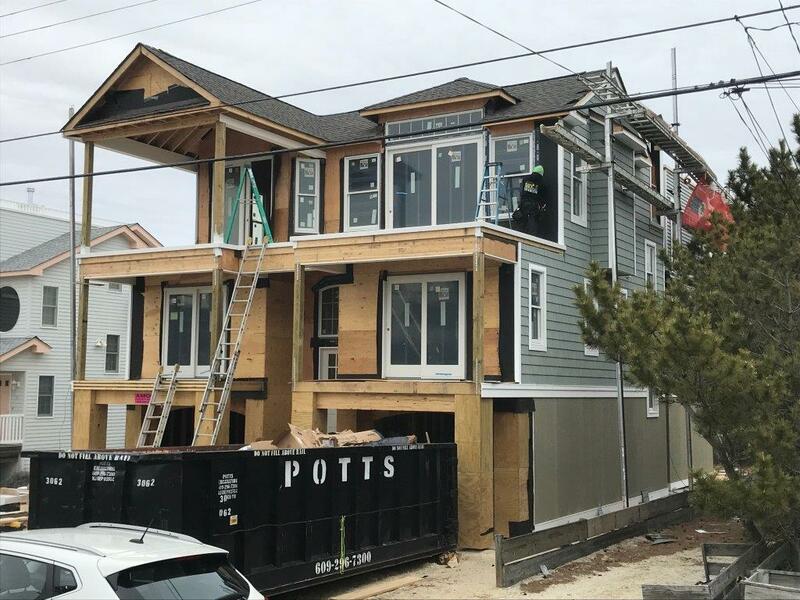 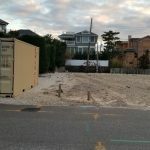 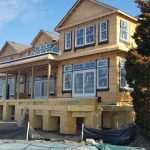 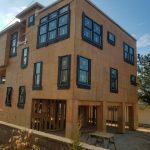 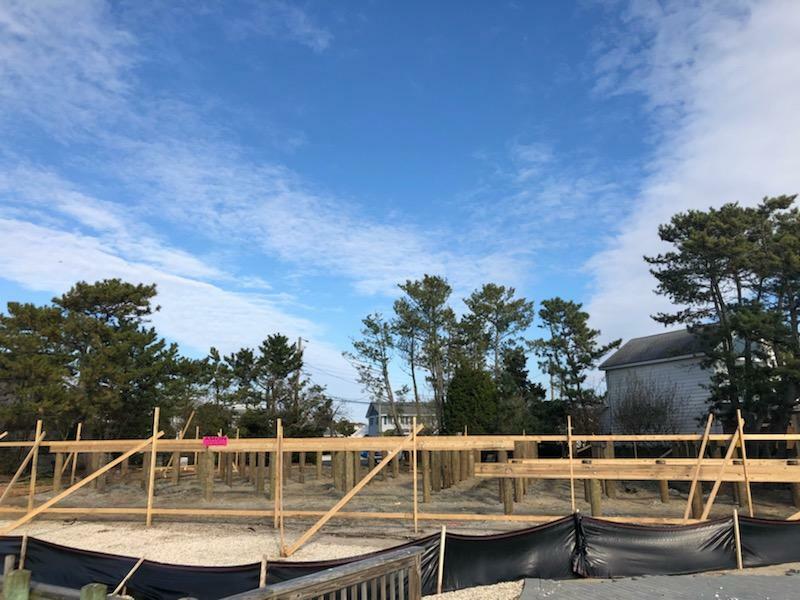 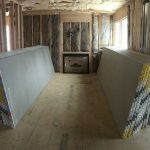 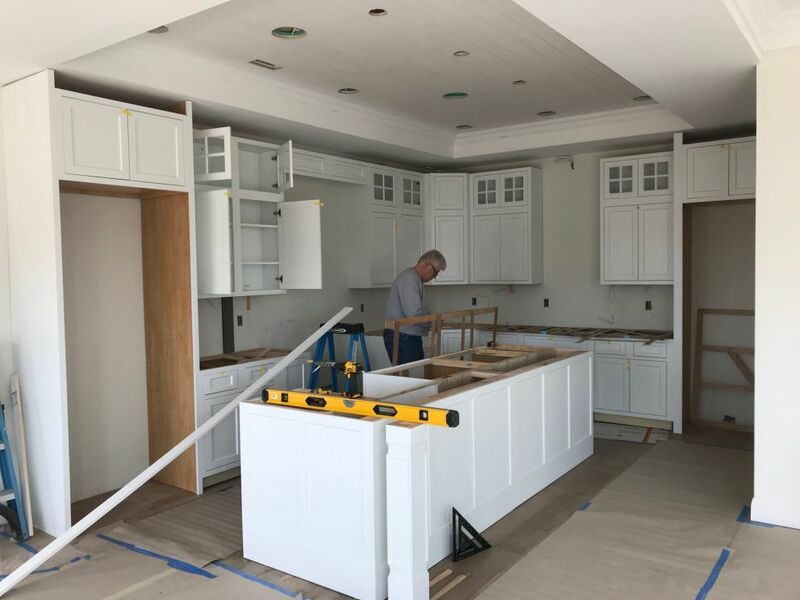 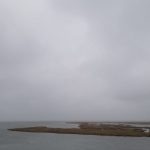 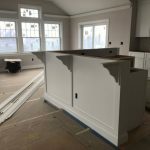 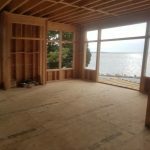 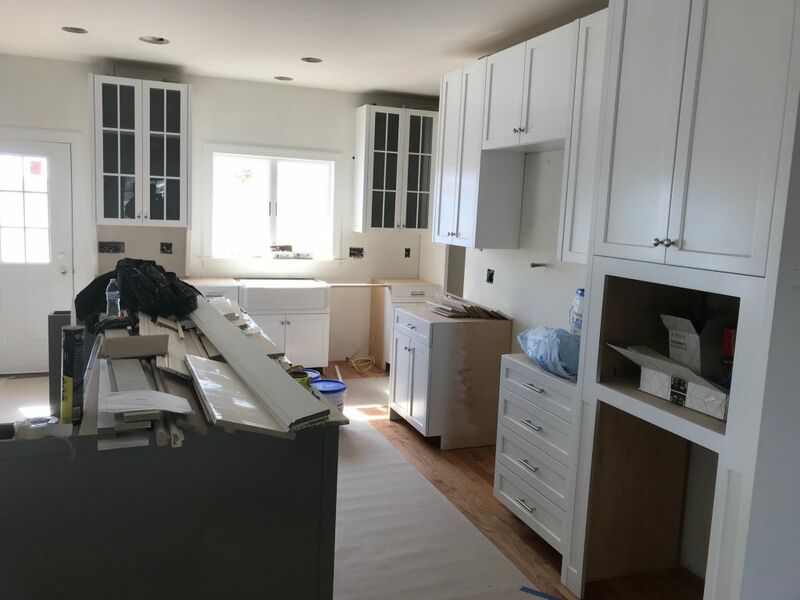 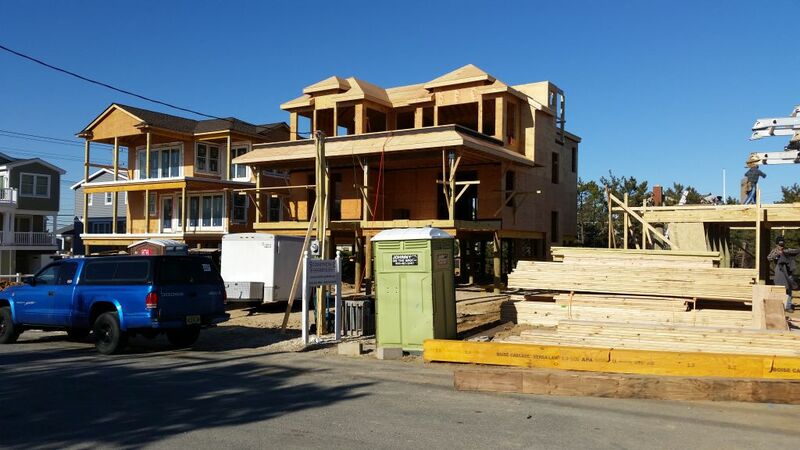 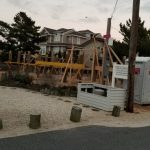 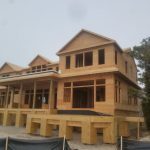 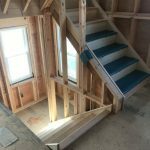 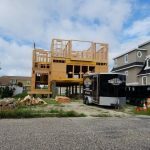 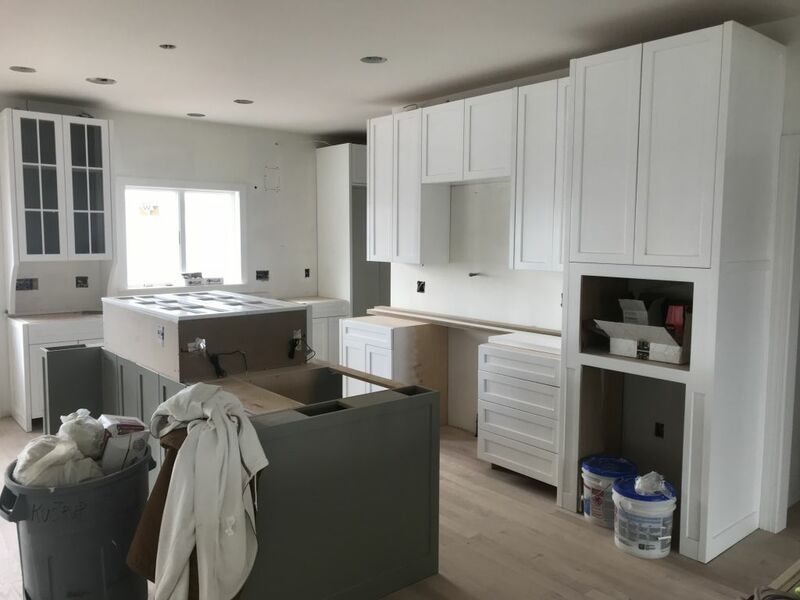 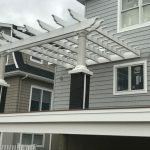 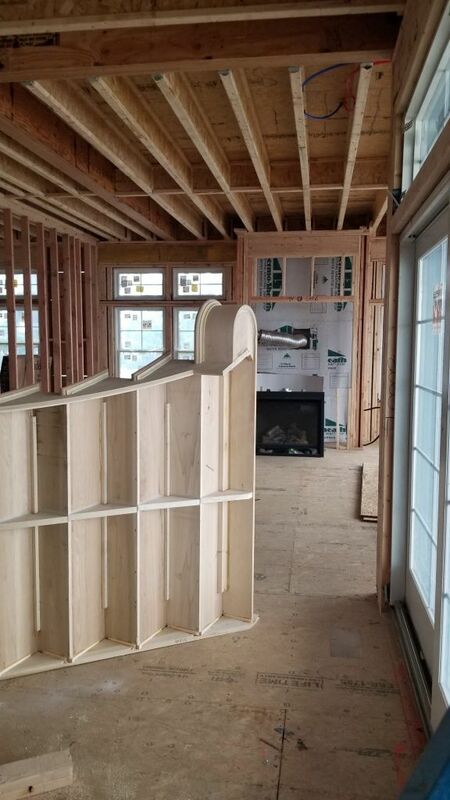 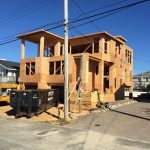 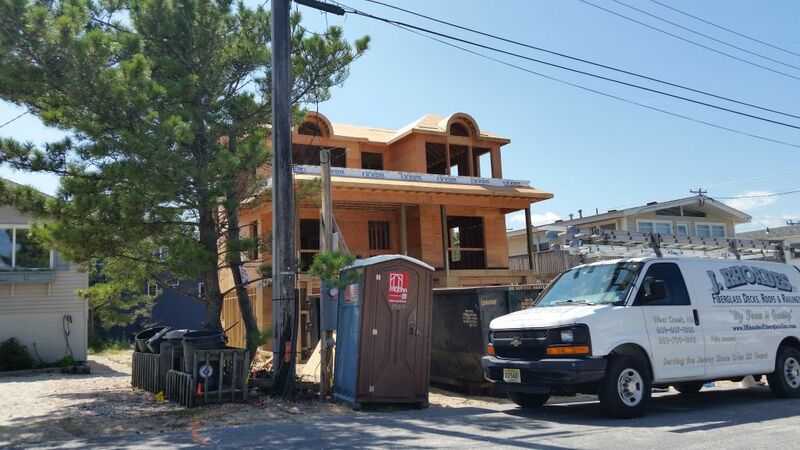 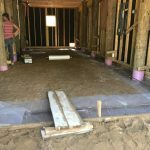 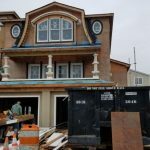 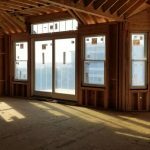 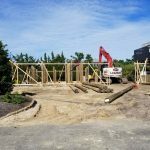 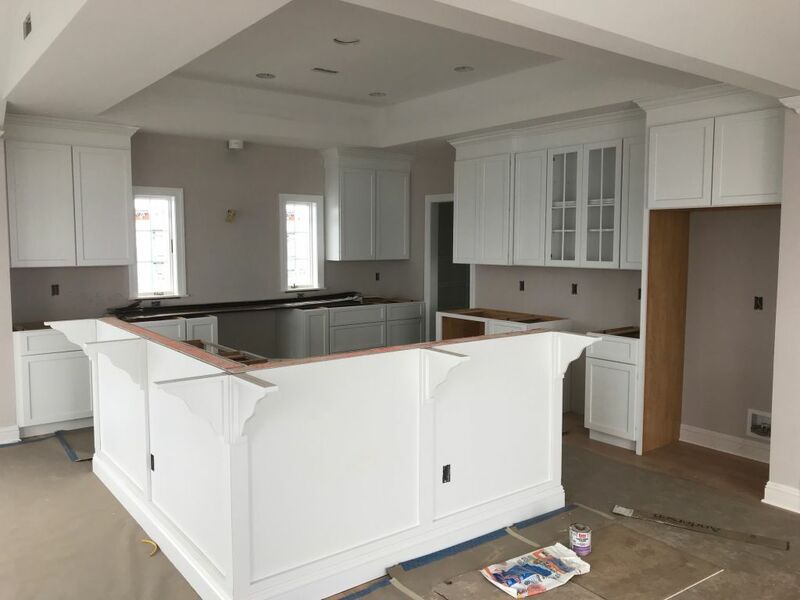 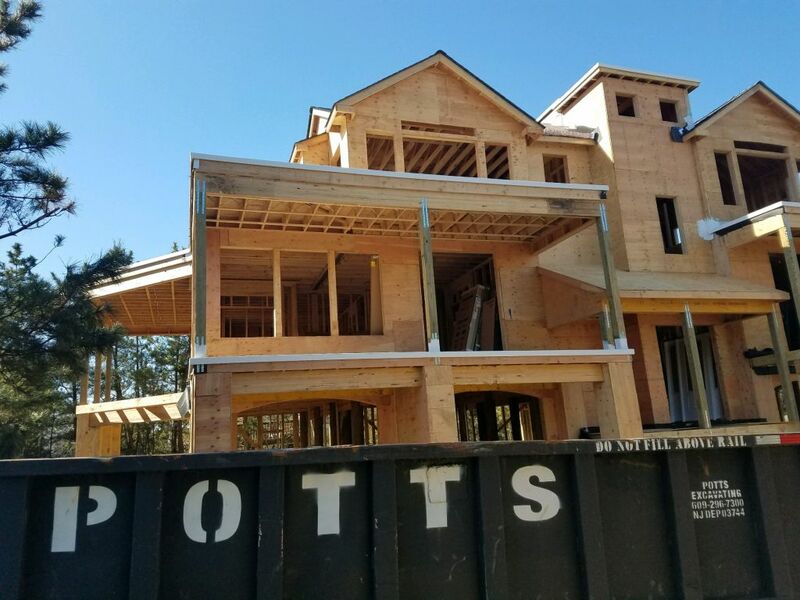 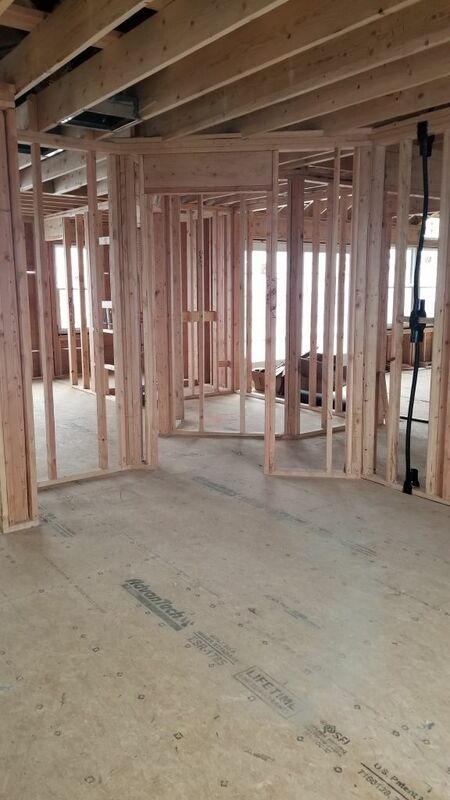 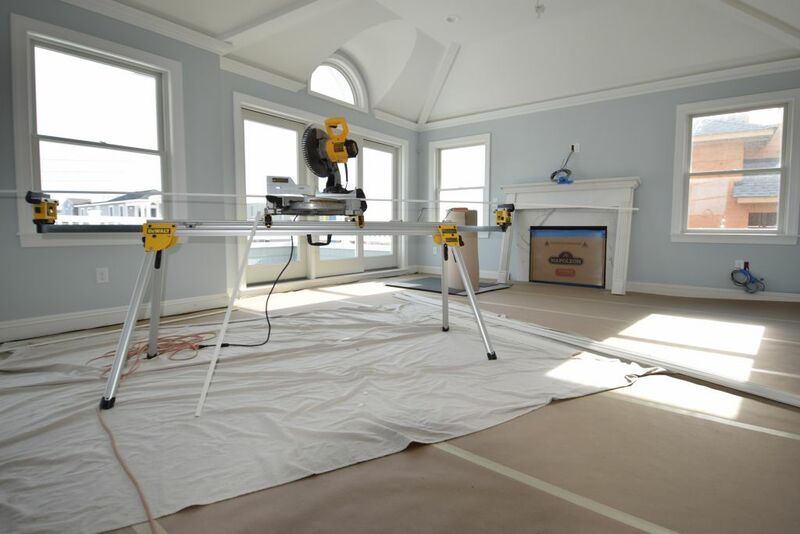 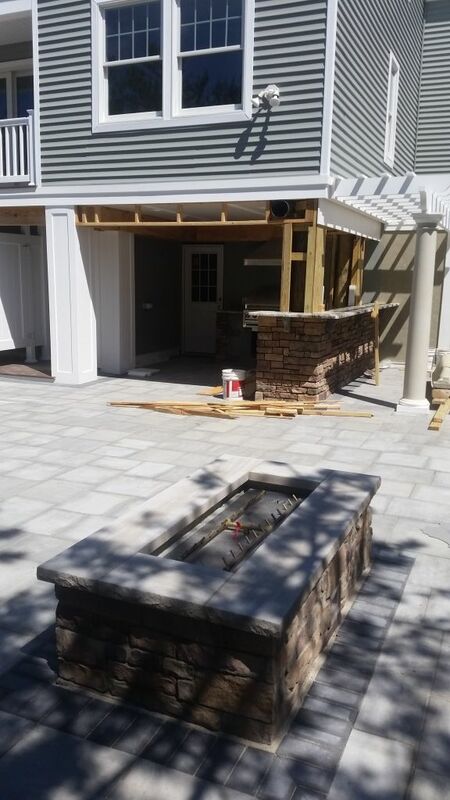 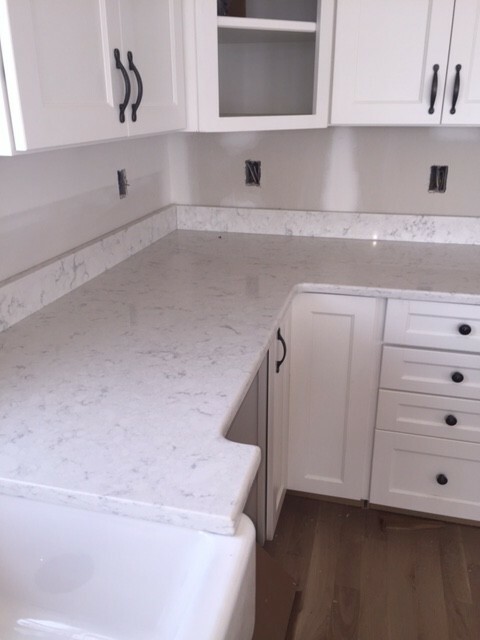 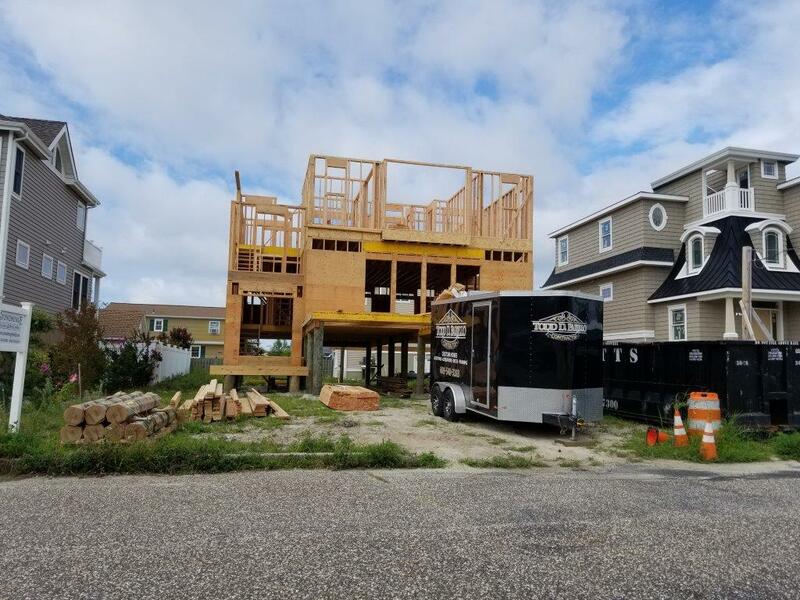 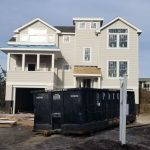 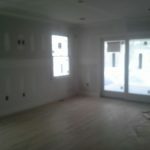 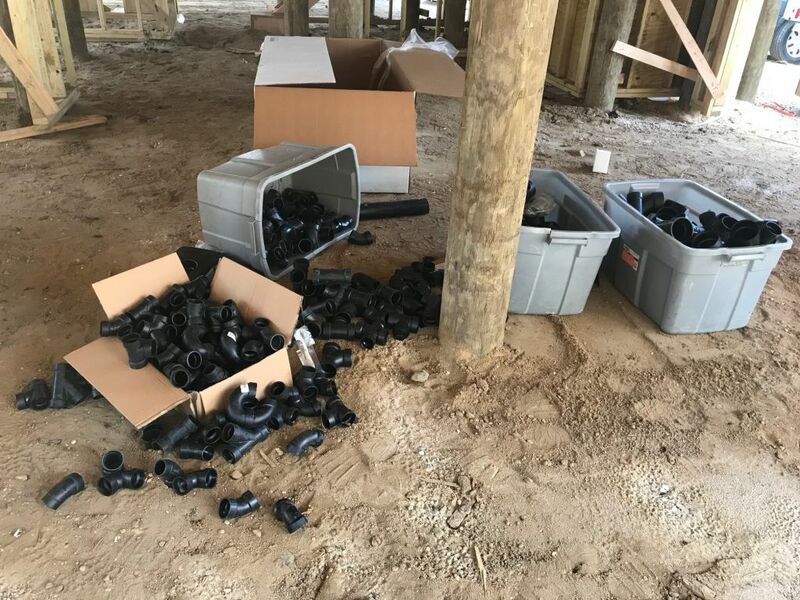 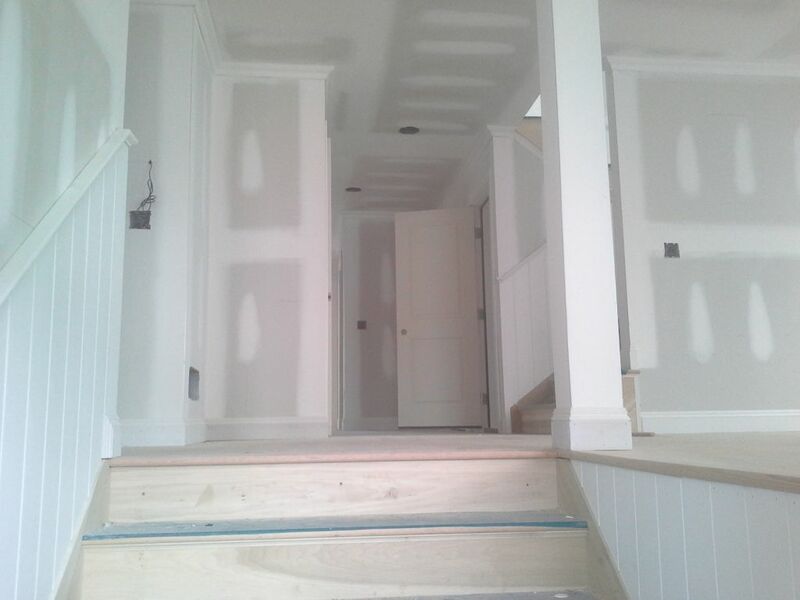 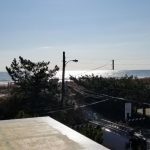 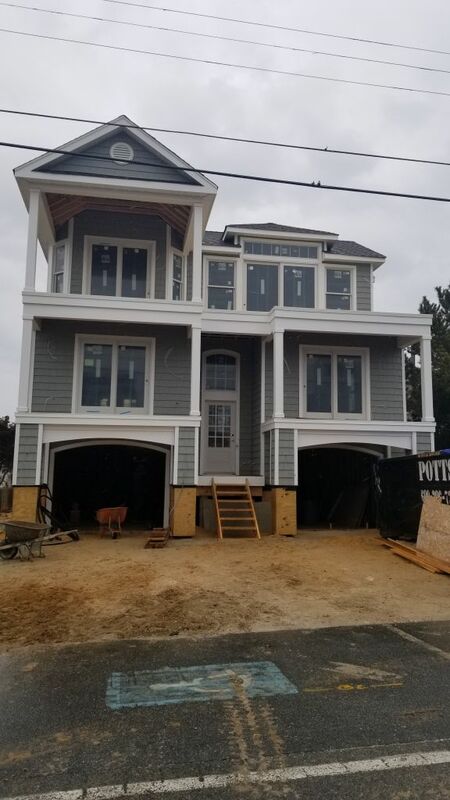 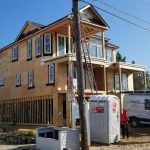 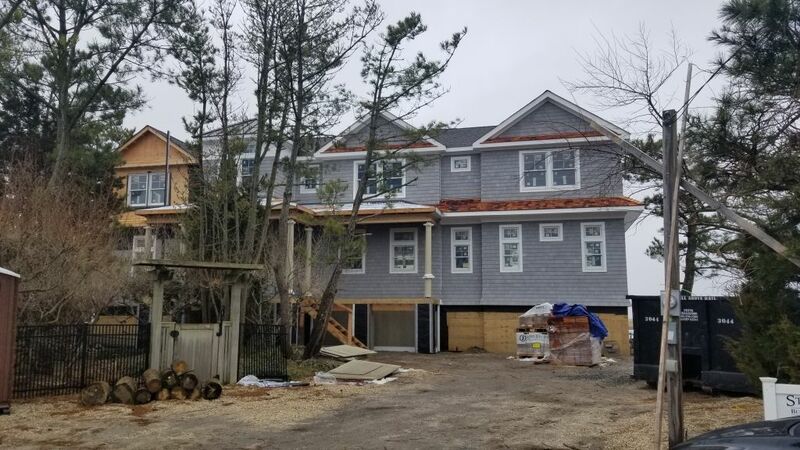 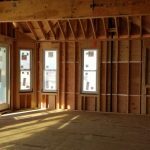 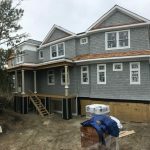 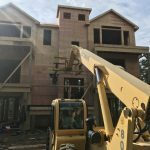 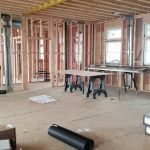 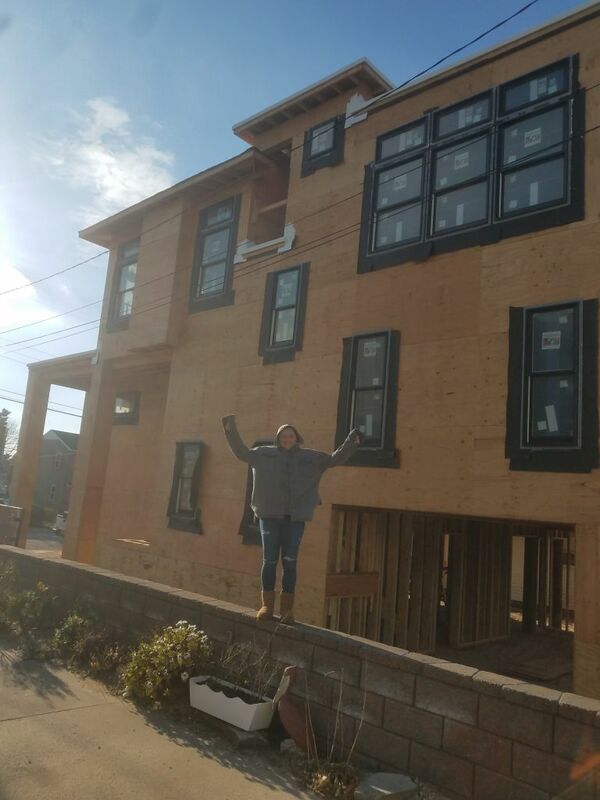 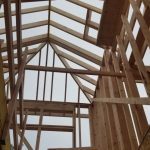 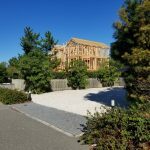 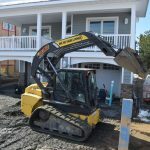 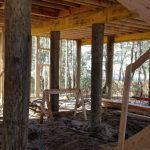 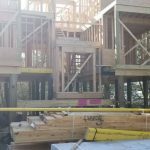 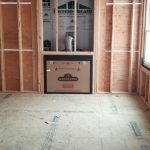 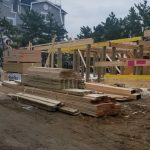 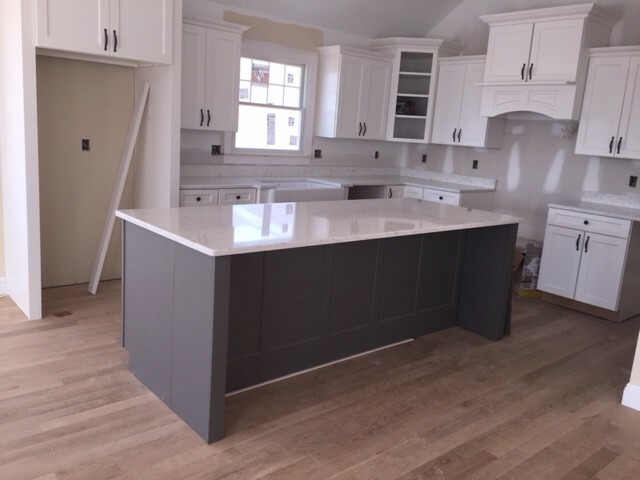 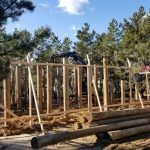 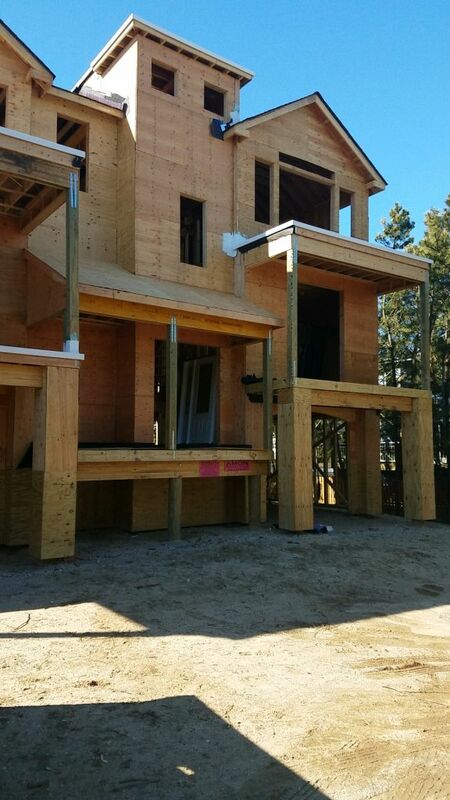 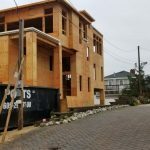 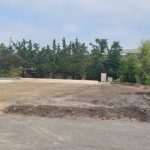 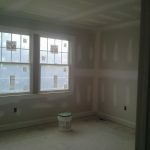 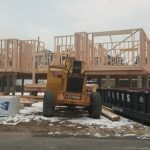 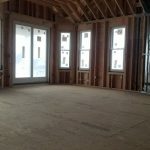 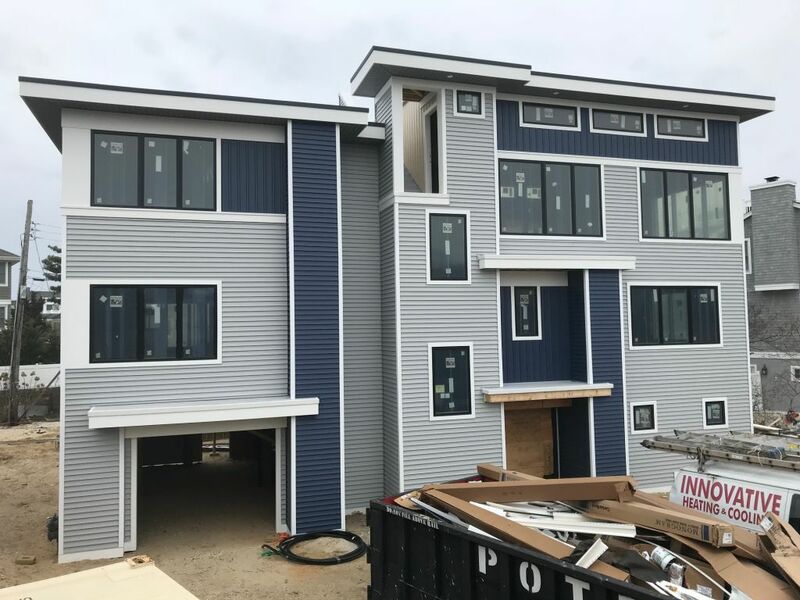 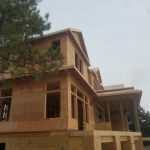 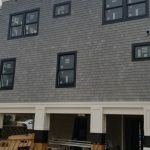 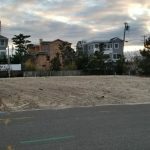 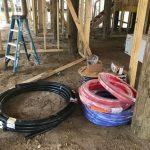 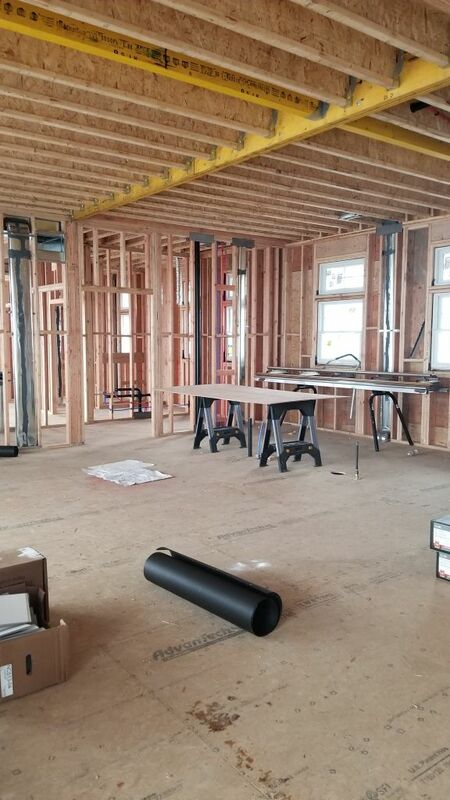 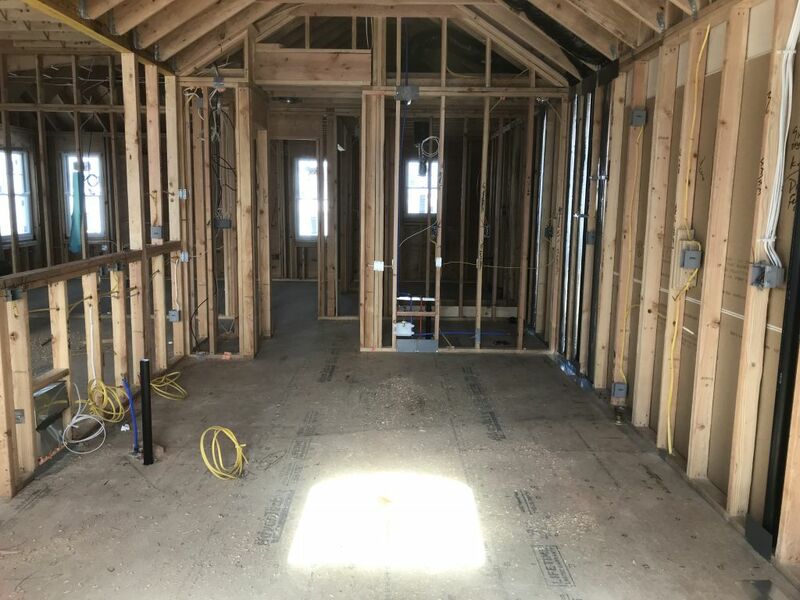 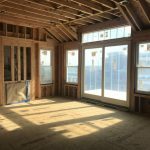 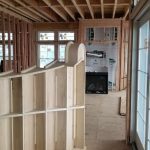 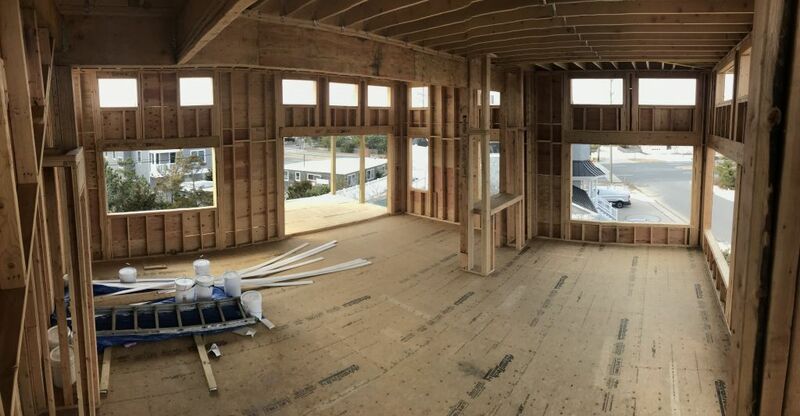 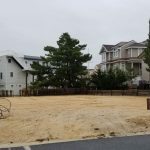 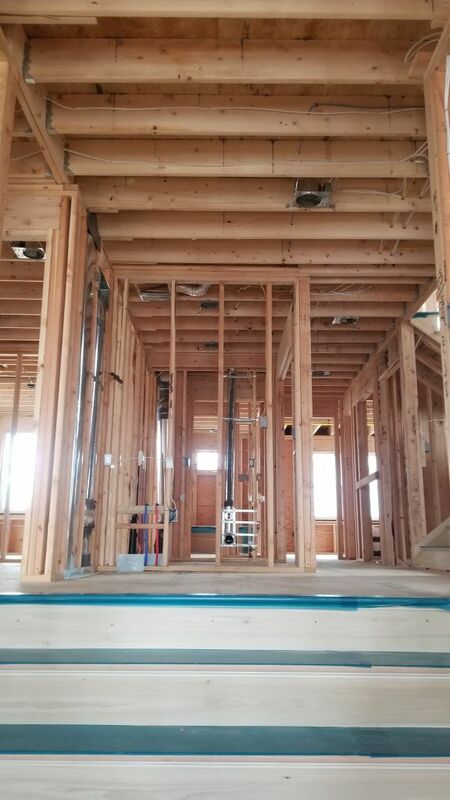 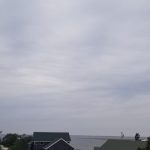 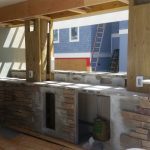 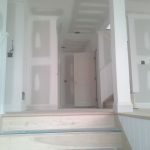 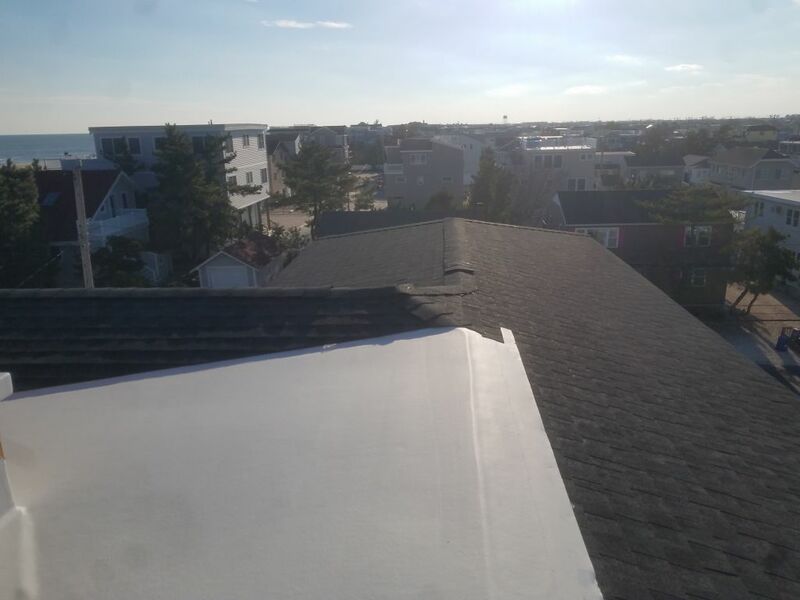 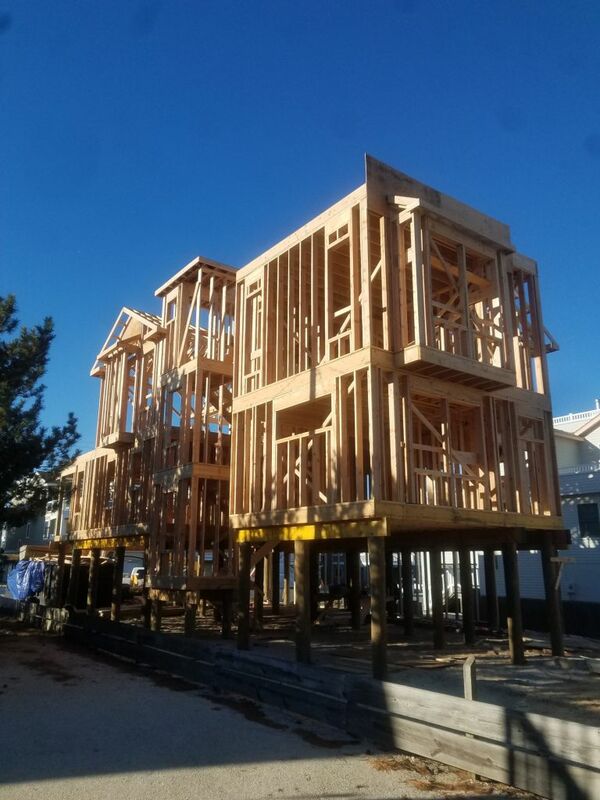 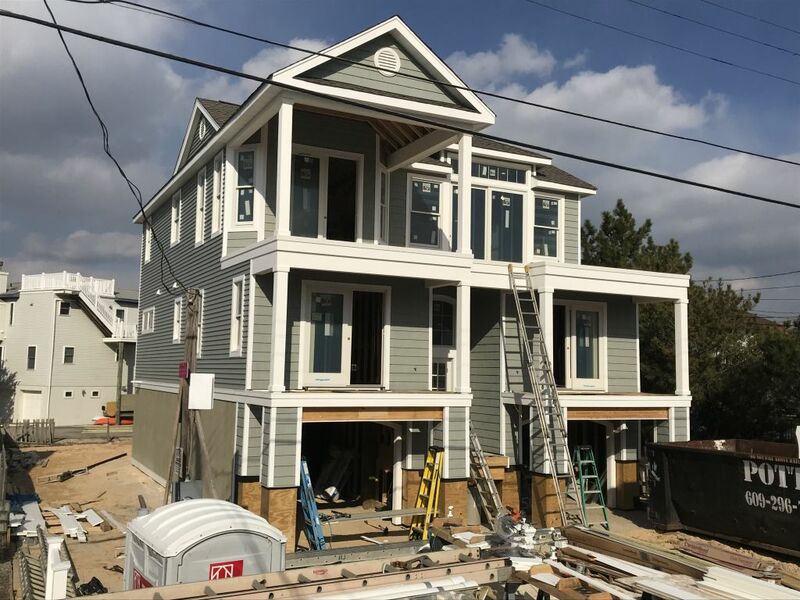 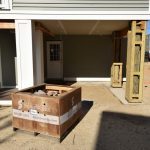 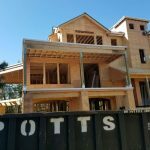 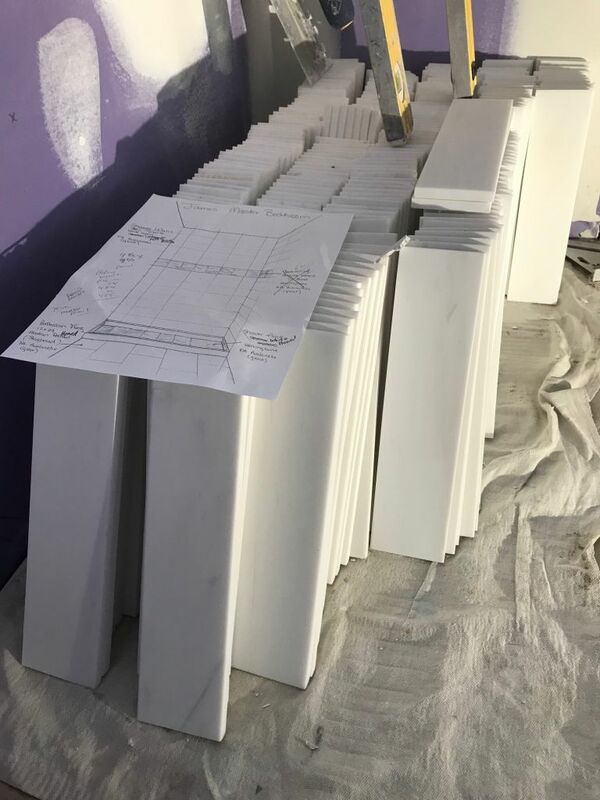 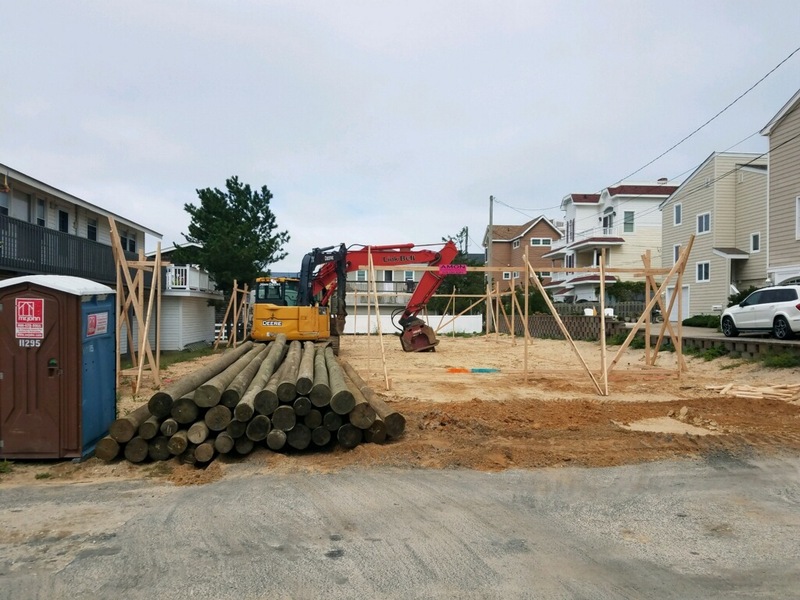 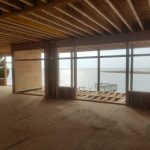 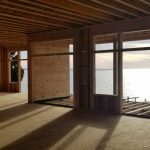 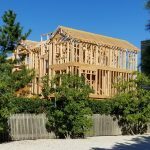 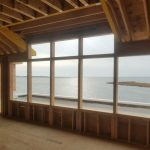 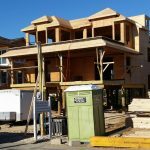 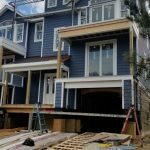 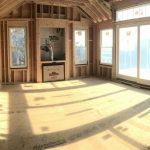 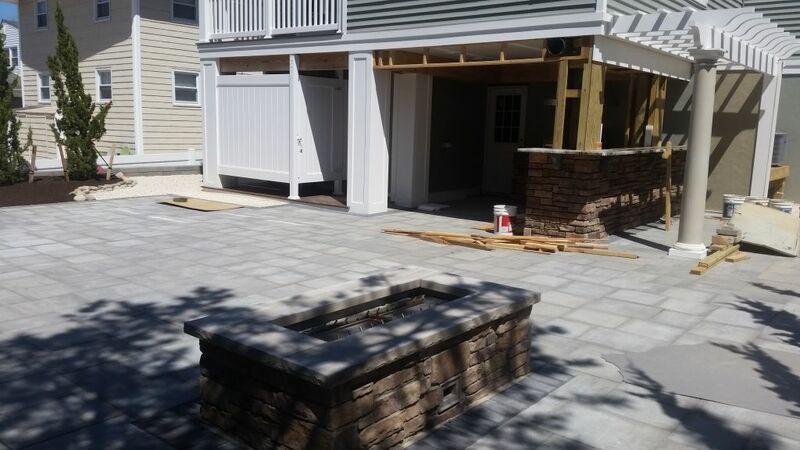 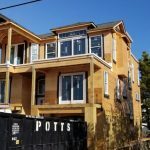 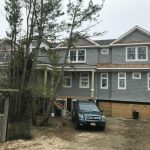 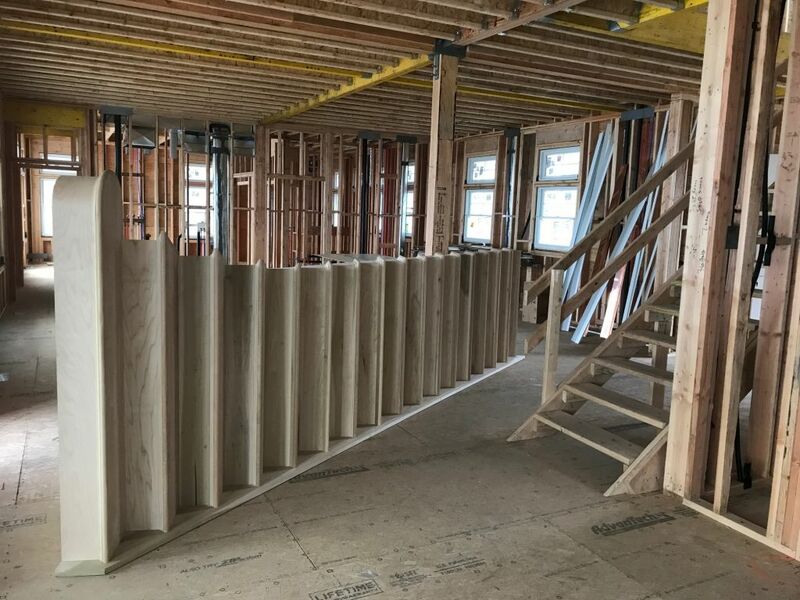 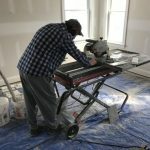 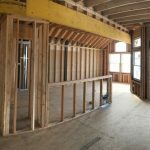 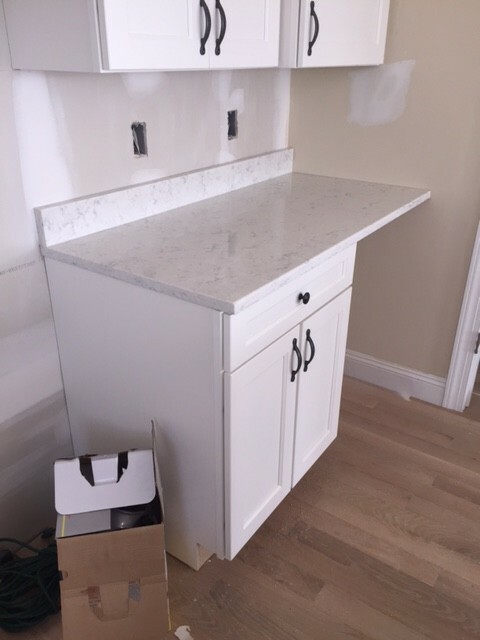 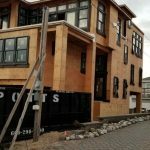 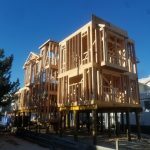 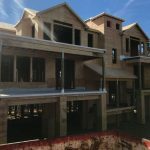 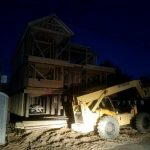 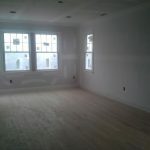 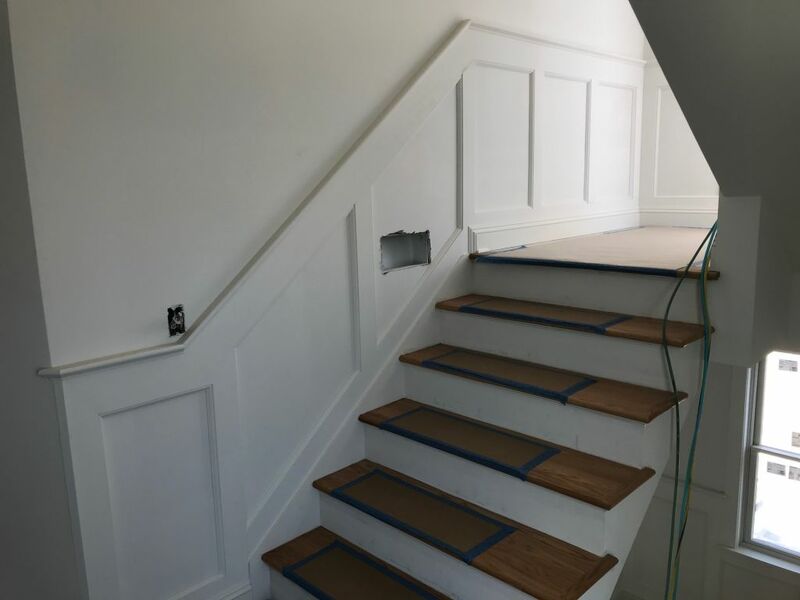 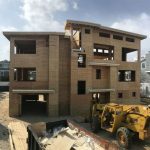 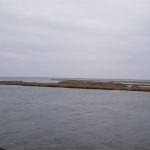 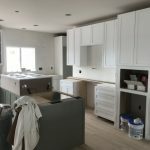 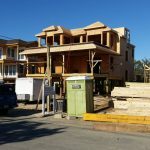 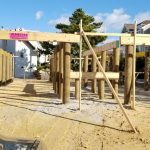 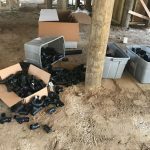 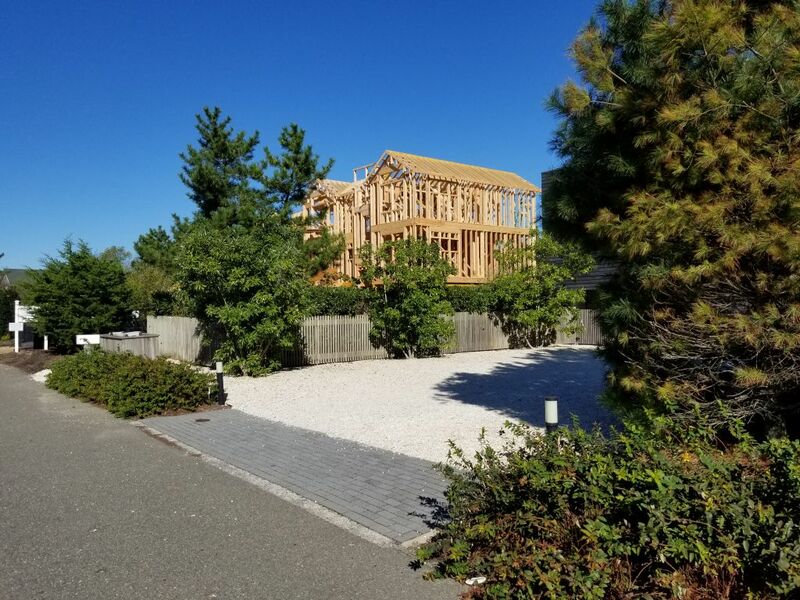 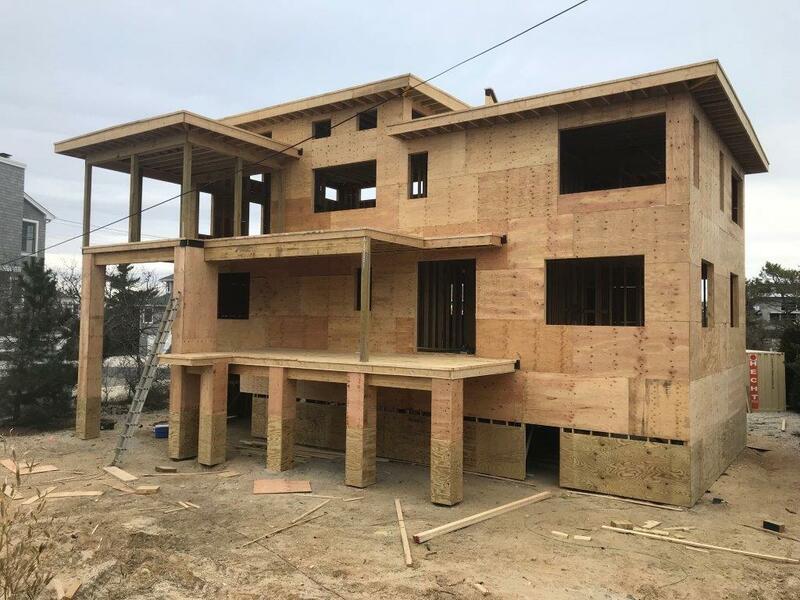 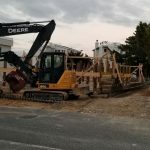 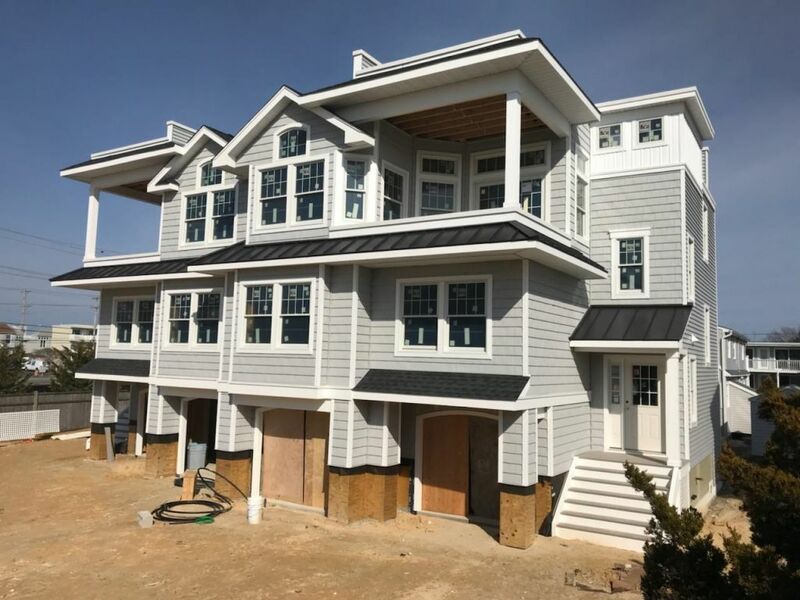 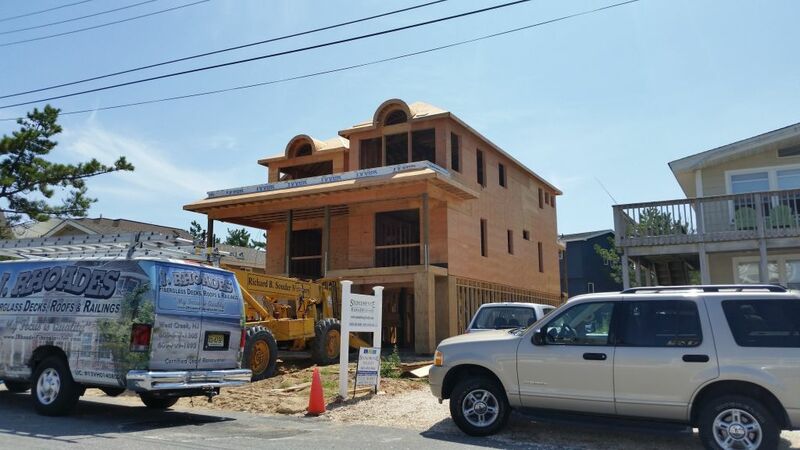 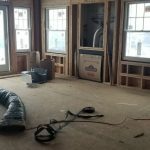 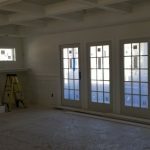 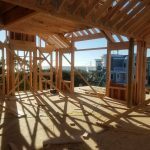 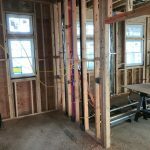 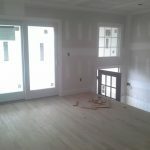 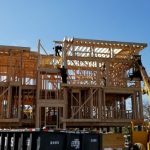 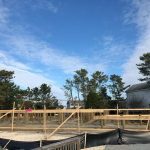 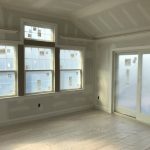 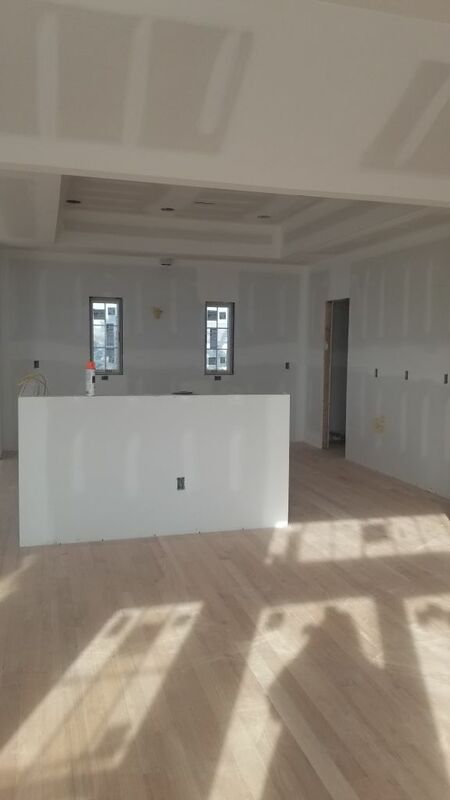 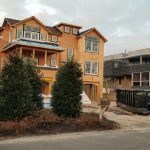 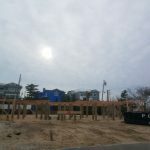 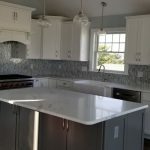 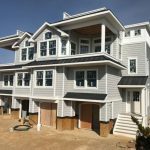 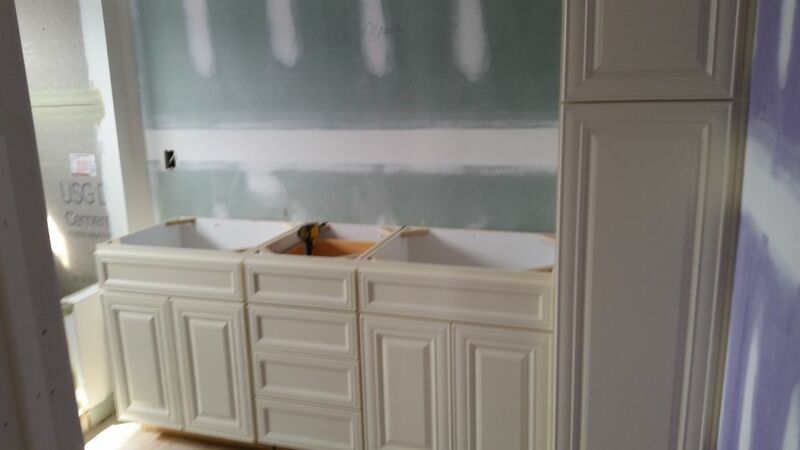 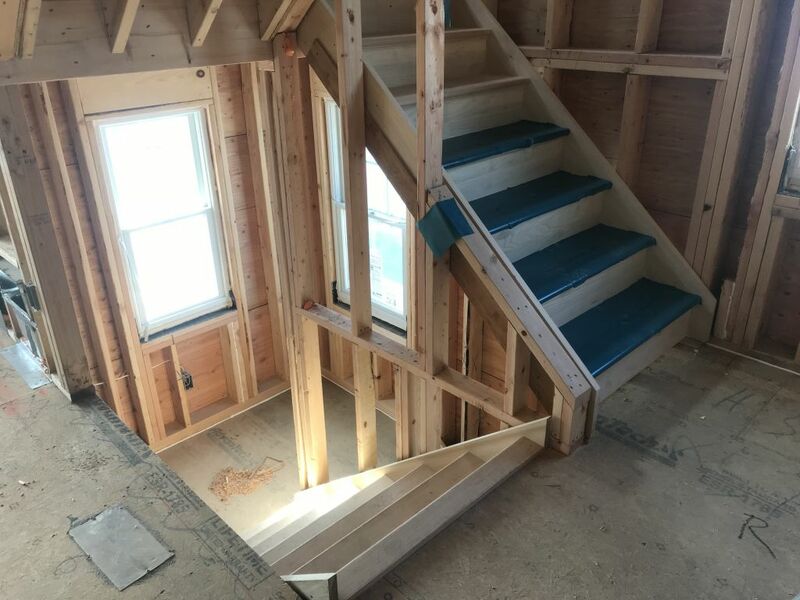 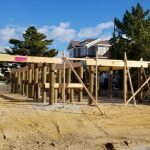 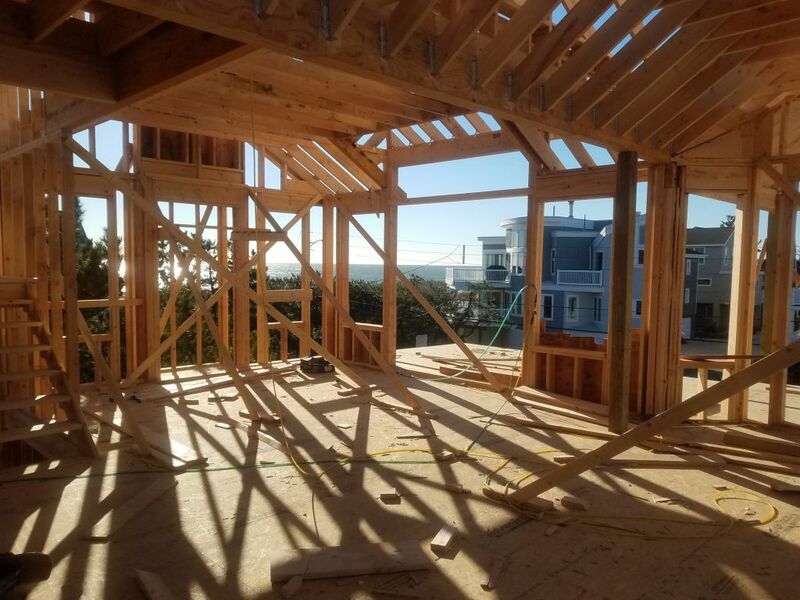 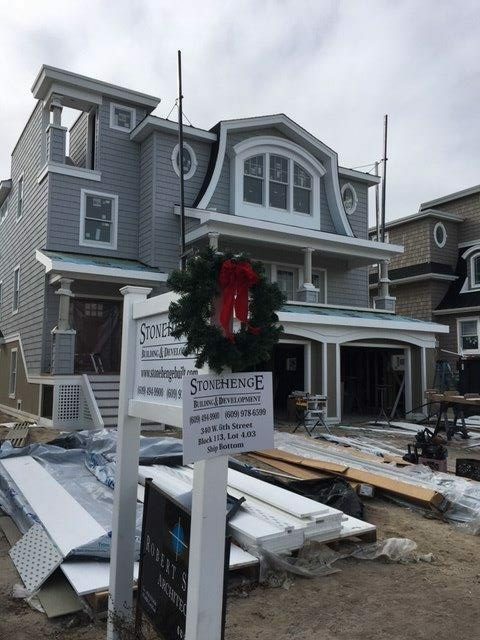 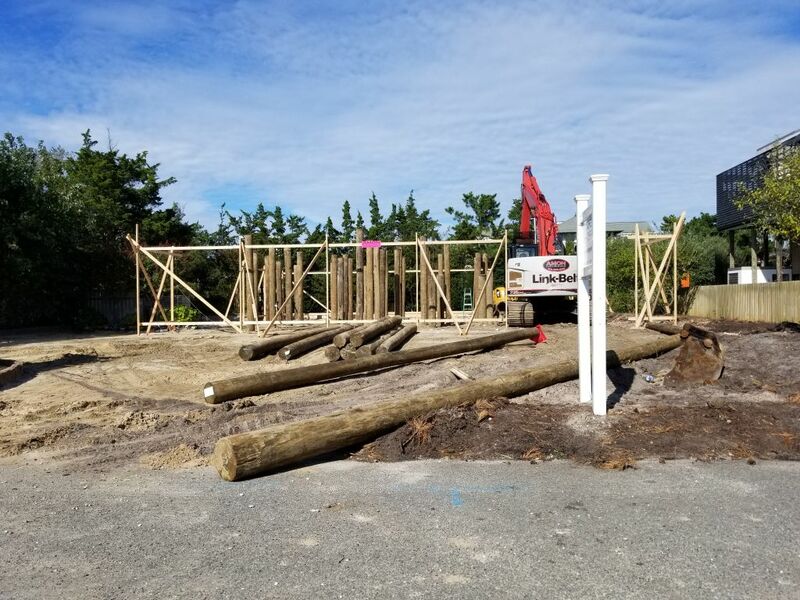 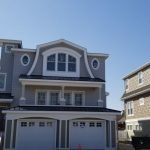 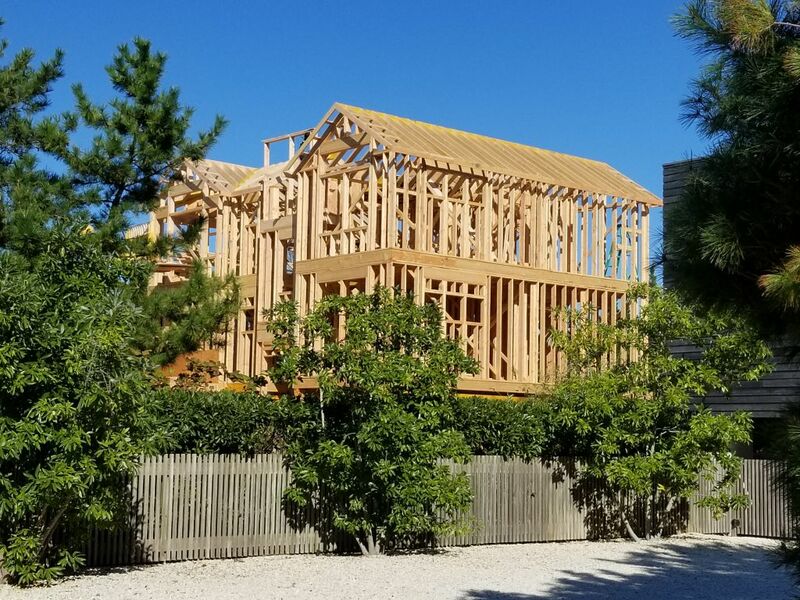 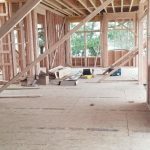 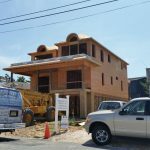 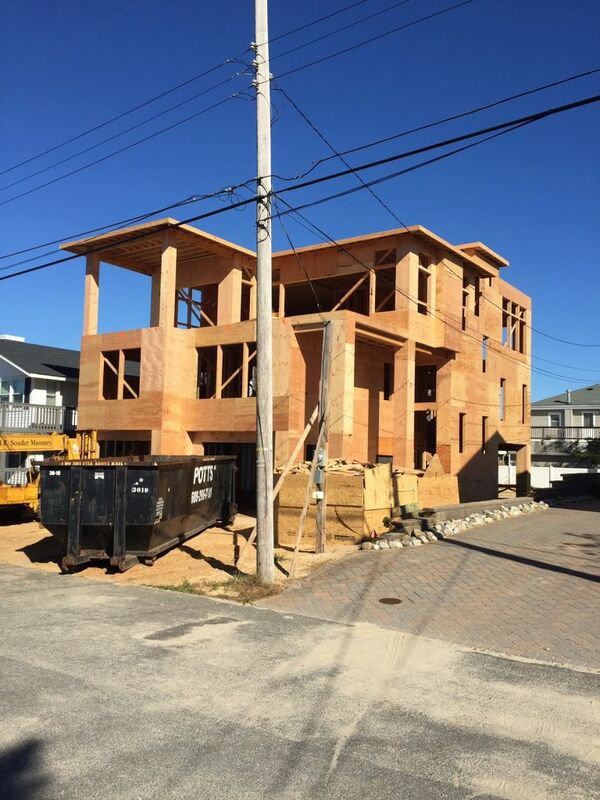 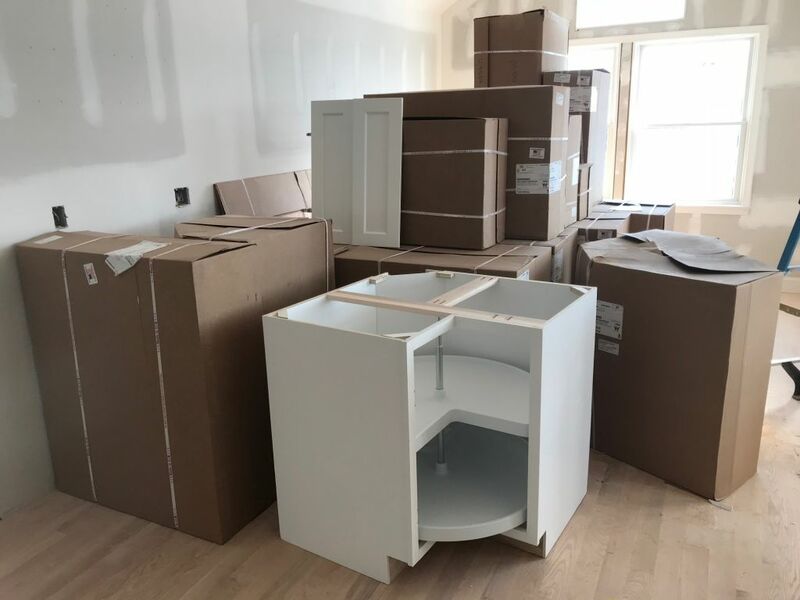 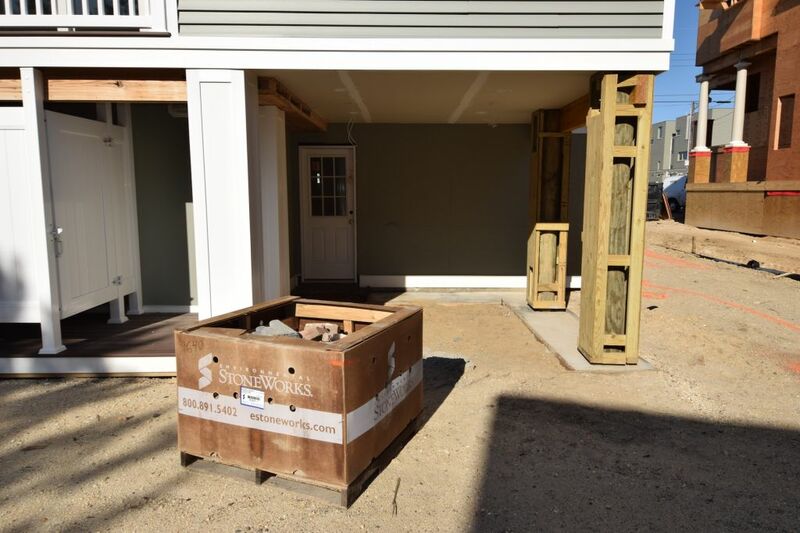 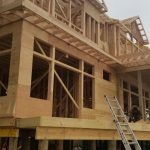 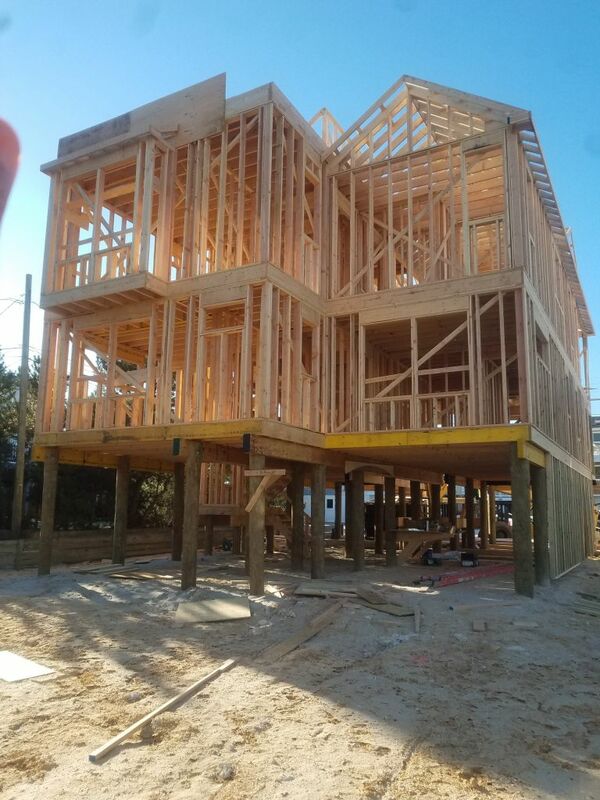 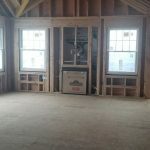 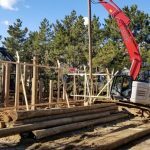 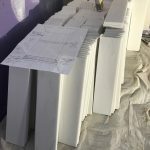 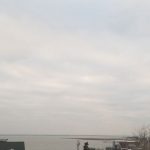 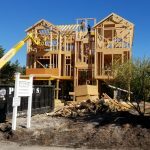 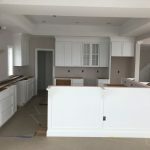 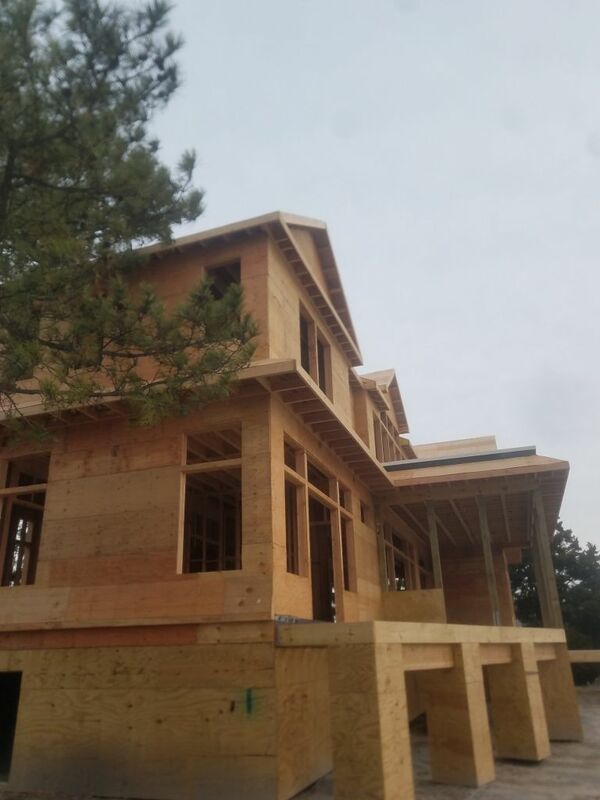 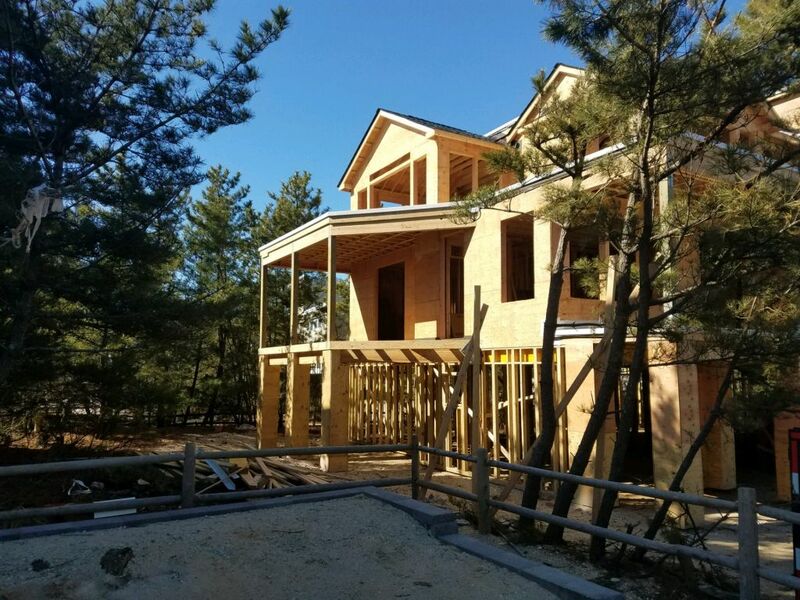 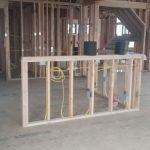 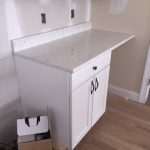 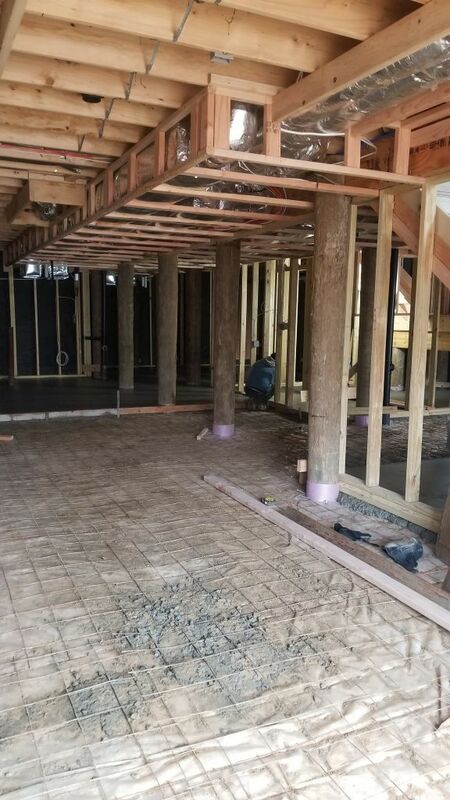 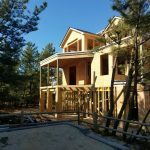 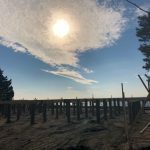 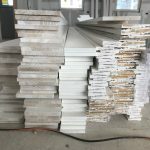 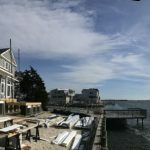 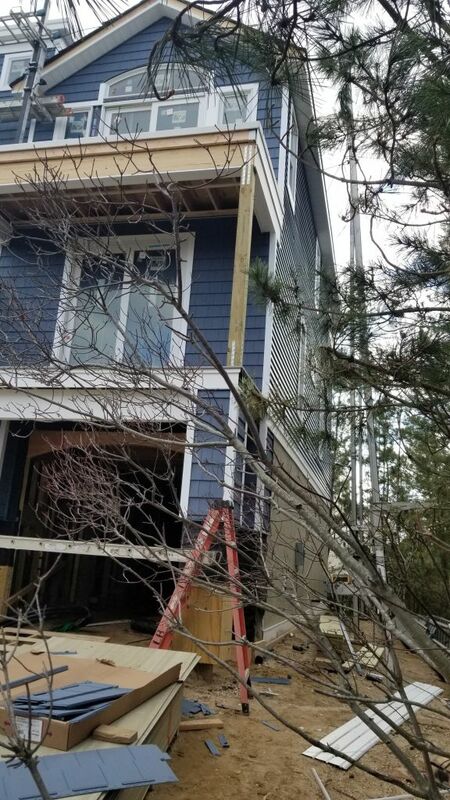 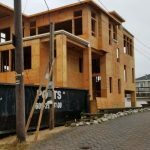 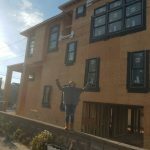 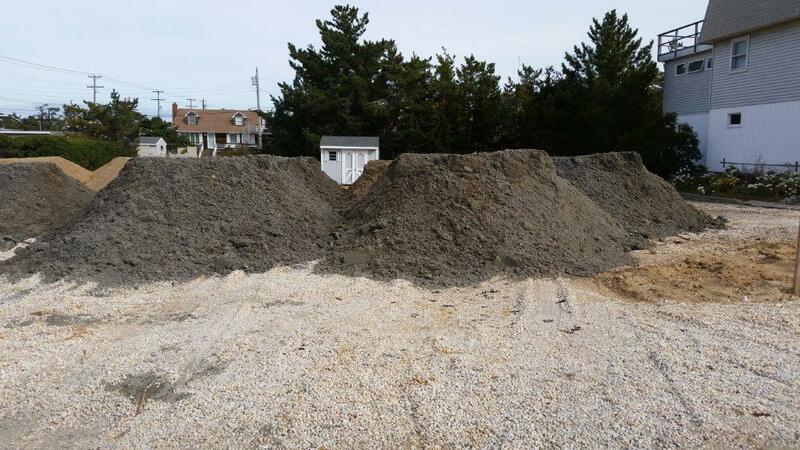 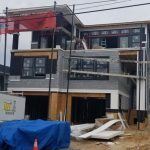 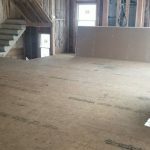 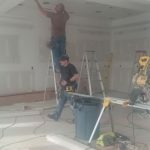 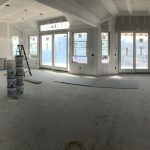 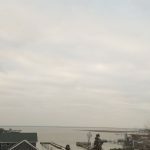 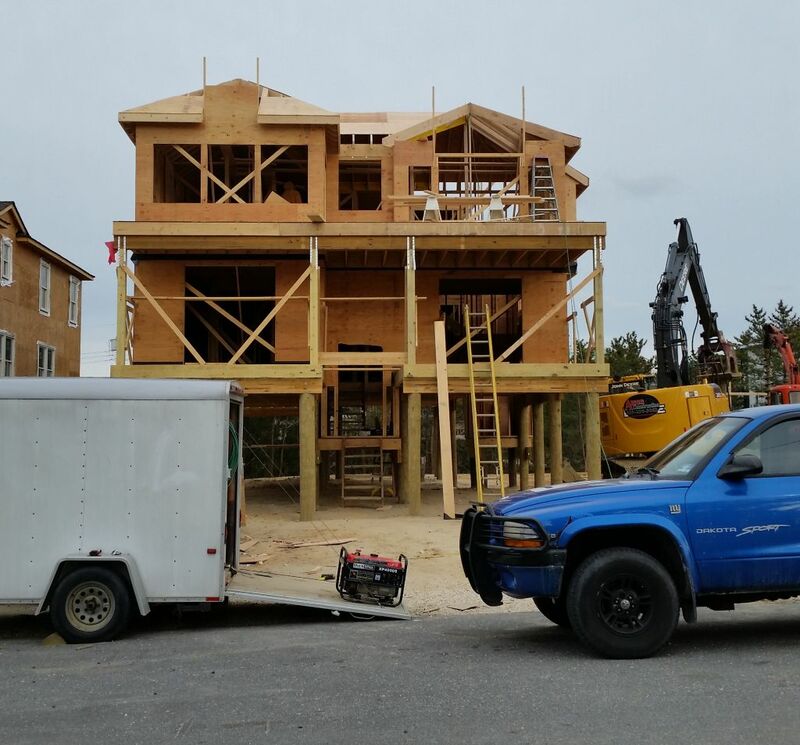 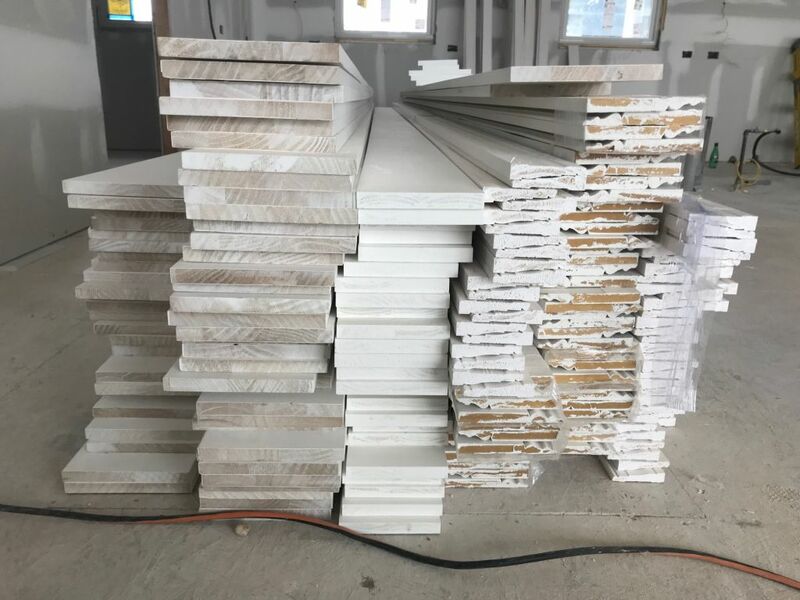 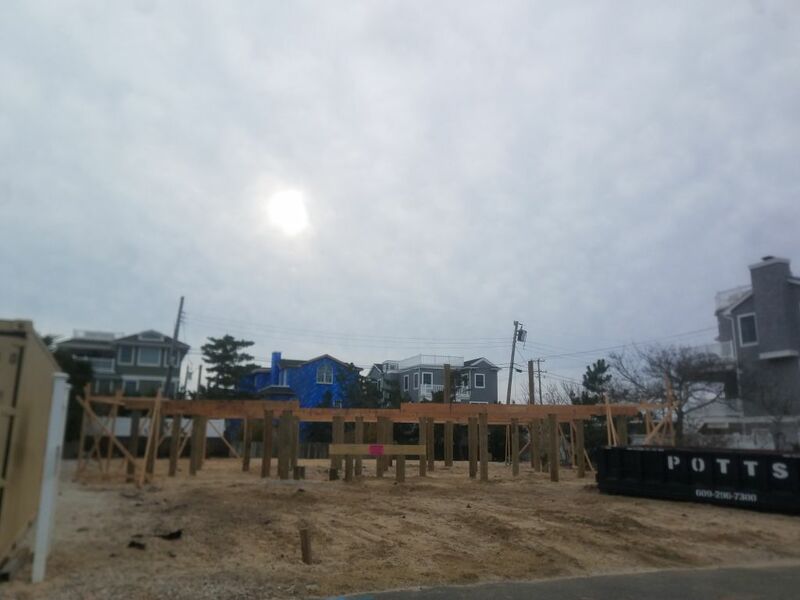 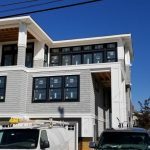 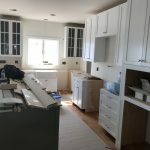 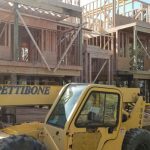 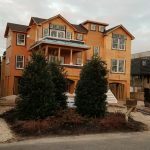 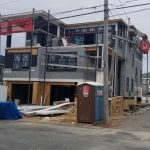 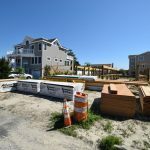 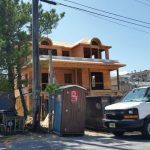 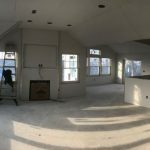 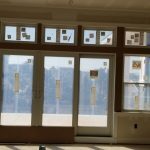 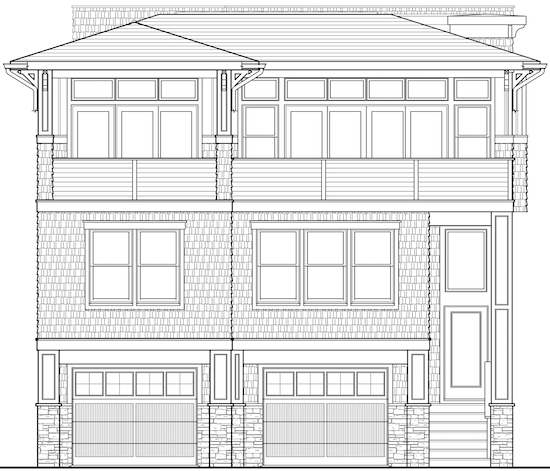 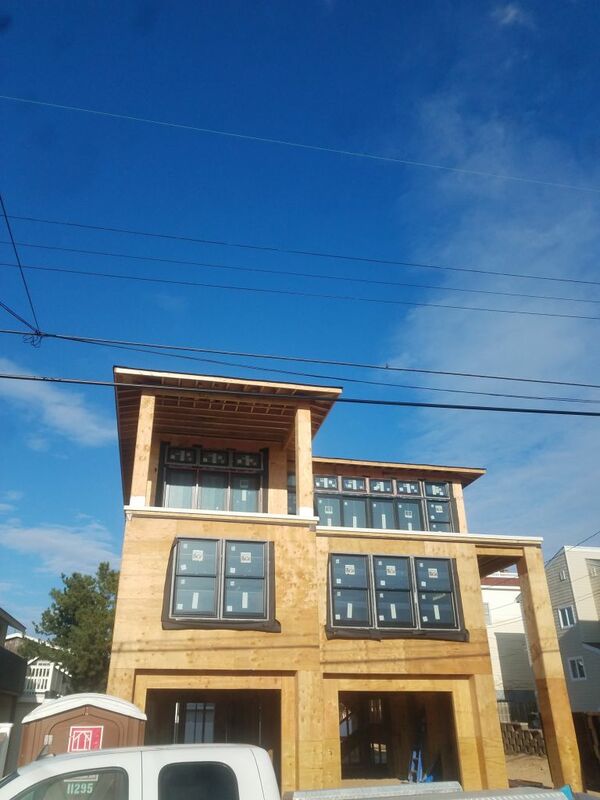 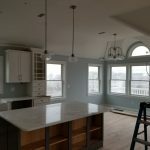 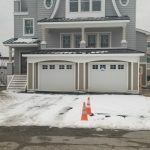 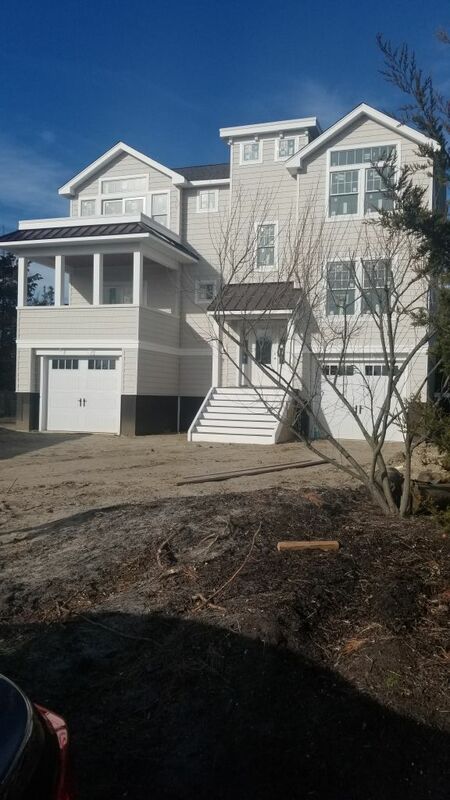 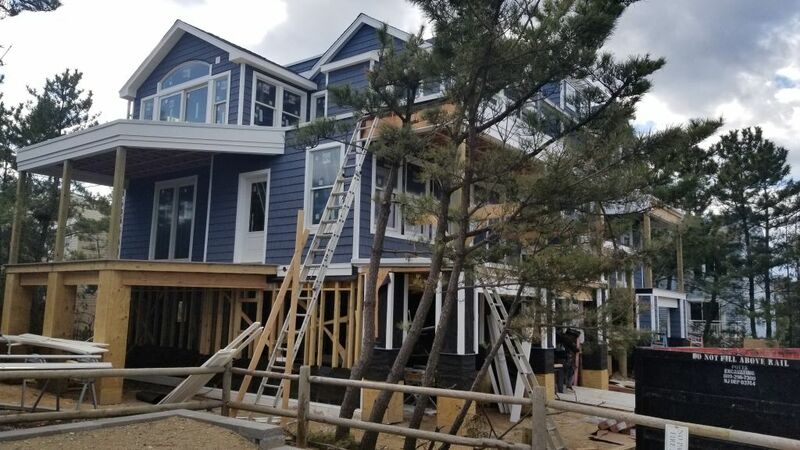 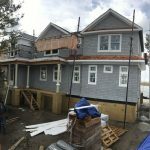 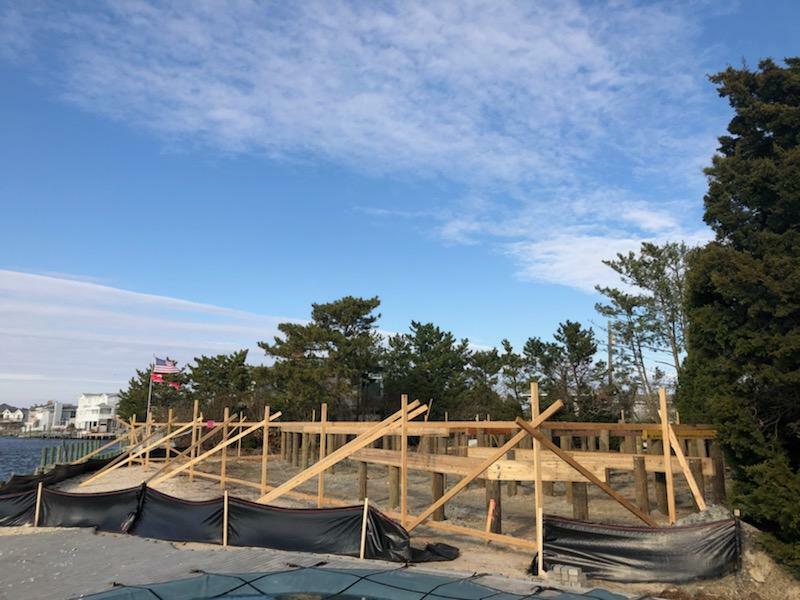 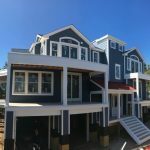 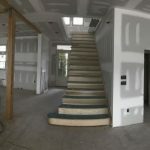 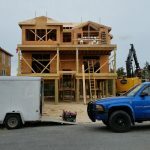 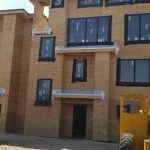 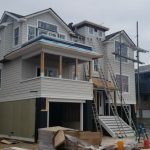 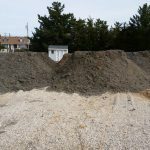 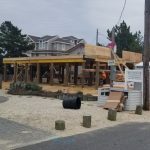 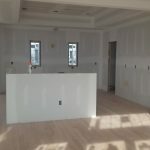 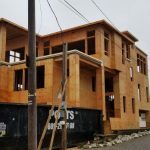 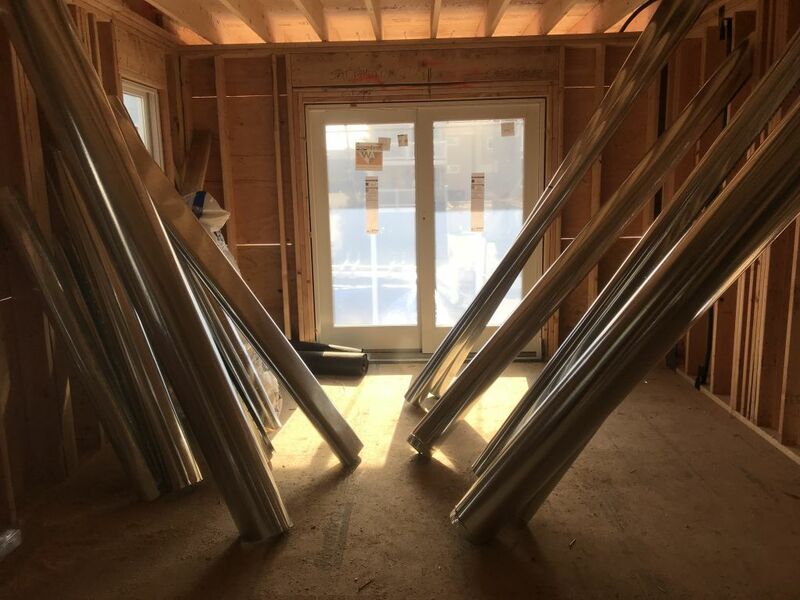 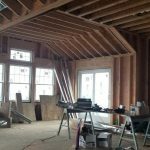 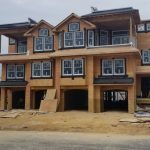 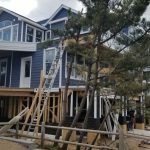 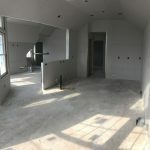 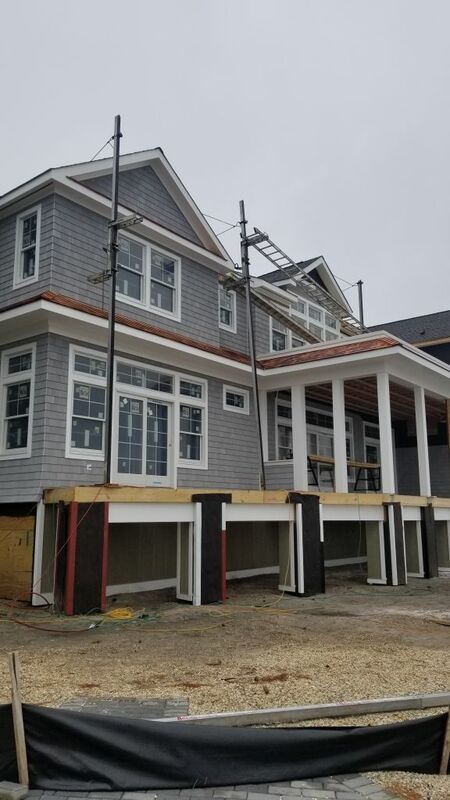 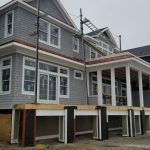 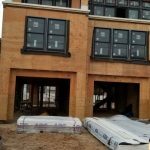 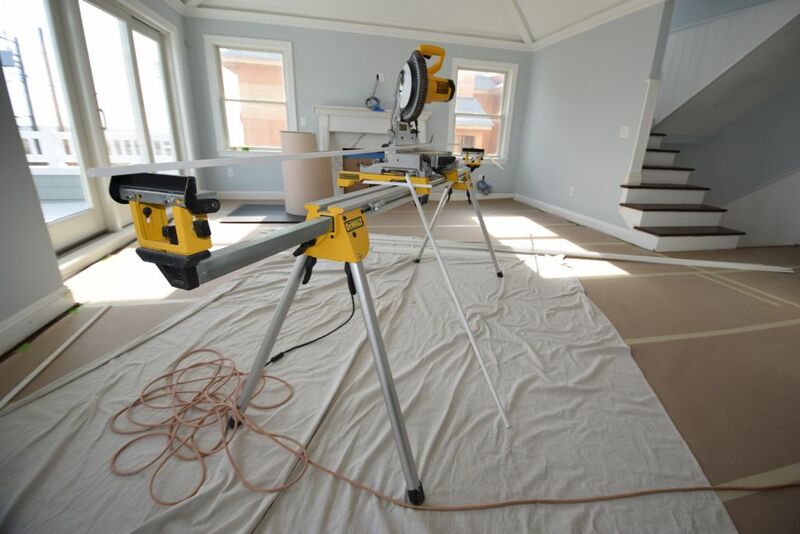 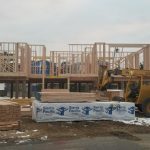 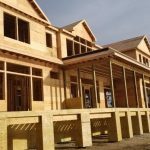 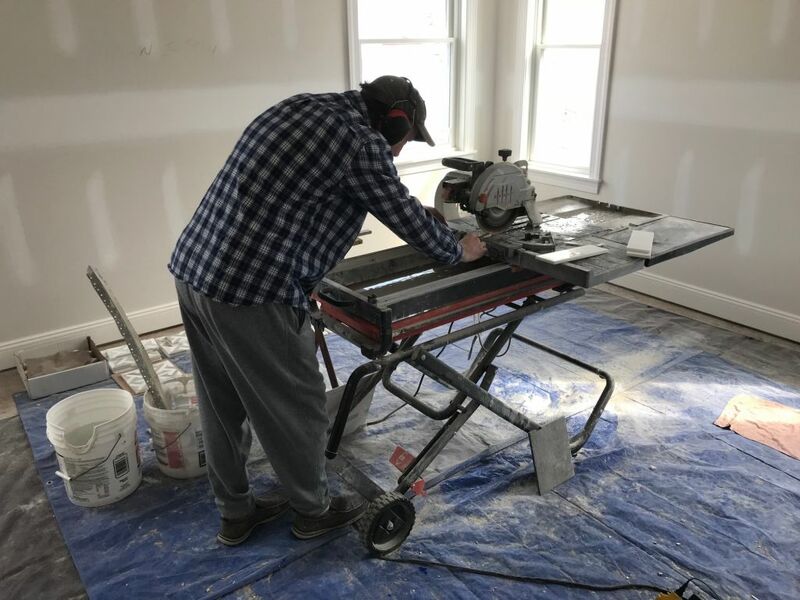 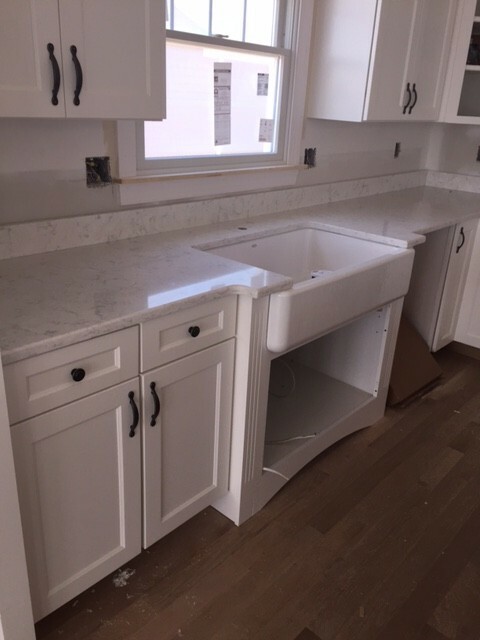 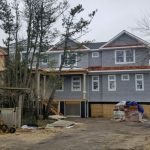 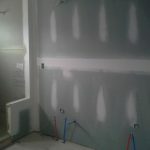 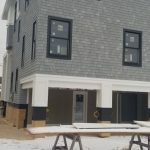 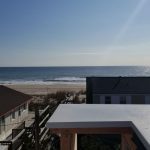 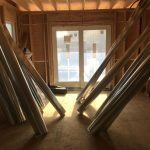 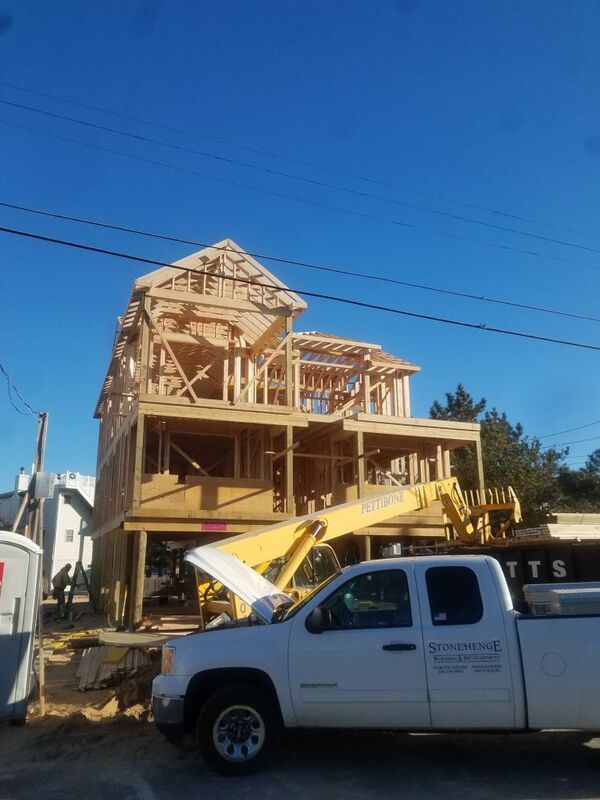 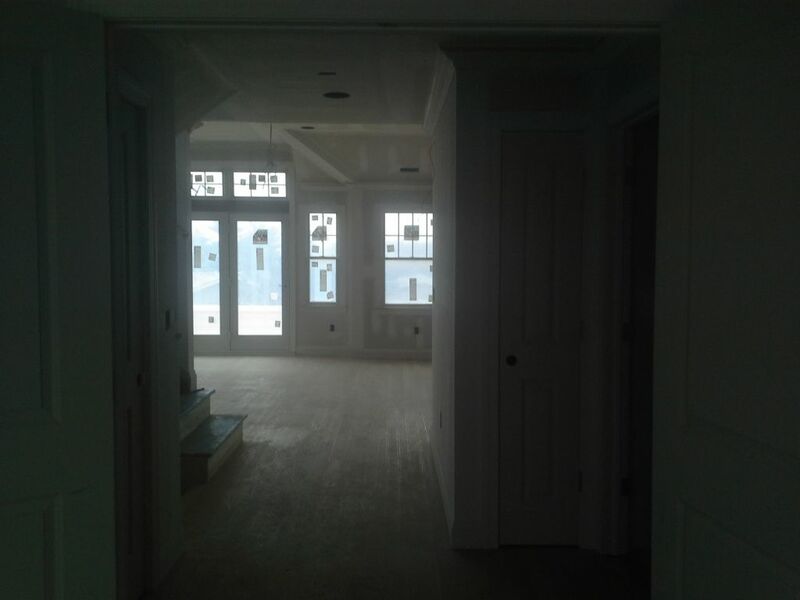 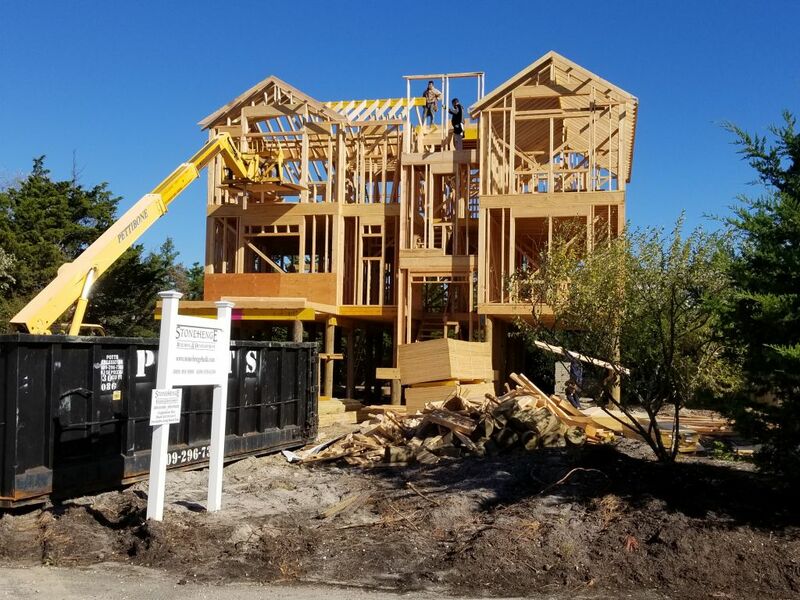 We have many new custom homes on Long Beach Island that are under construction. 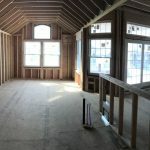 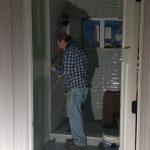 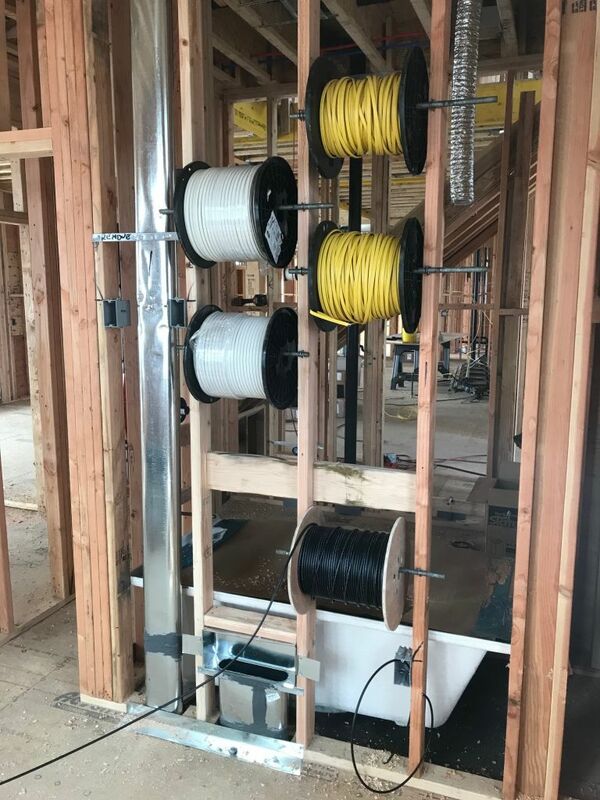 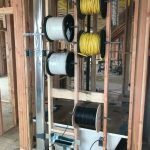 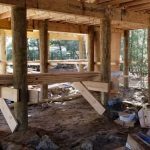 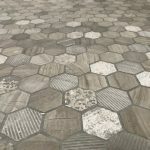 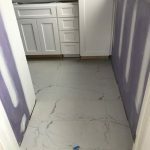 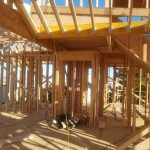 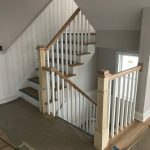 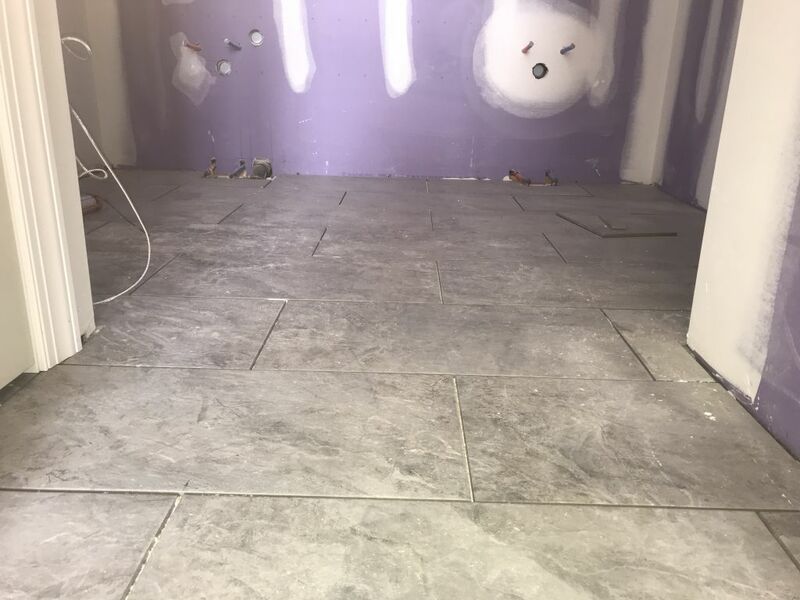 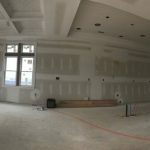 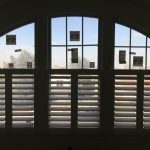 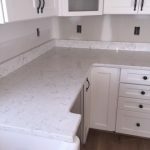 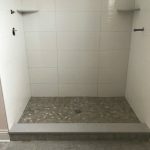 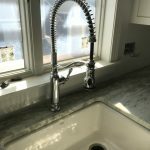 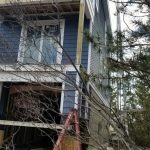 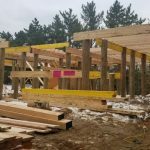 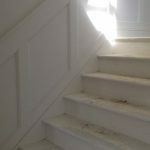 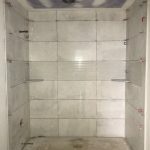 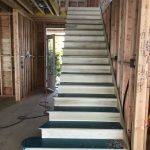 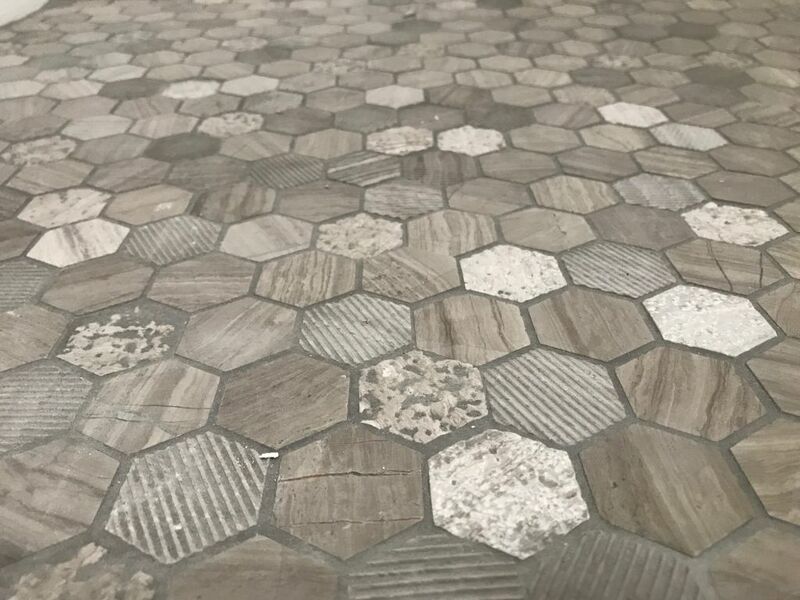 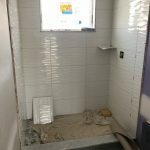 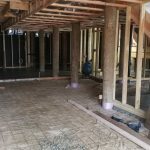 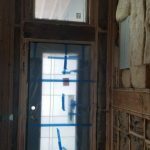 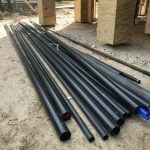 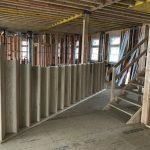 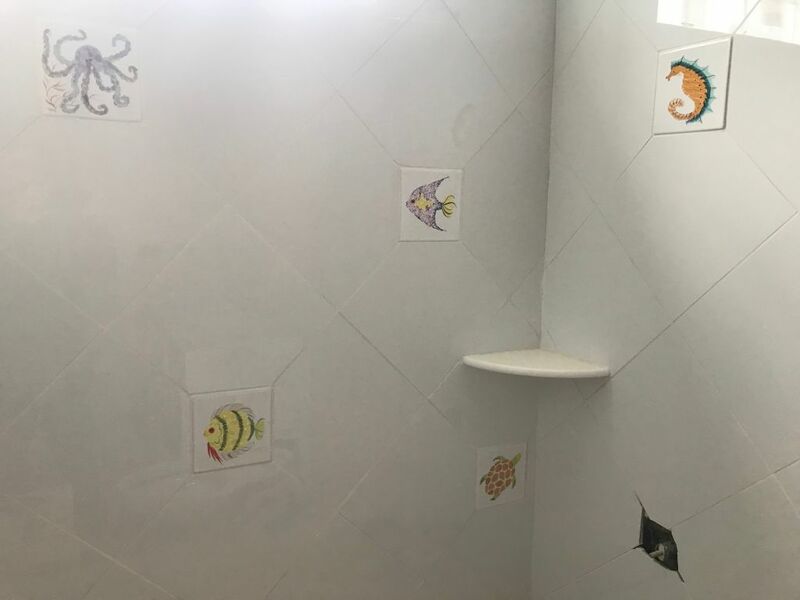 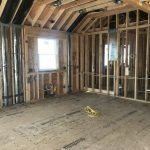 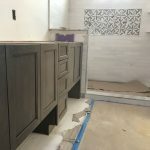 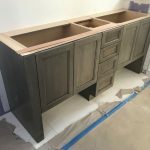 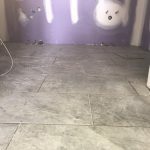 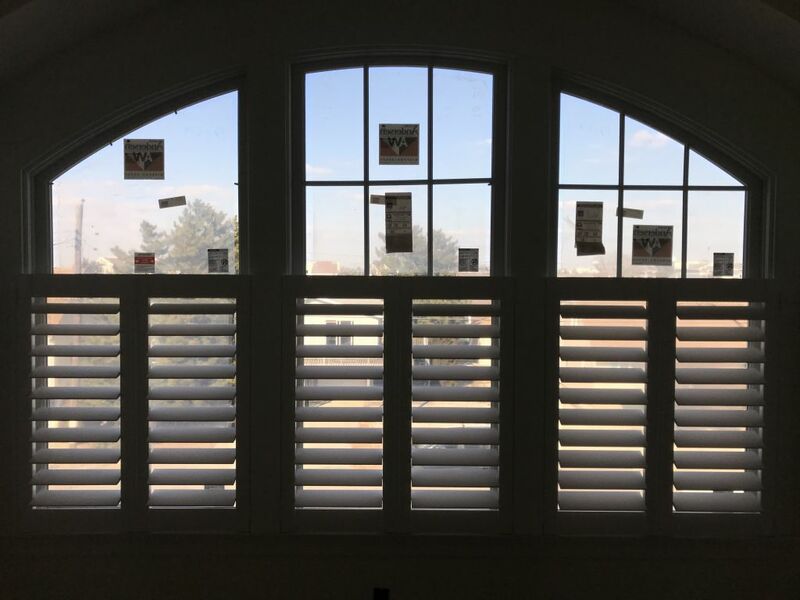 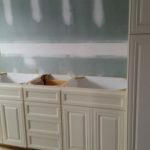 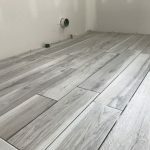 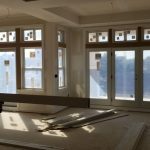 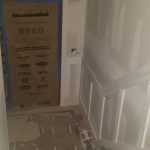 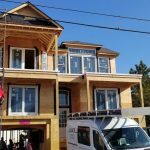 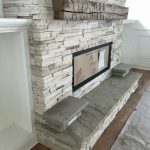 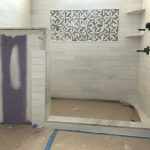 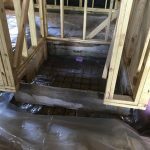 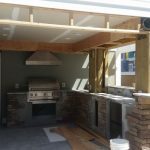 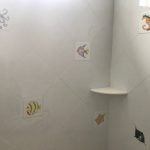 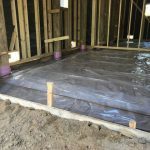 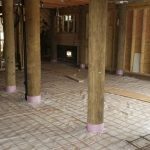 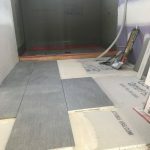 Feel free to take a look at these projects as we bring them to completion. 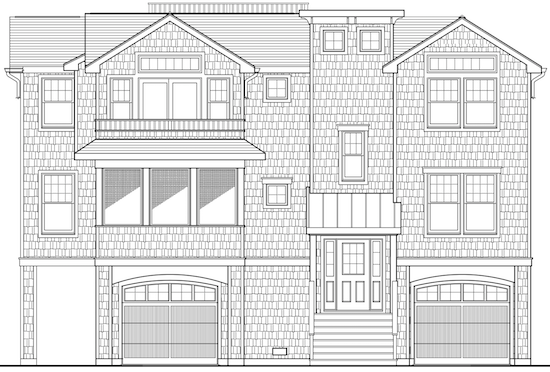 Each side of this duplex home features 2,072 sq.ft. 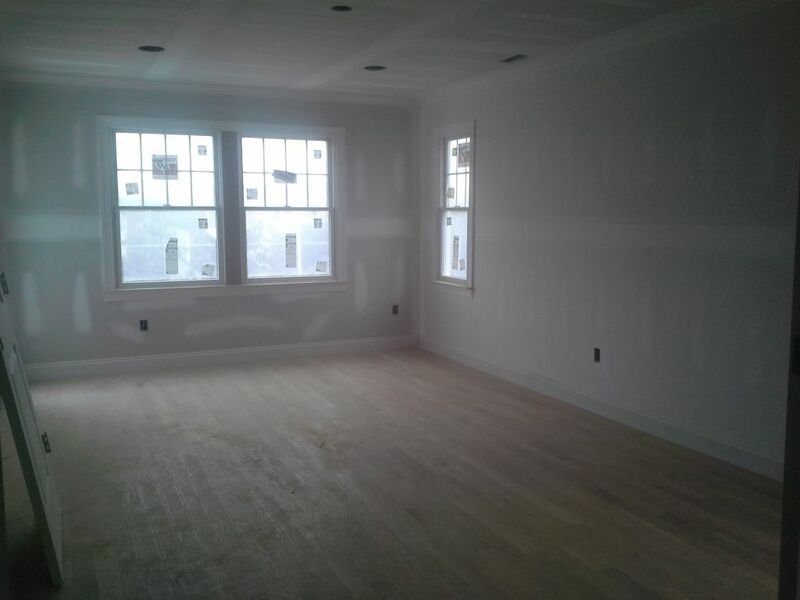 of living space, 4 Bedrooms, 3 ½ Baths, a Family Room, Dining Room, Living room, Kitchen, window seats, and a covered deck. 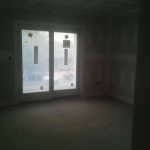 There are residential elevators in each unit, as well as hardwood flooring, a fireplace and wet bar. 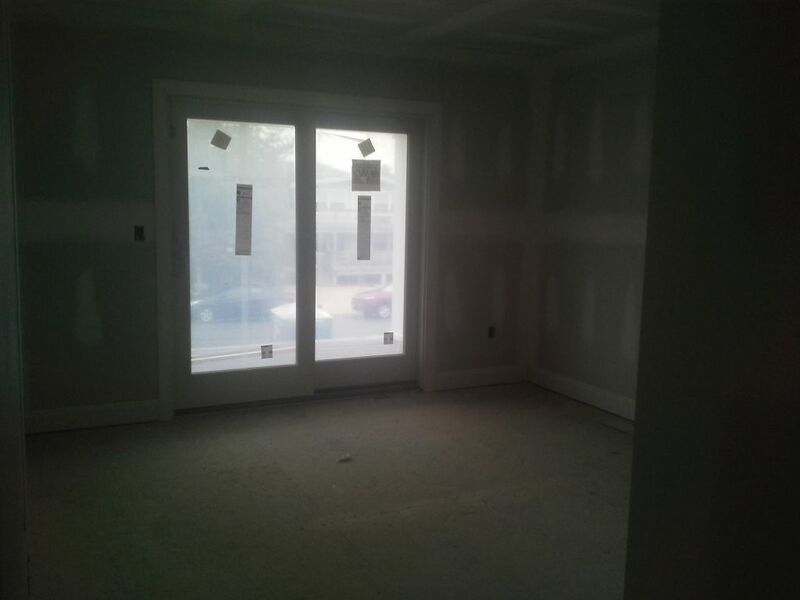 Spacious 4 bedroom reversed living home. 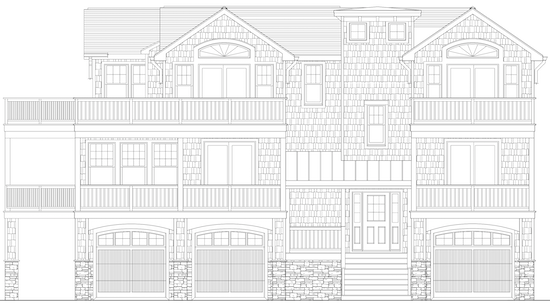 First floor offers Family Room w/wet bar and Jr. Master Suite; both with private covered decks. 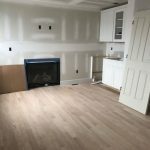 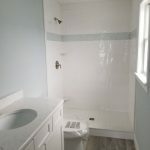 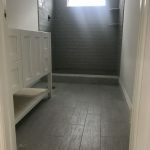 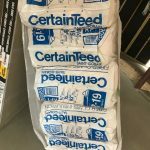 Laundry Room, Hall Bath and Two additional large bedrooms with a shared covered deck. 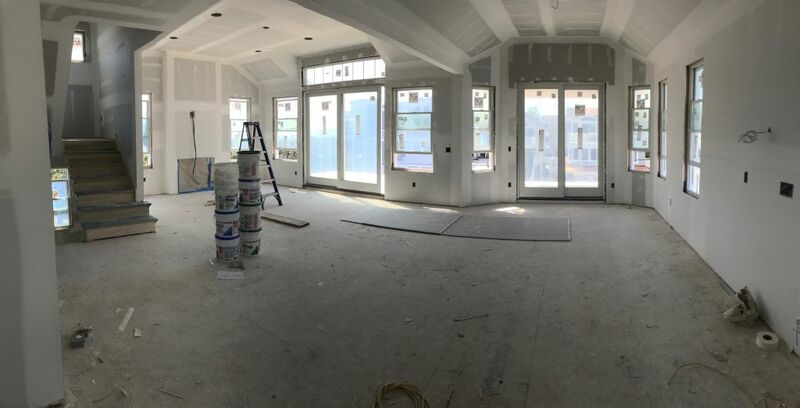 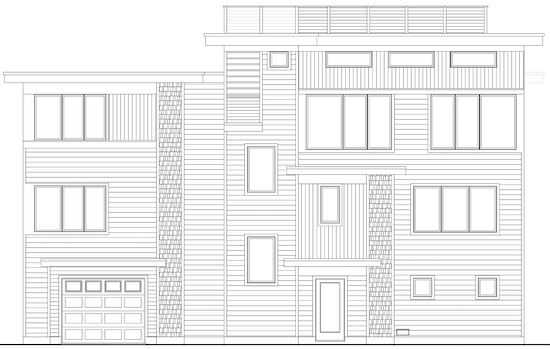 Take your Bristol Elevator to the second floor to the open Living Room, Dining Room and Kitchen with access from Living & Dining Room to the generously sized outdoor deck-creating a nice entertaining flow! 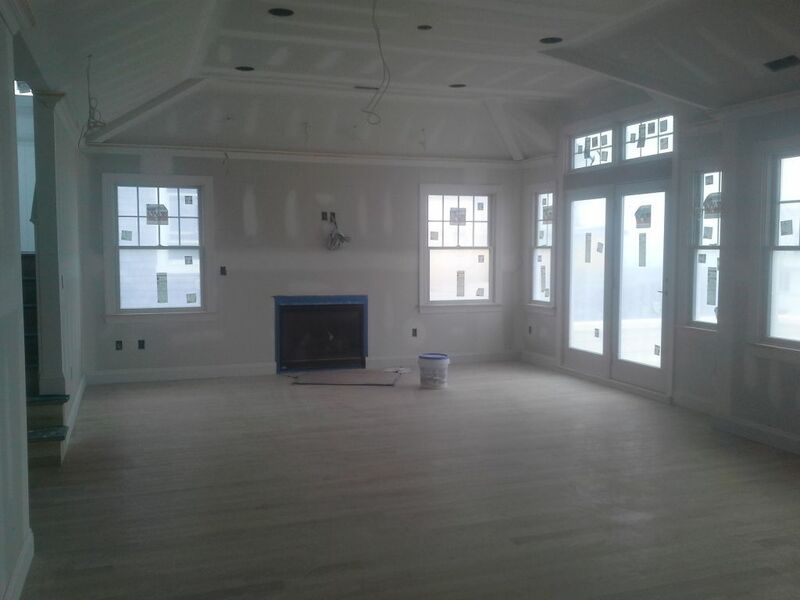 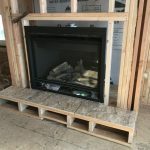 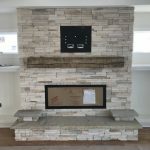 Living Room features volume ceilings and Gas Fireplace. 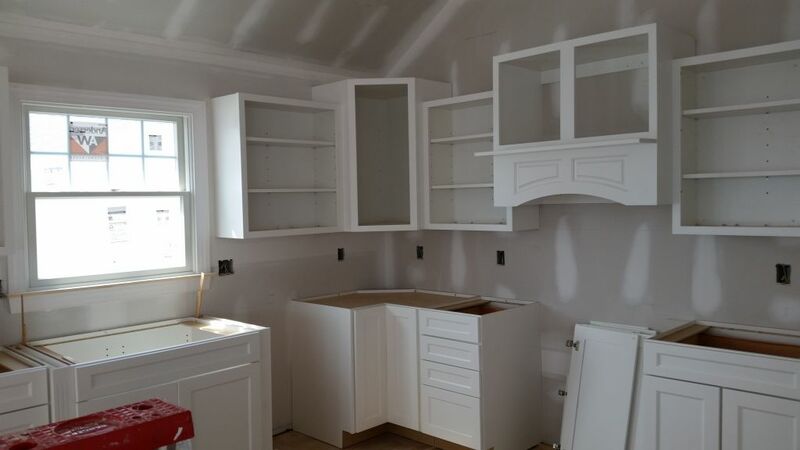 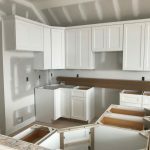 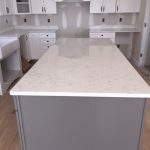 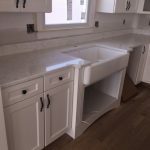 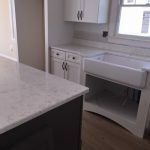 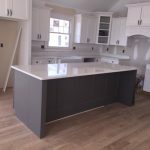 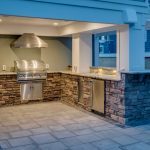 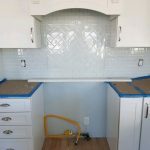 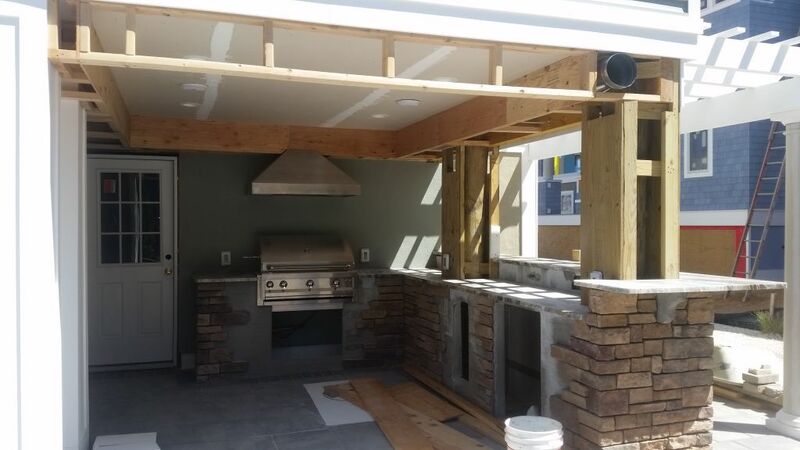 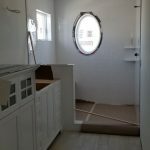 Kitchen offers gas cooking, center Island with Breakfast bar seating! 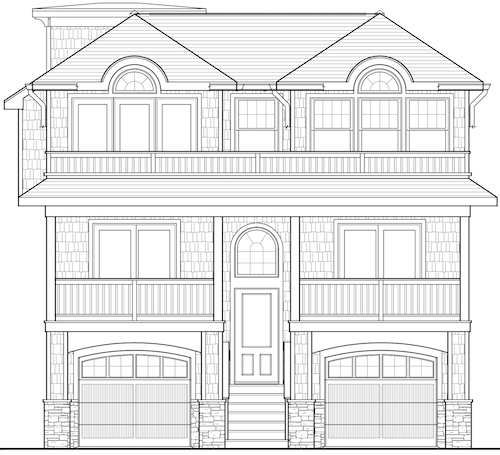 Walk through your double doors to a generous sized Master bedroom with private deck, Huge WIC and en suite bath. 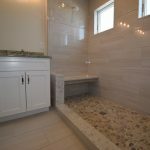 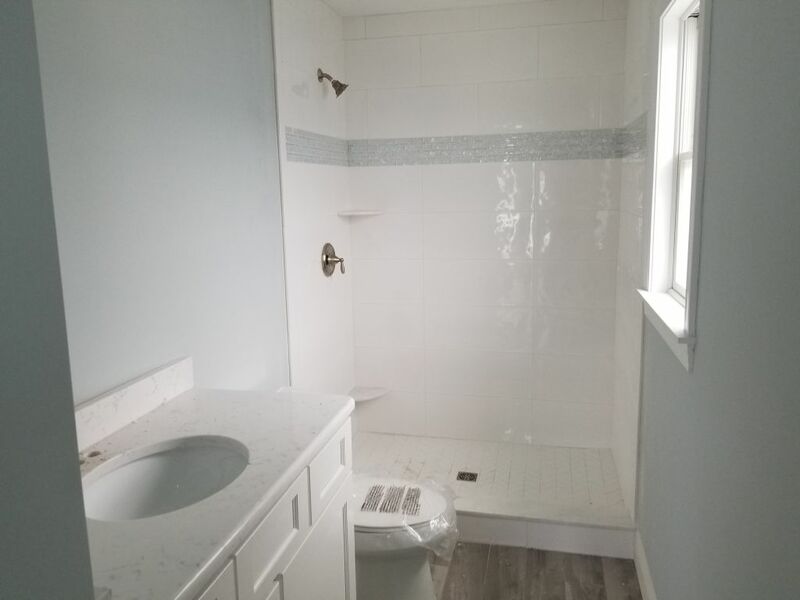 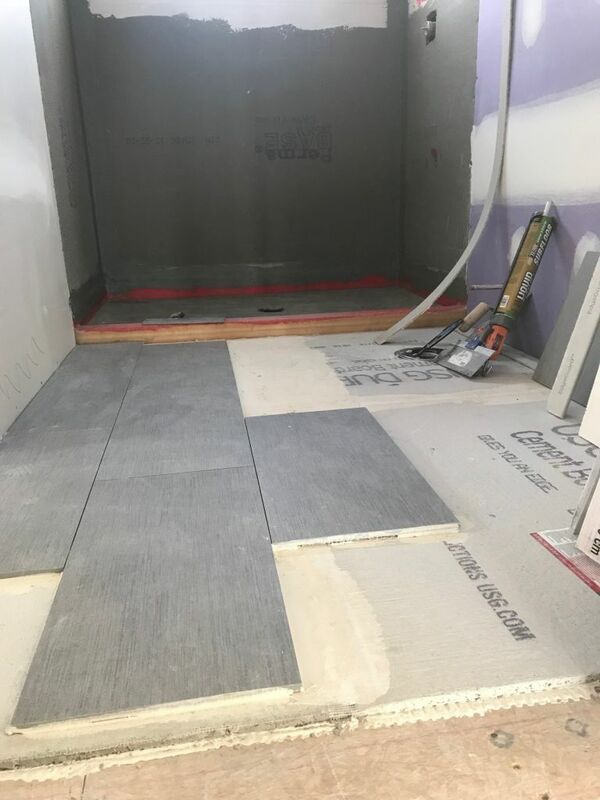 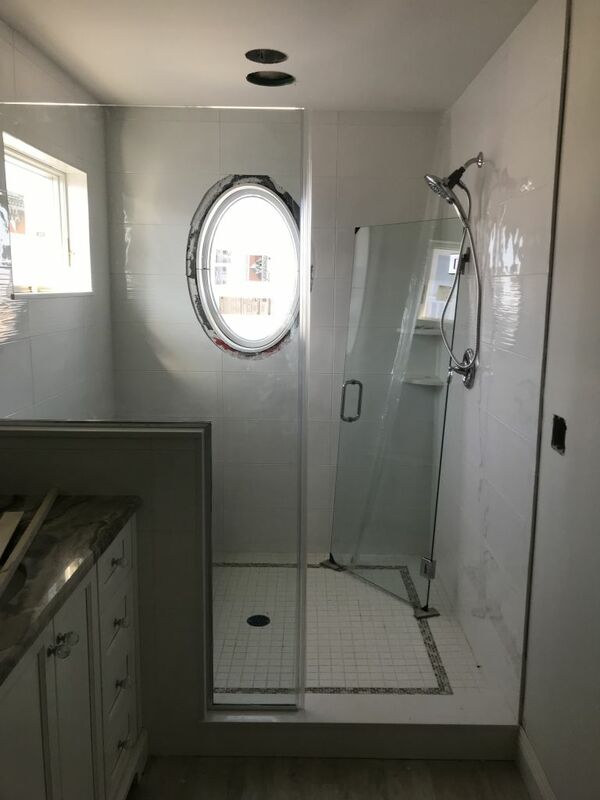 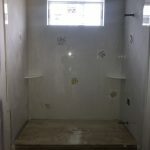 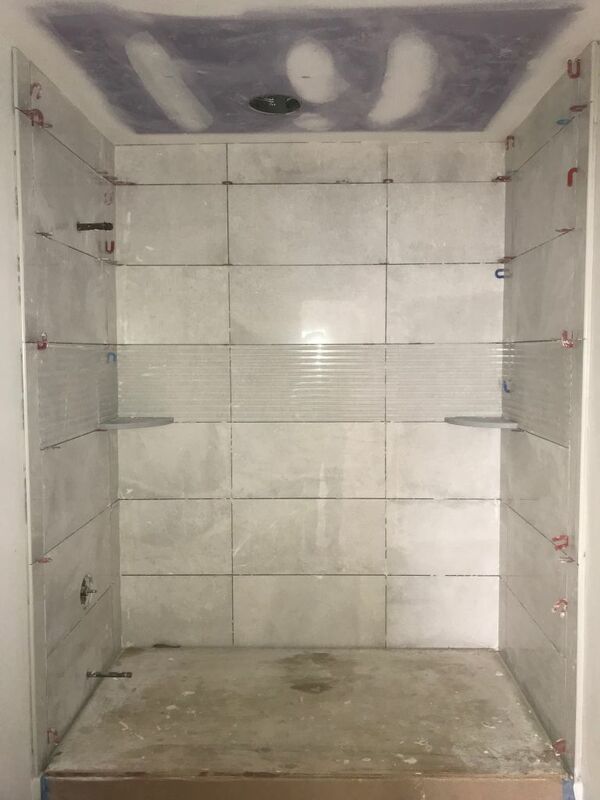 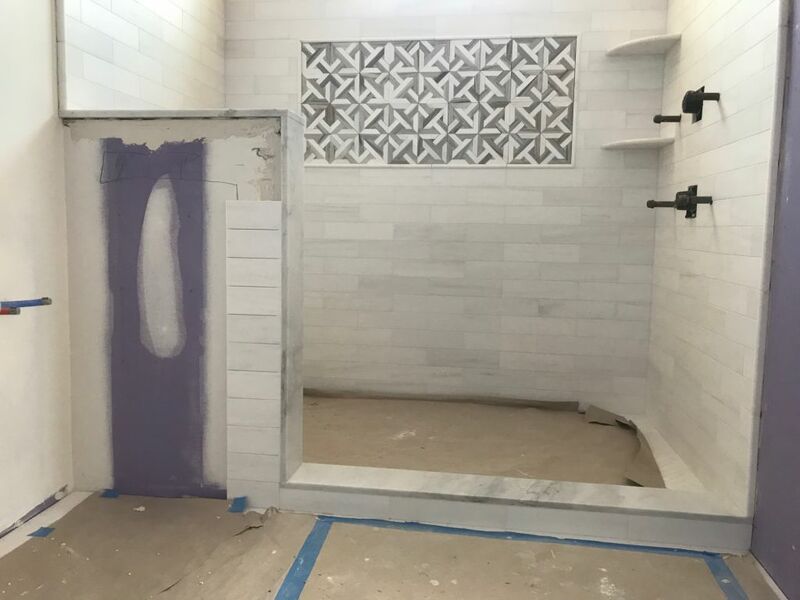 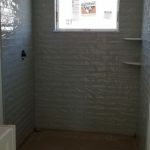 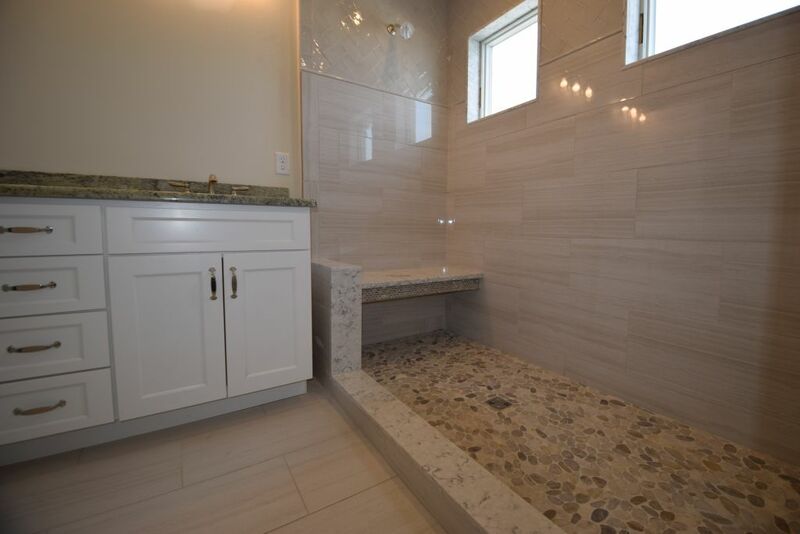 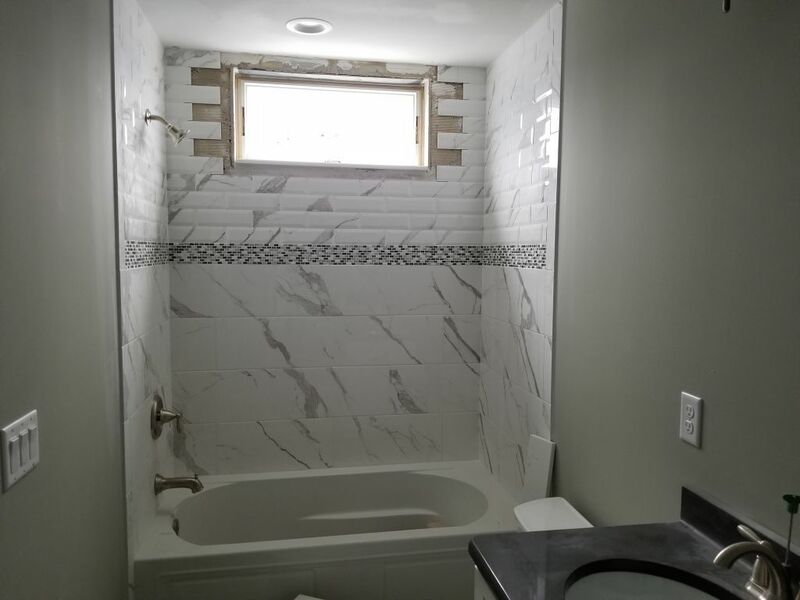 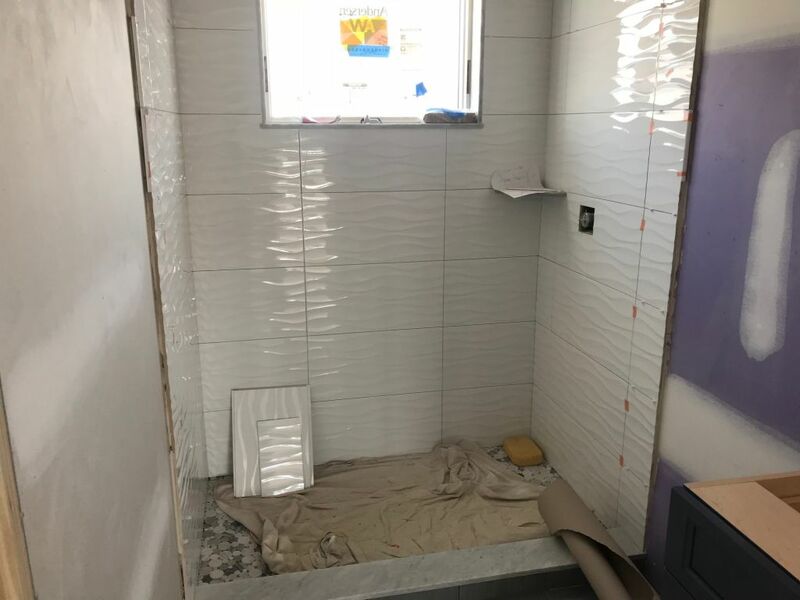 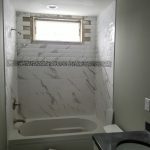 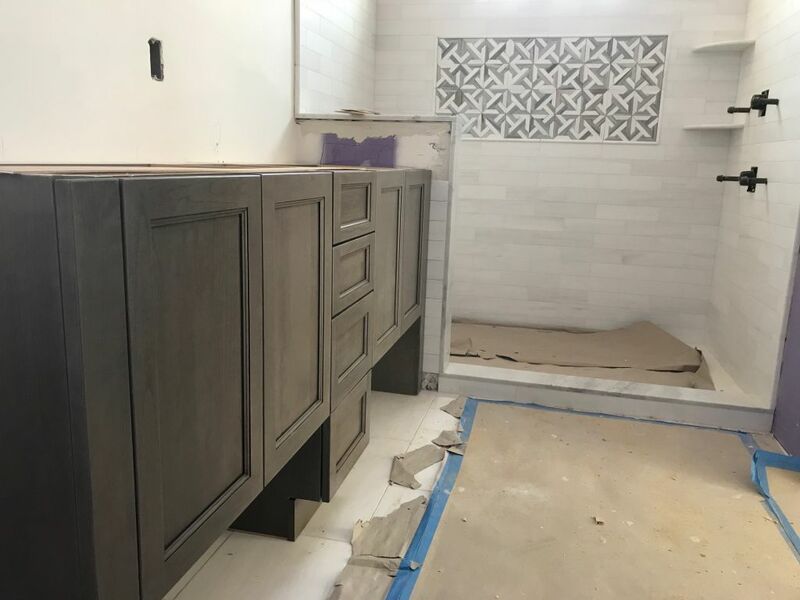 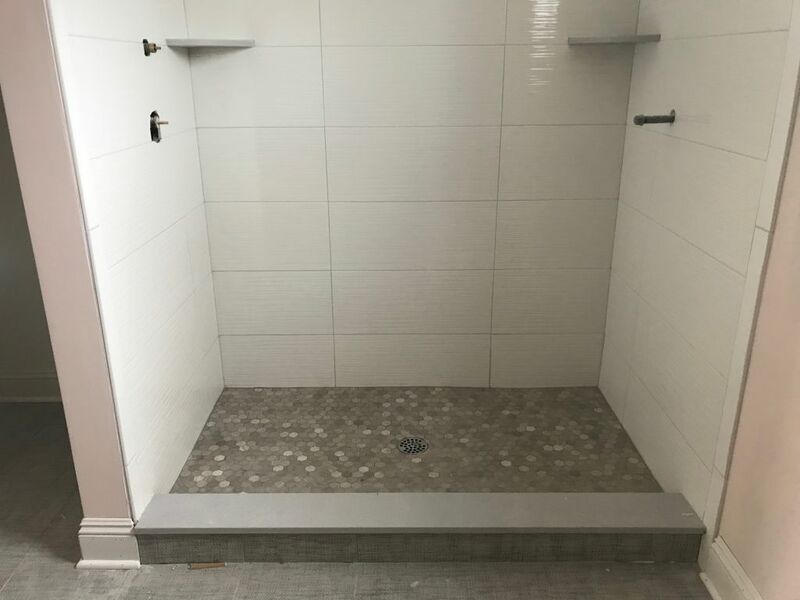 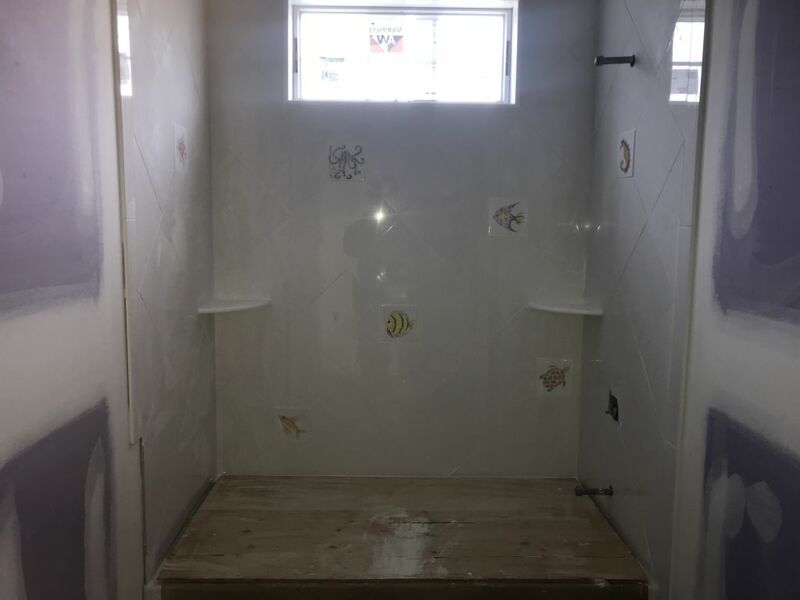 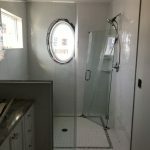 Master Bath includes double sink vanity, oversized shower stall with rectangular bench and private water shed. 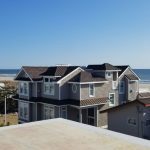 To complete this beautiful architect design, continue up to your sizable Roof Deck with spectacular views. 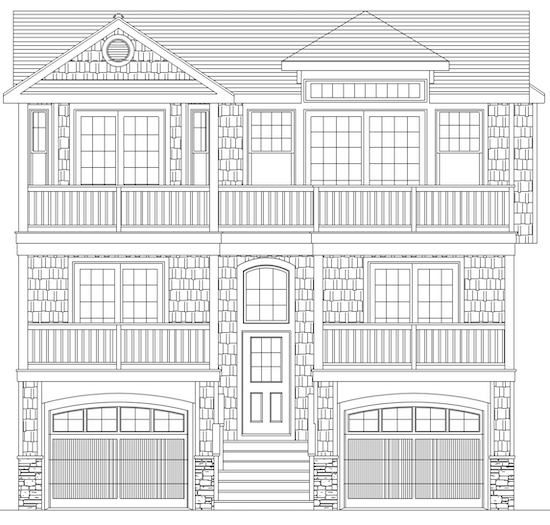 This 4 bedroom, 3 ½ bath custom home in Loveladies is 2,765 sq.ft. 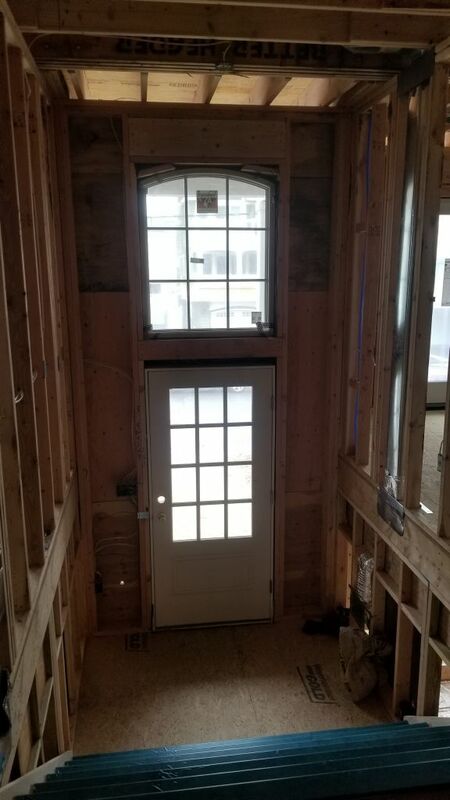 and includes a residential elevator. 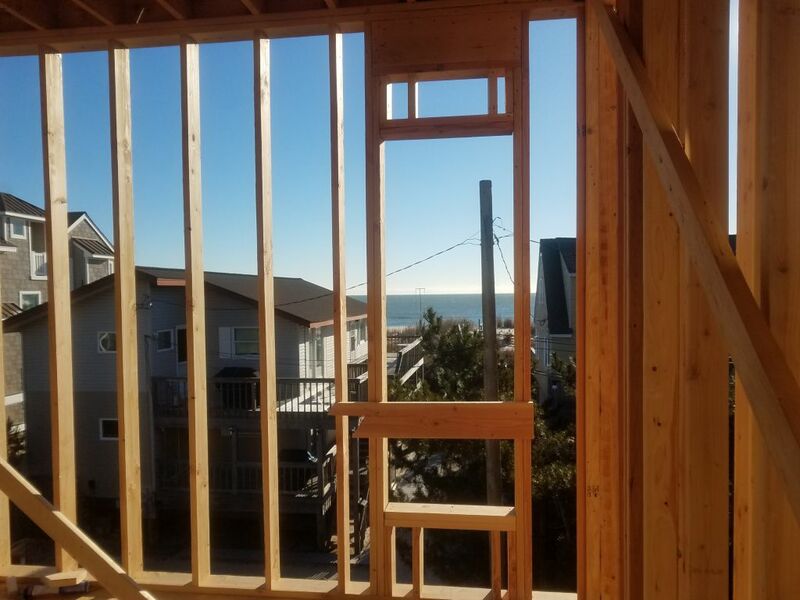 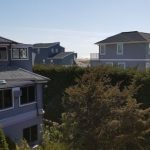 With a roof deck, hot tub, screened deck off the Family Room, and an open deck off the Living Room, the views of LBI are sure to be amazing. 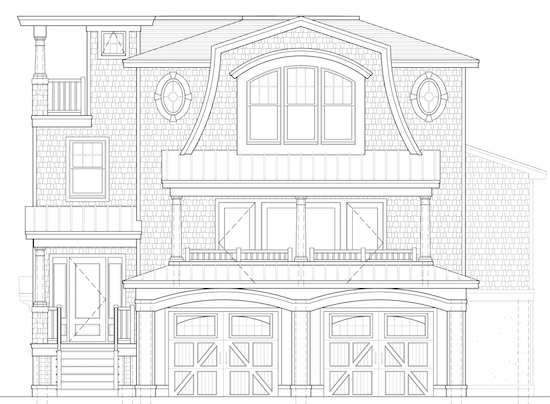 This home features a 2nd floor Master Suite, and a Junior Master Suite. 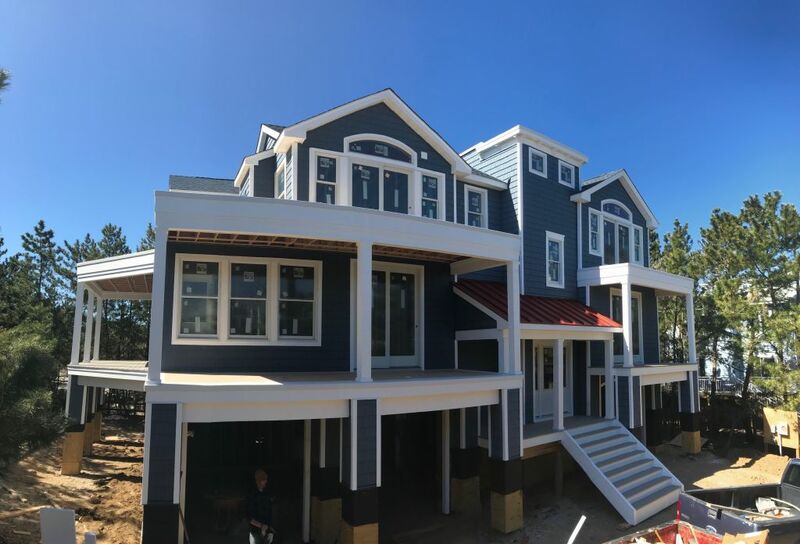 A Contemporary design with beautiful modern touches like stainless steel exterior cable railings on the decks, this breathtaking home includes large crown moulding and hardwood floors throughout. 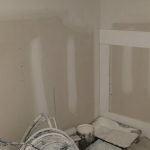 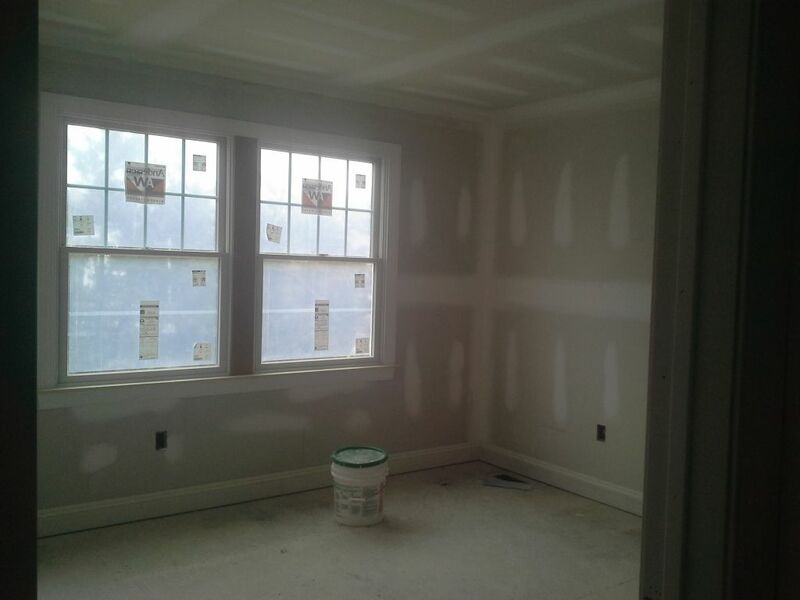 The Master Suite features two walk-in closets and radiant heat in the Master Bath. 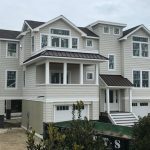 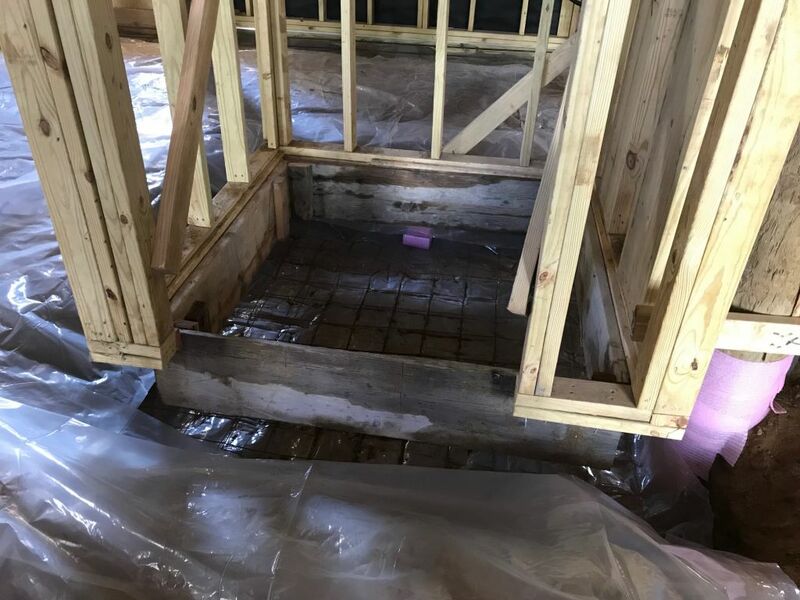 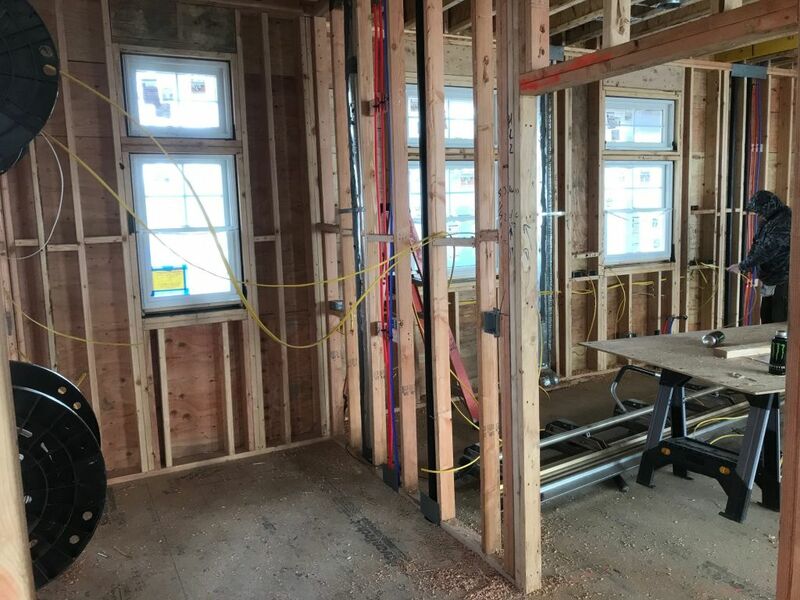 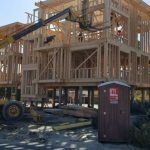 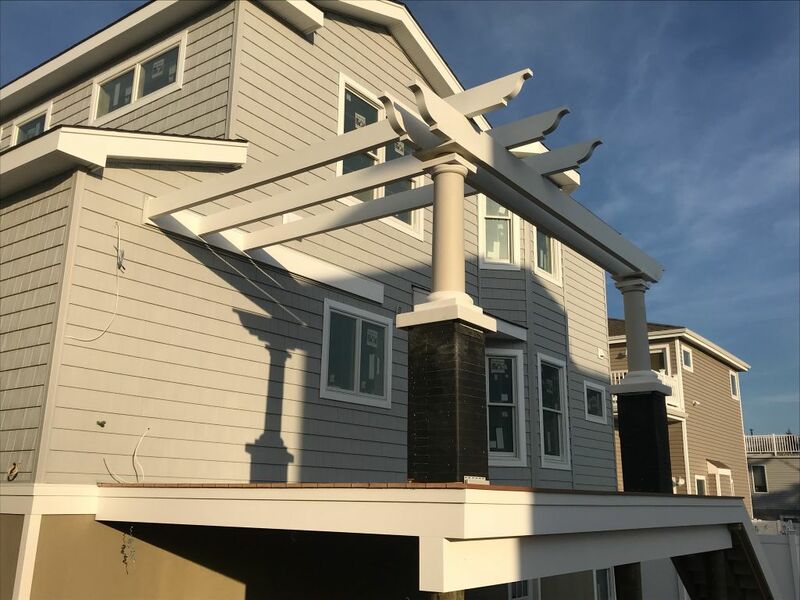 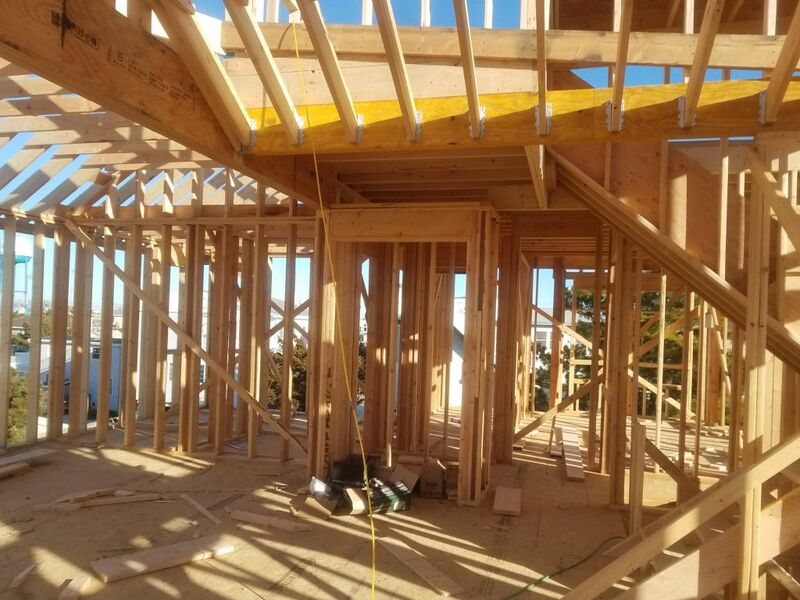 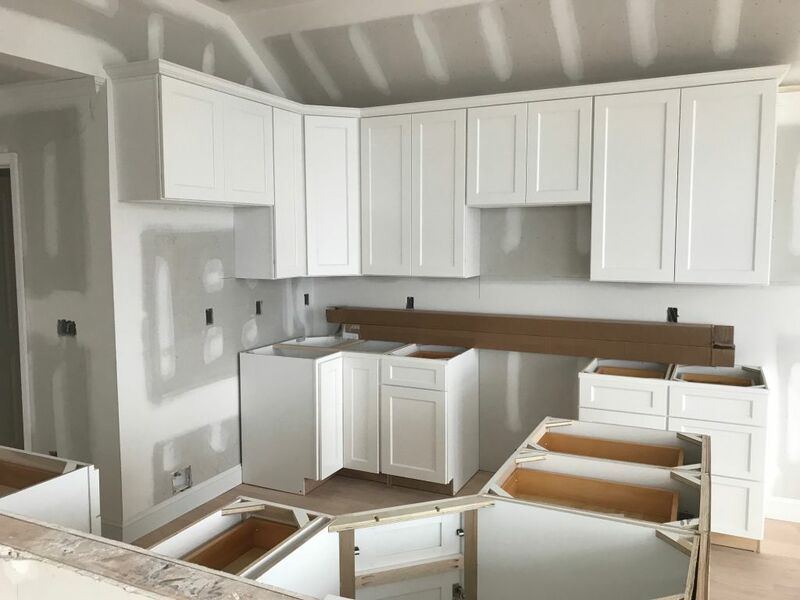 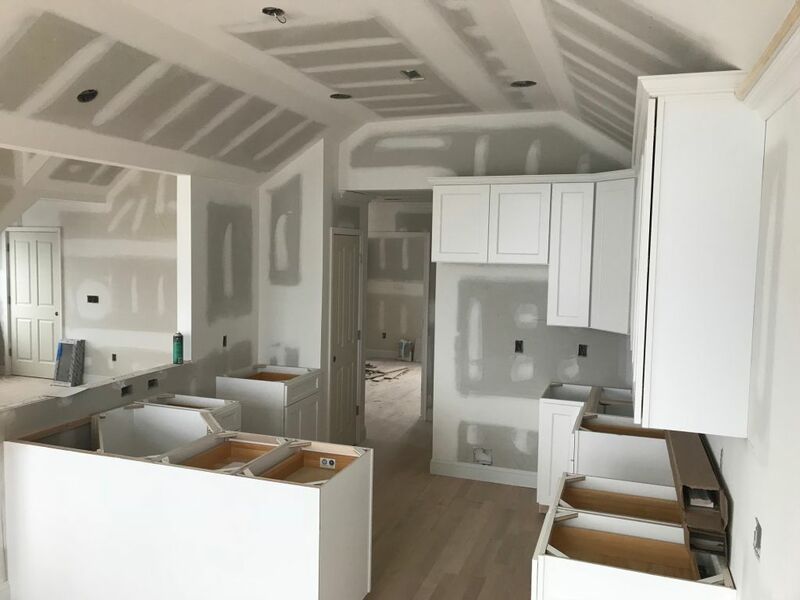 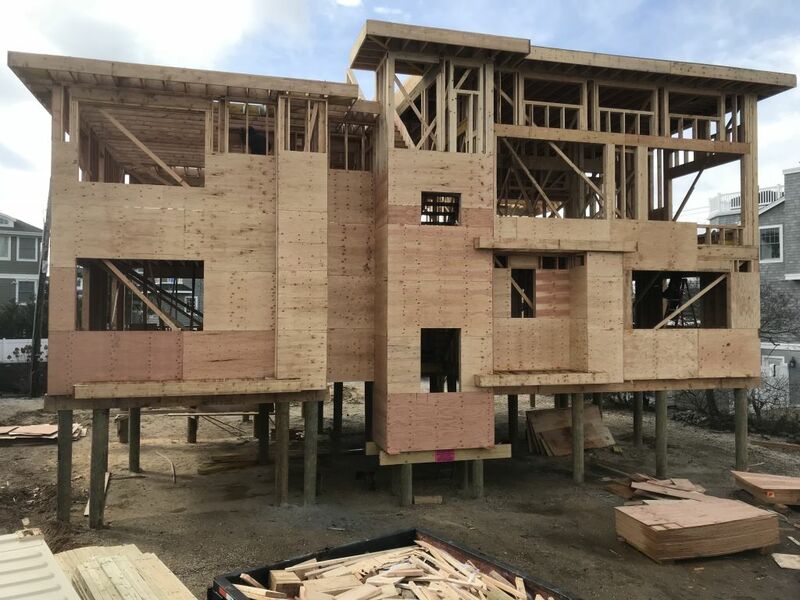 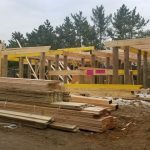 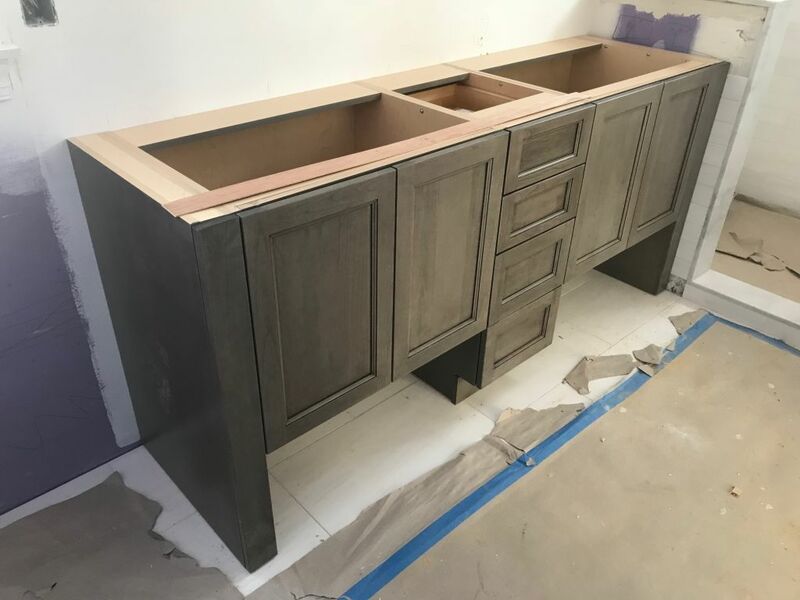 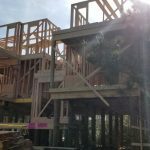 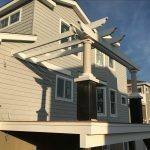 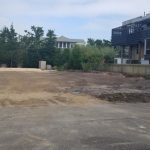 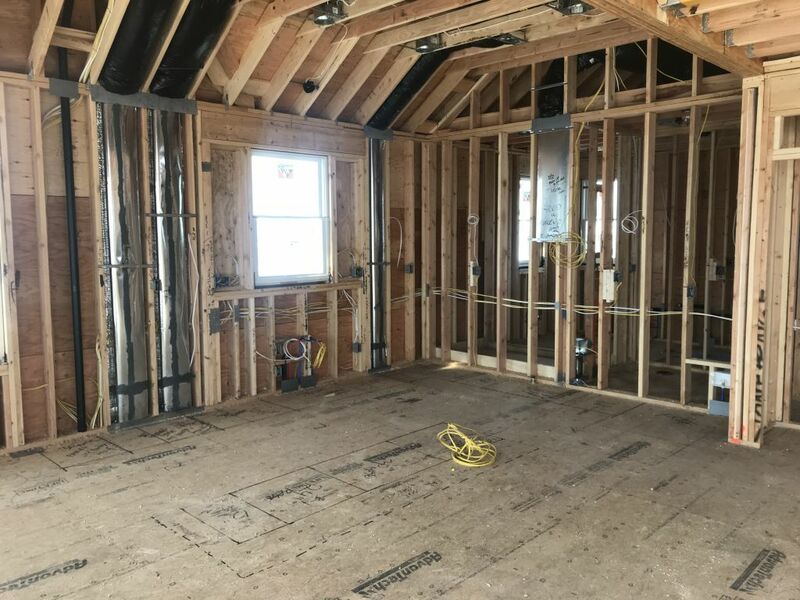 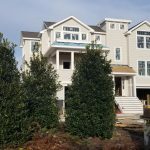 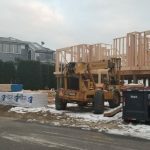 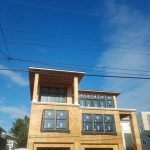 There is a Junior Master Suite, 3 additional bedrooms, roof decks, an open concept living/dining area, study, and an outdoor kitchen with pergola. 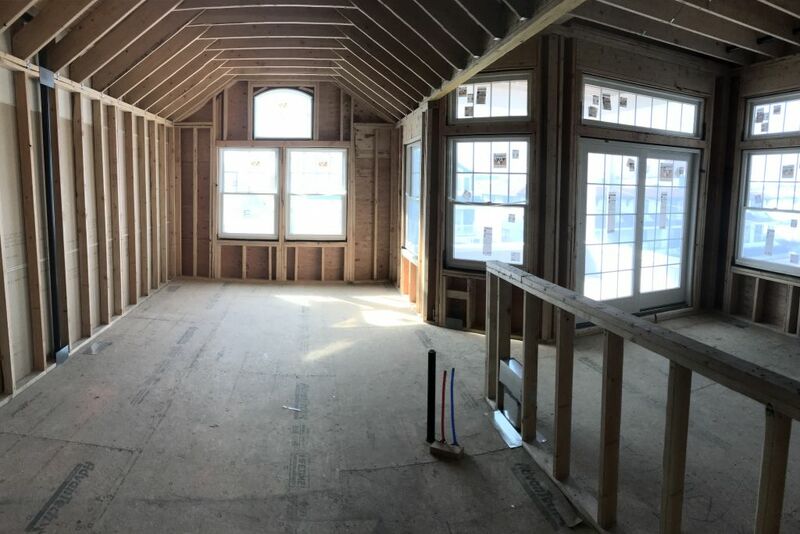 4,163 sq.ft. 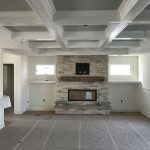 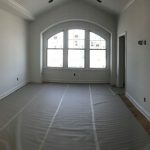 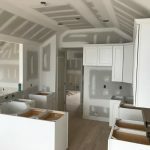 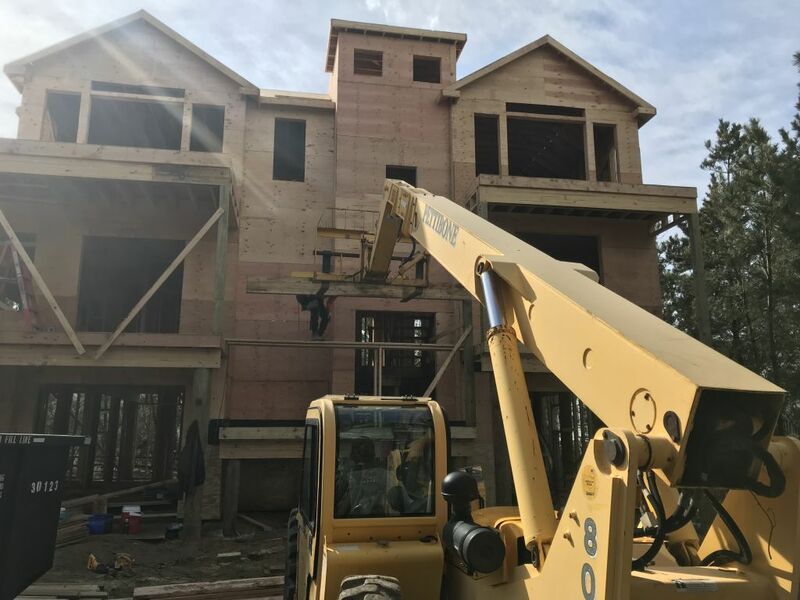 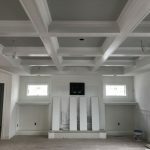 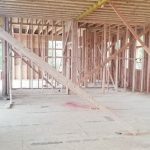 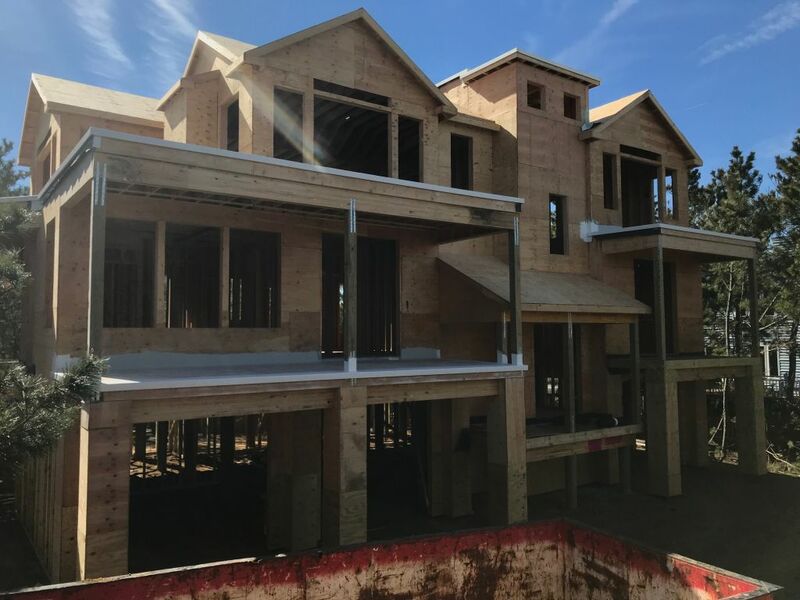 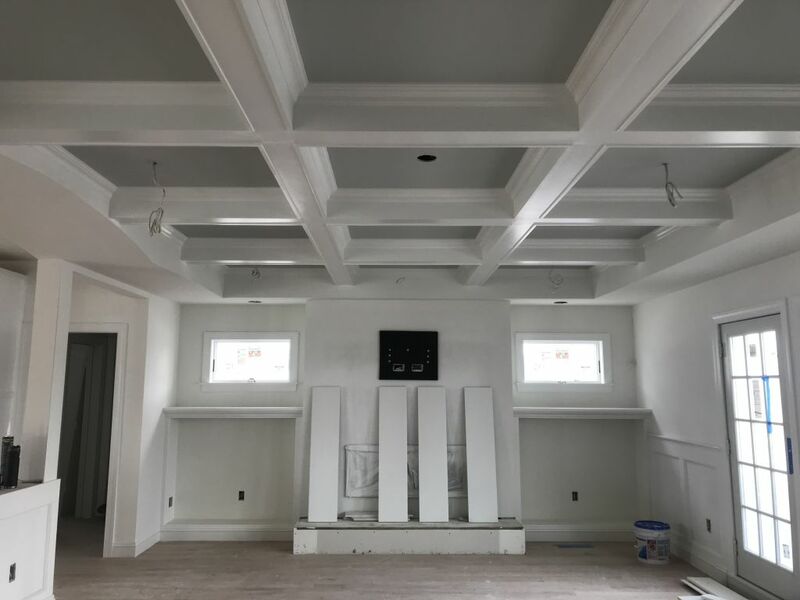 custom home with coffered/beam ceilings in the Living Room, Dining room, and Kitchen with Ship Lap Ceilings 6 Bedrooms, 6 Bathrooms, 2 Laundry Rooms. 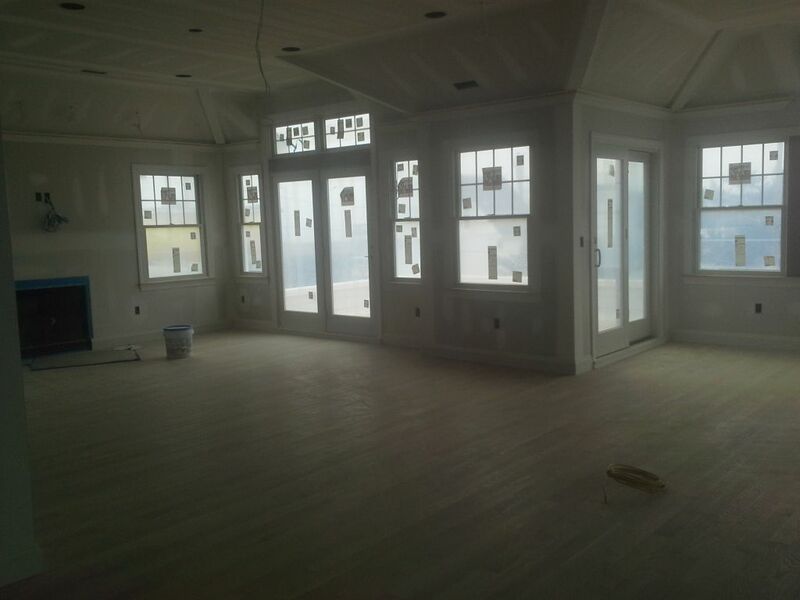 Master bedroom with an open deck and screened deck off Dining Room. 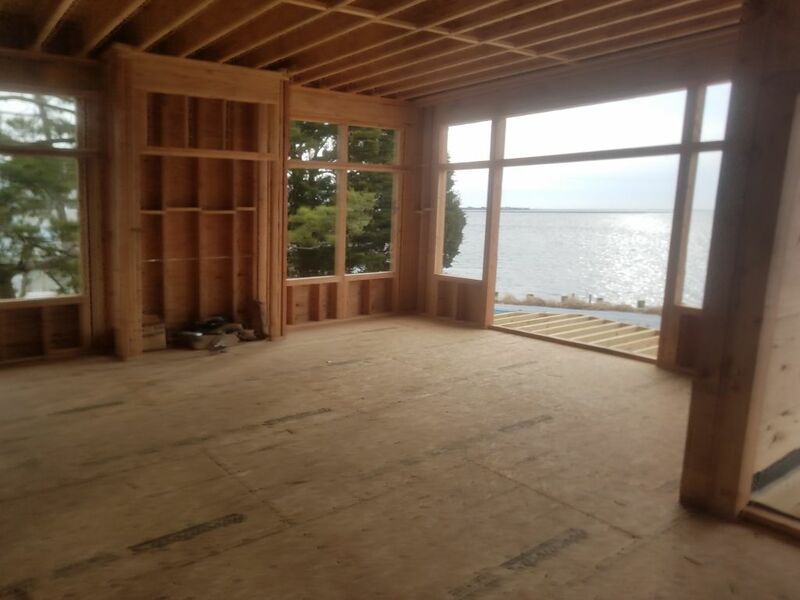 Open Deck off Family Room. 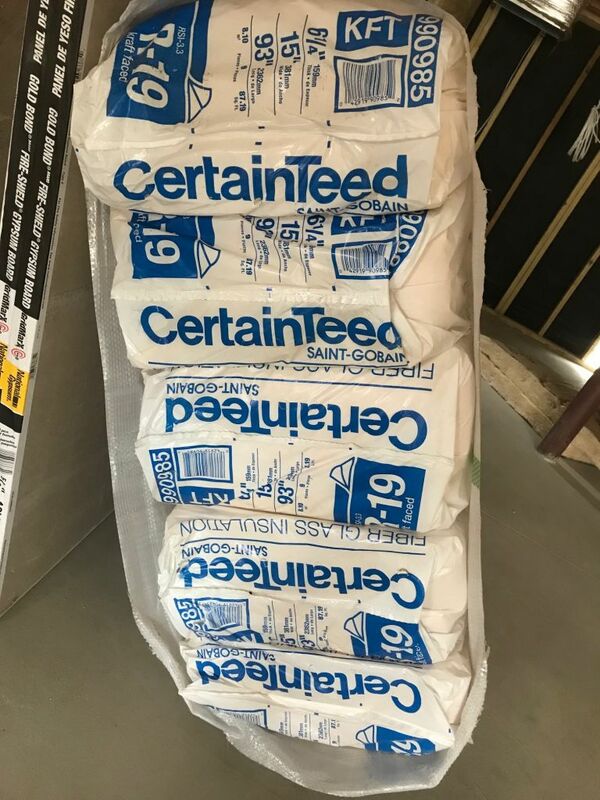 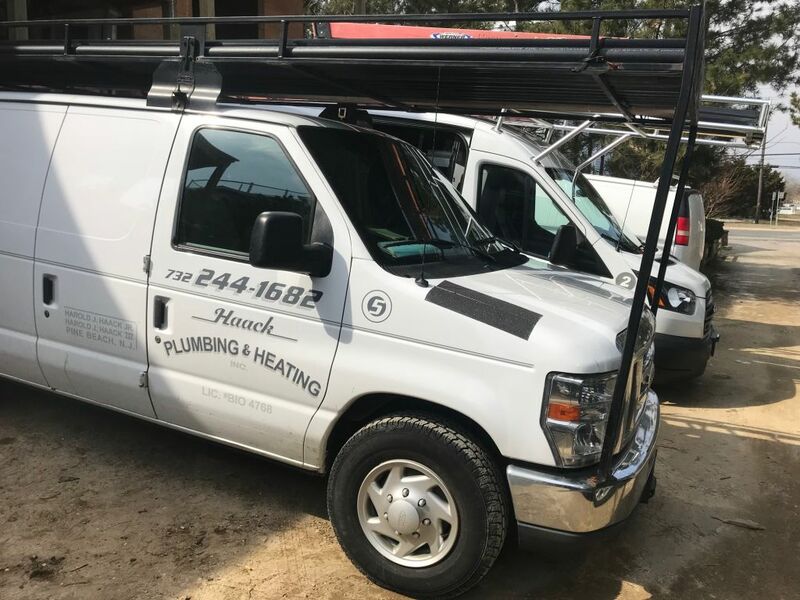 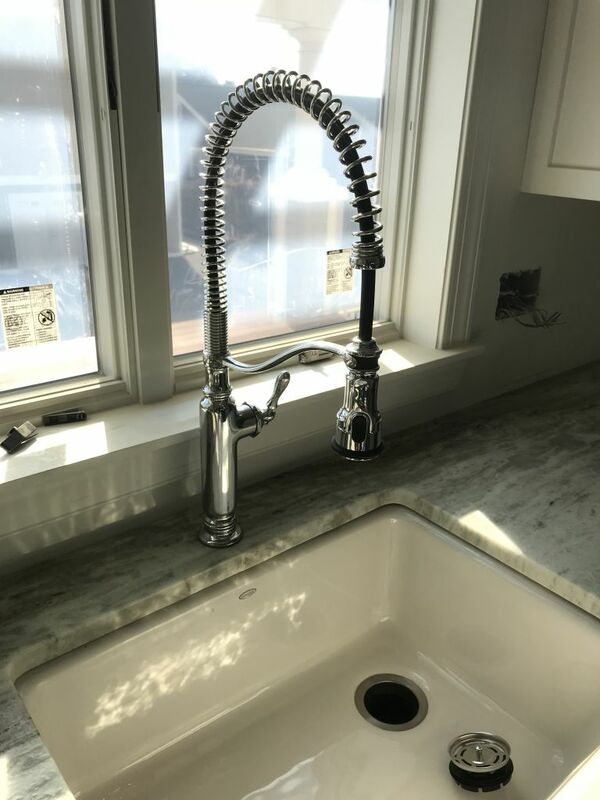 This 2,774 sqf.t. 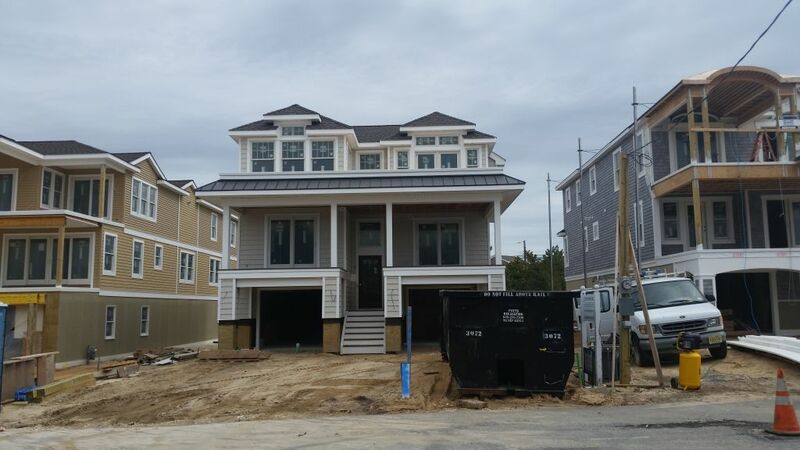 home in Surf City includes a Master Bedroom Suite and 2 Junior Master Suites, as well as 2 additional Bedrooms. 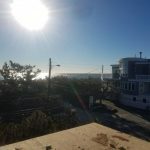 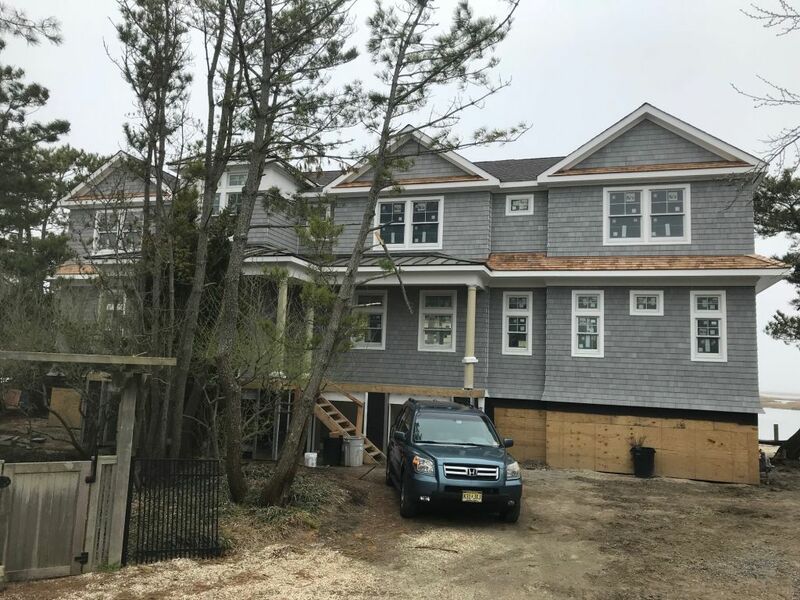 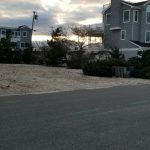 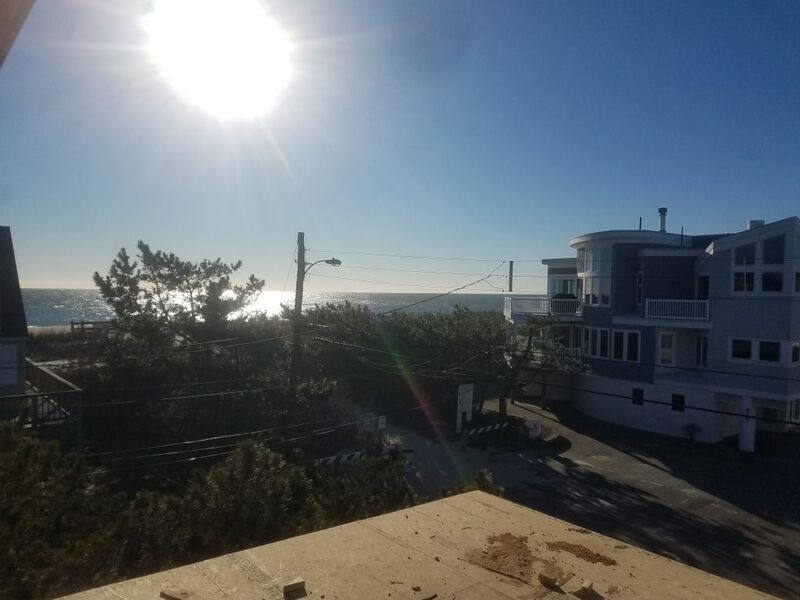 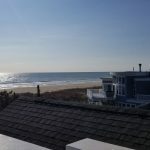 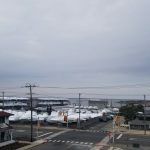 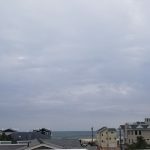 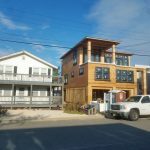 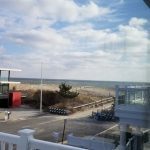 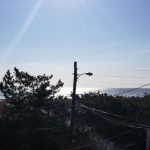 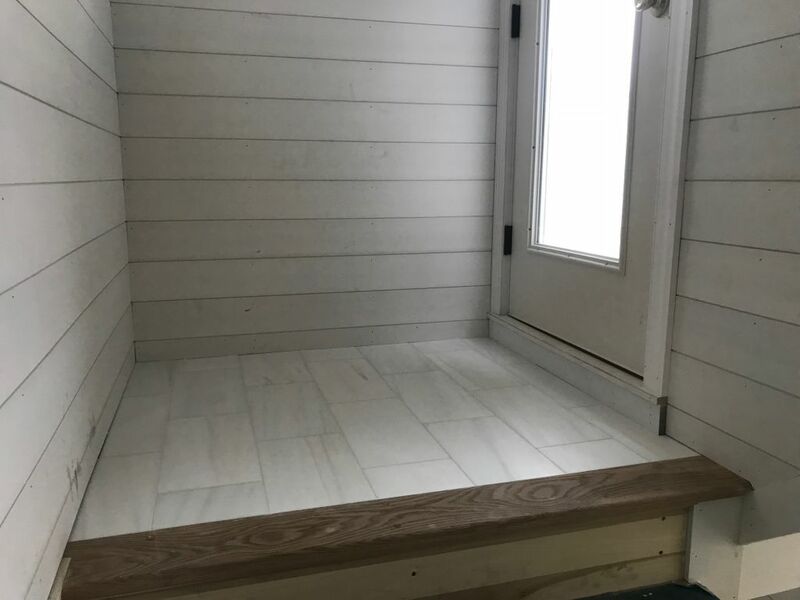 With hardwood floors, a fireplace, roof deck, open and covered decks, as well as two outdoor showers, this home is ready for all that LBI living has to offer! 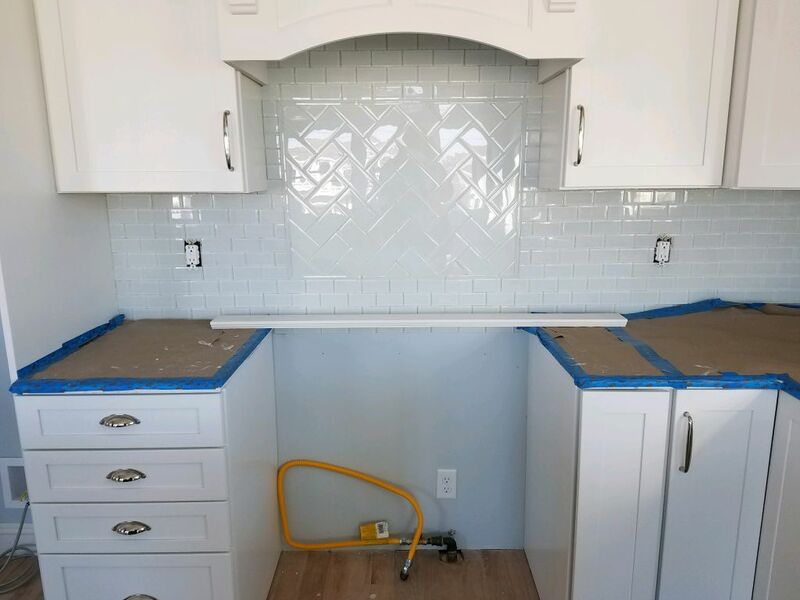 Mid Century Modern design. 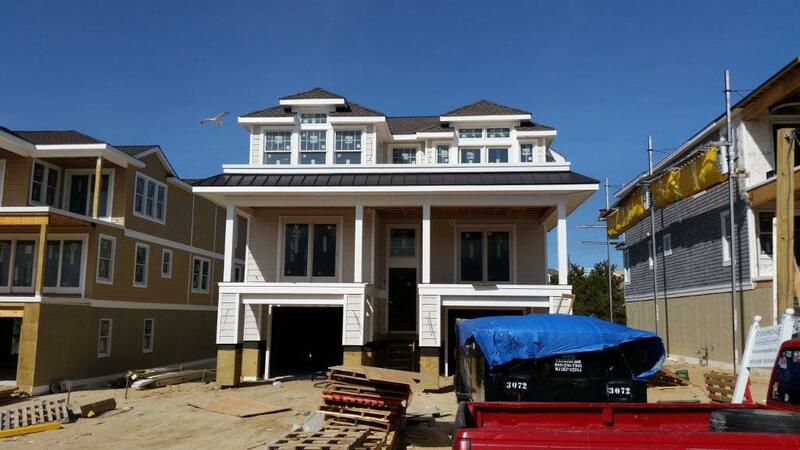 3,061 square feet, 4 Bedrooms, 3 1/2 baths, 2 car garage, Hardwood throughout. 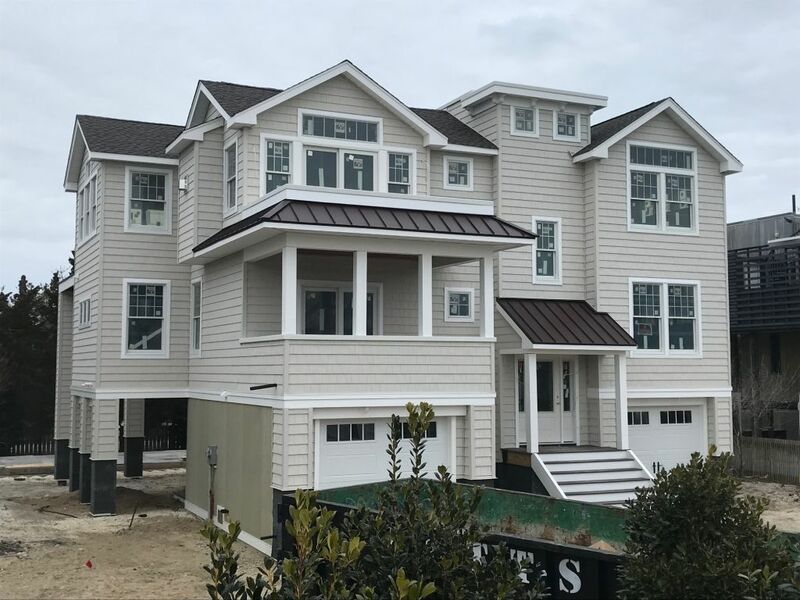 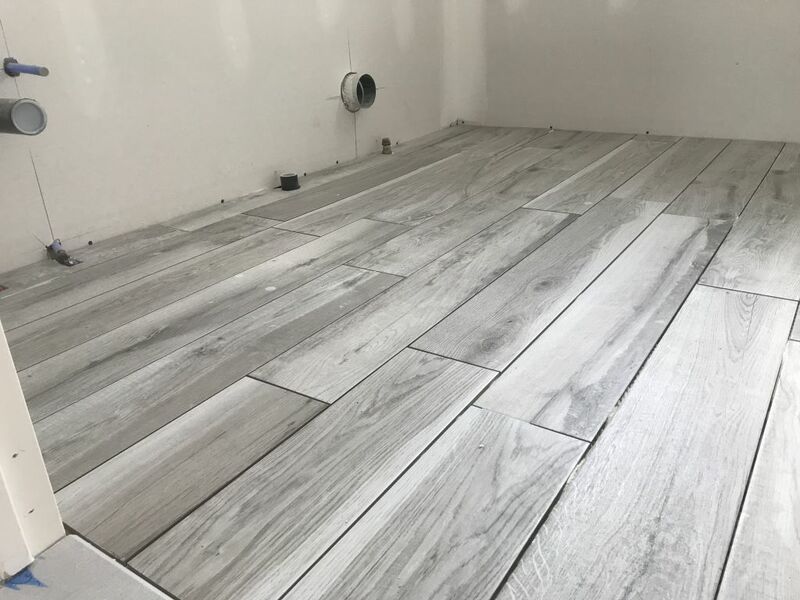 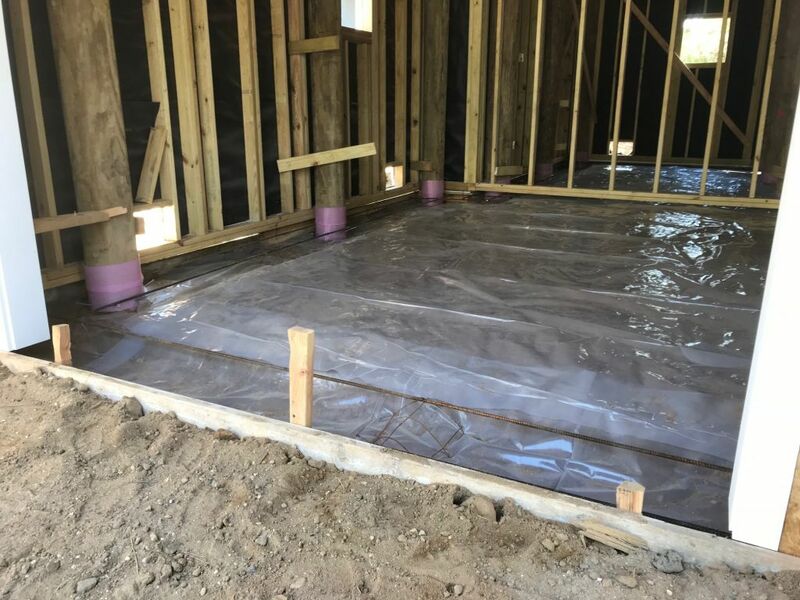 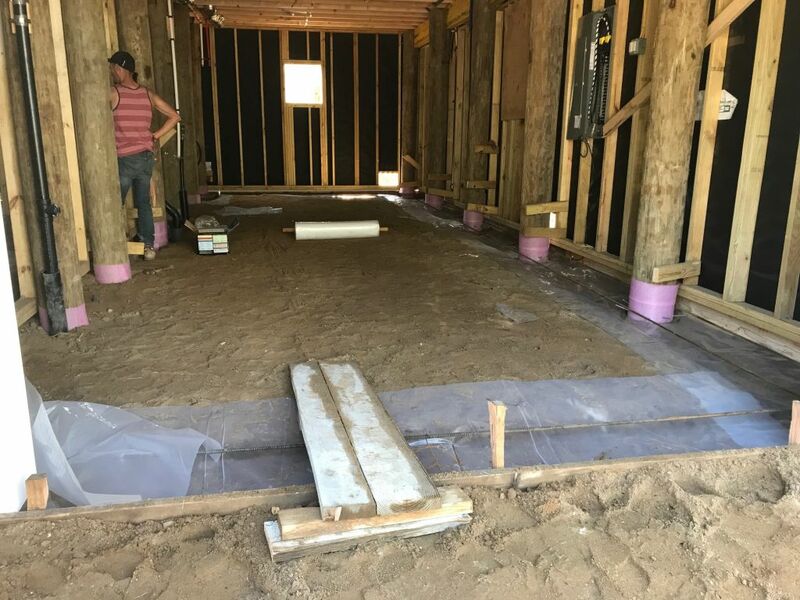 Home features covered deck on the first floor off Family Room, Family Room with Dry Bar area, Laundry Room with Sink, Jr. Suite, Hall Bath and two additional bedrooms. 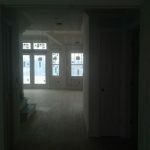 2nd floor Open concept Kitchen, Living room and Dining room with 13' ceiling heights. 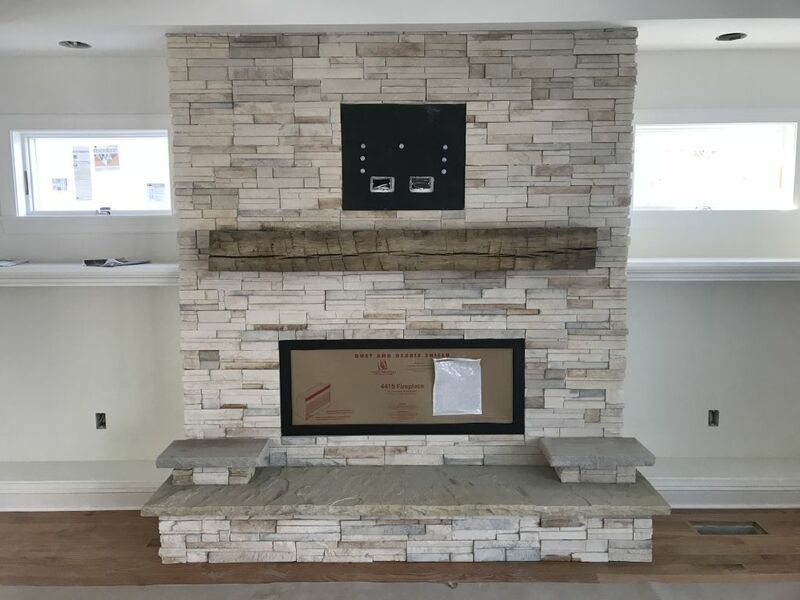 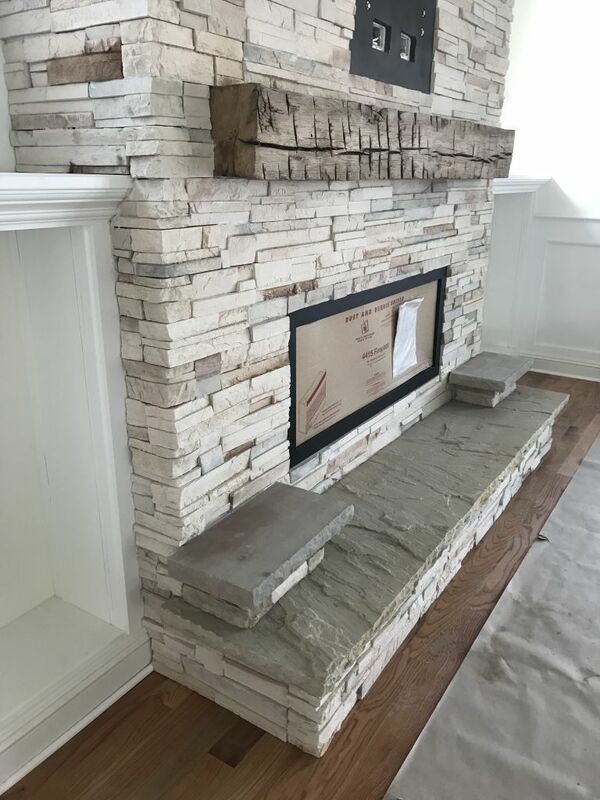 Situated between the Dining Room and Living room is a 3-sided fireplace which can be enjoyed in all three areas. 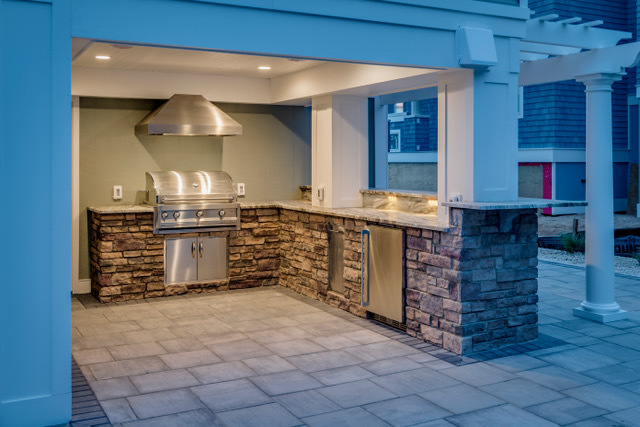 This home has a screened porch leading to a generous size deck for grilling. 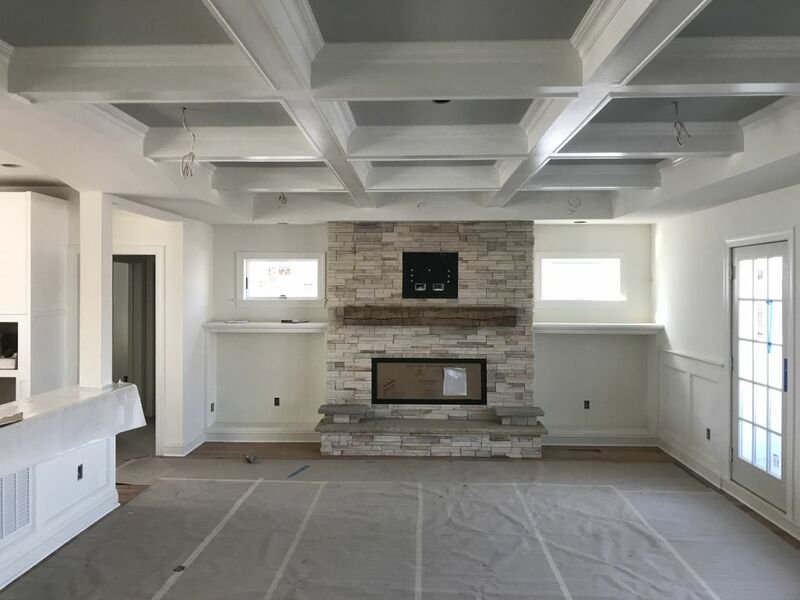 13' ceilings in Living Room, Dining Room and Kitchen, which you have a view of the 3-sided fireplace from all these areas. 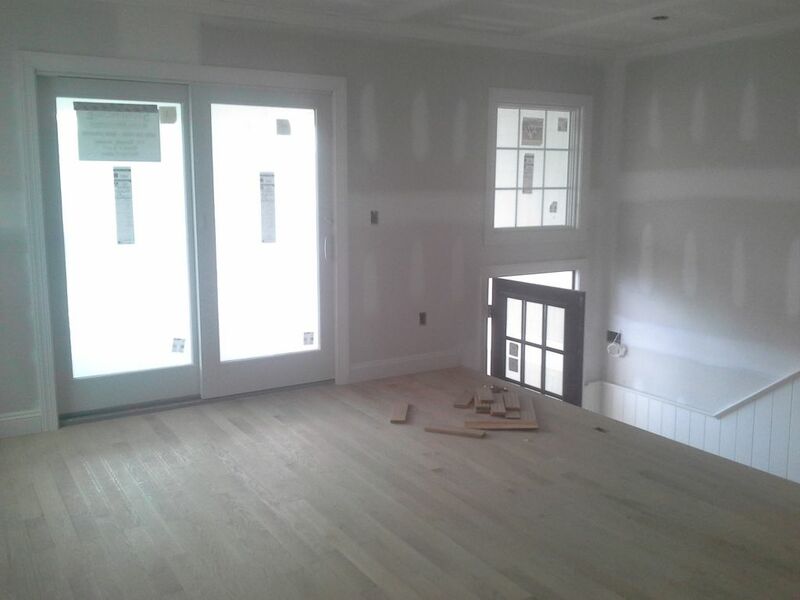 Off the Dining Room is a nice size Screened Porch which leads to the deck for grilling & entertaining. 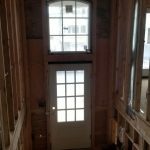 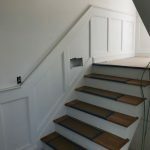 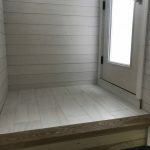 This home also features a residential elevator. 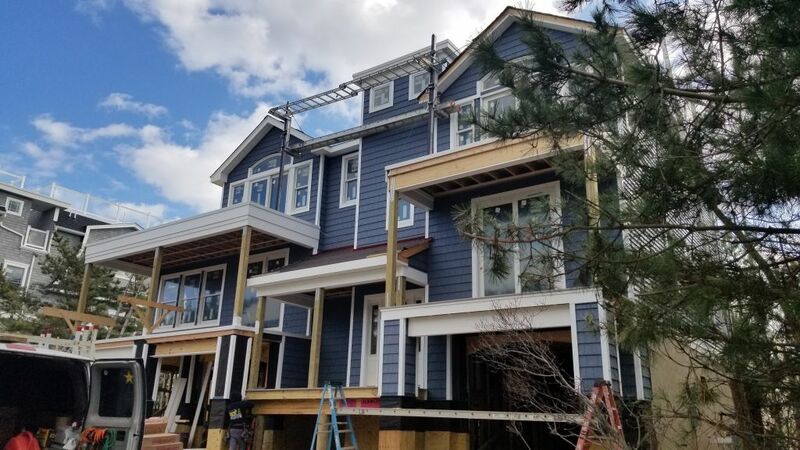 3,222 sq ft home featuring a 3 Car Garage, 5 Bedrooms, 4 1/2 baths, first floor has a generous size covered deck off Family Room along with 2 of the four bedrooms on the first floor offering covered decks. 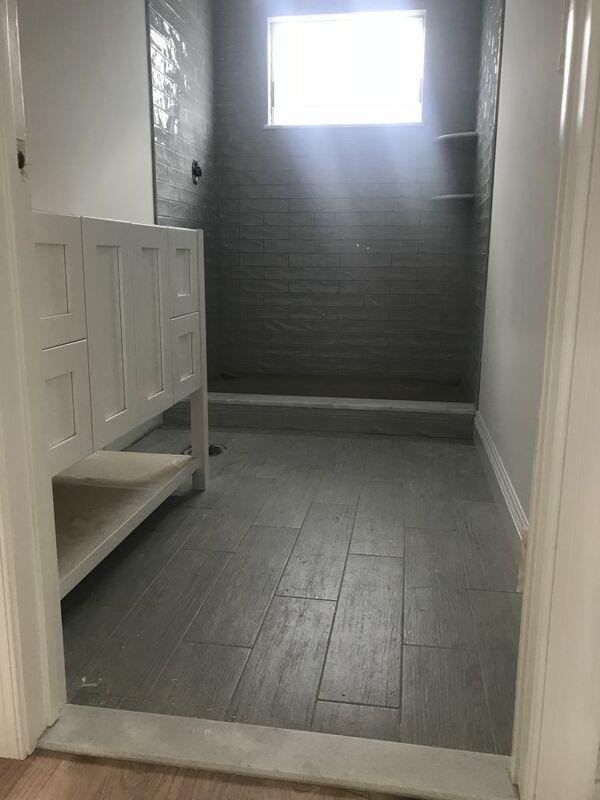 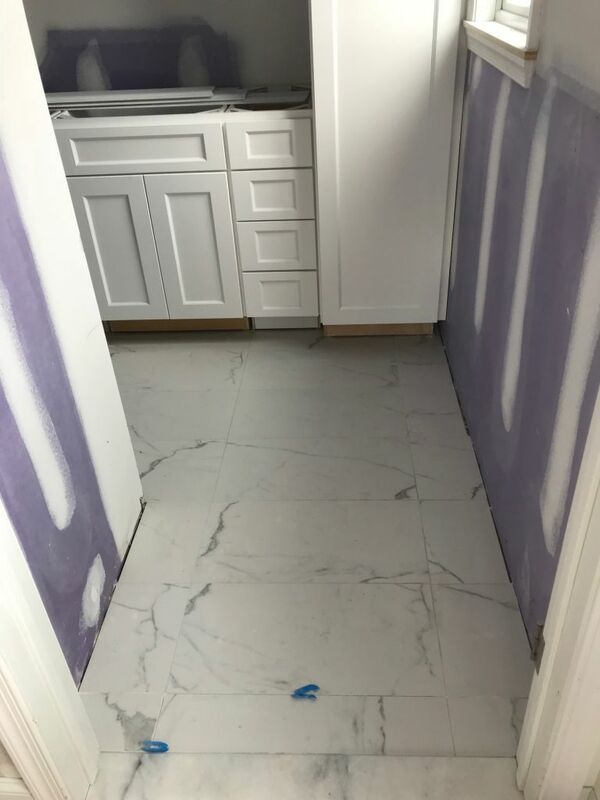 Laundry room features a fold down Ironing board. 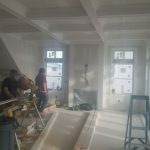 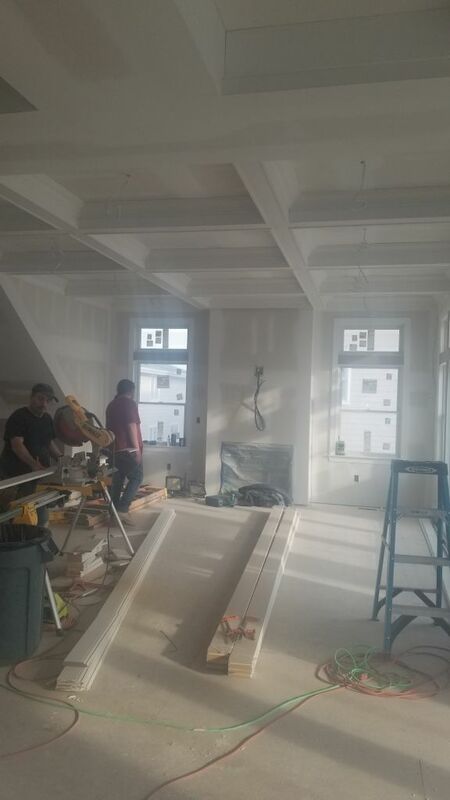 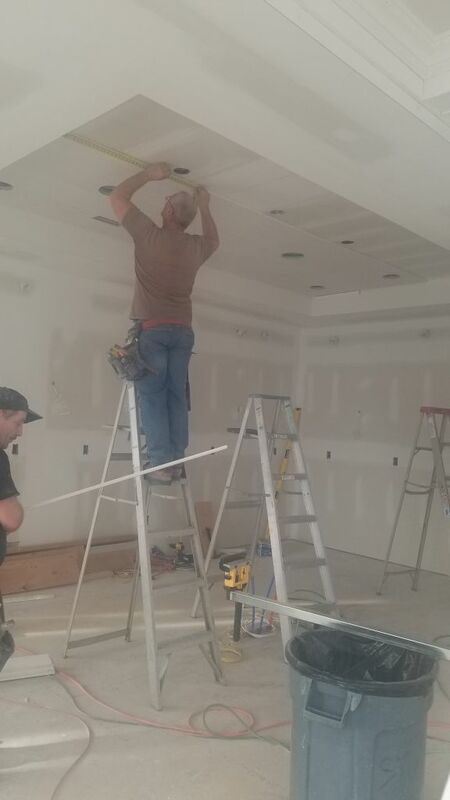 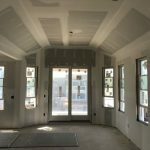 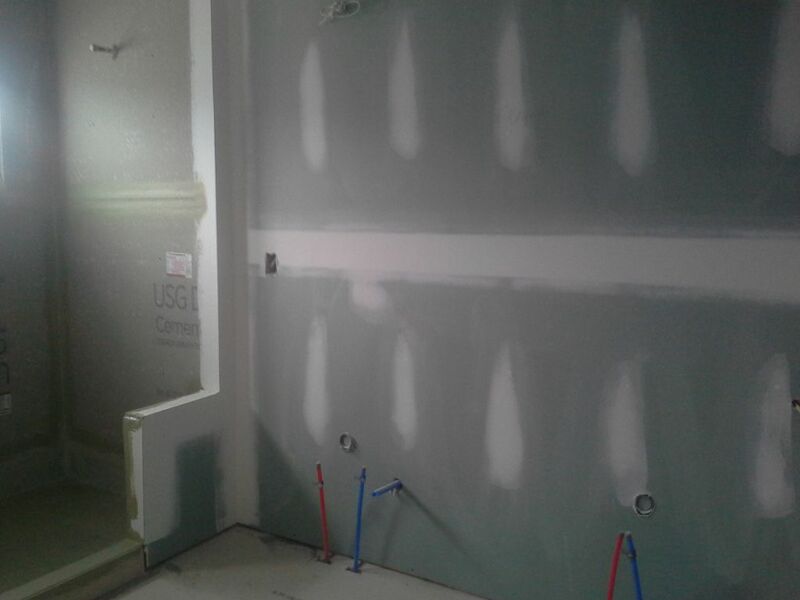 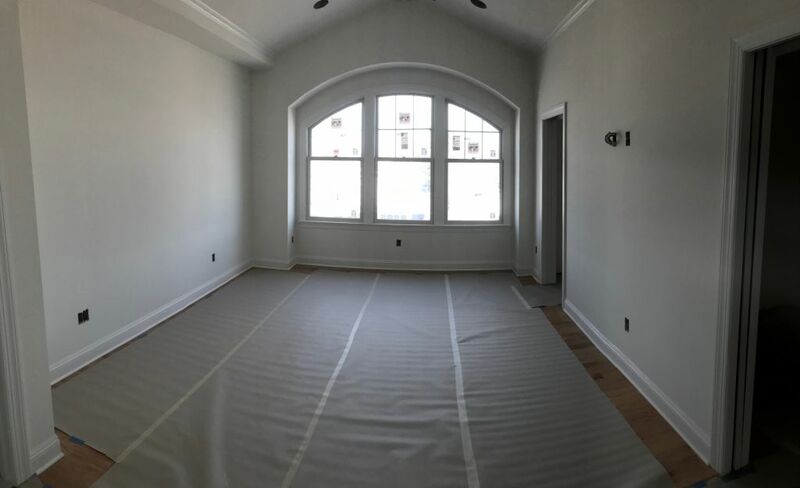 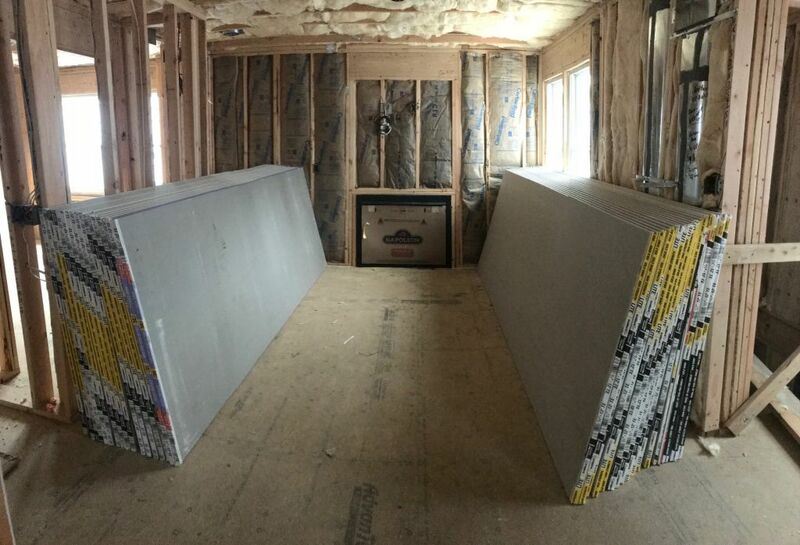 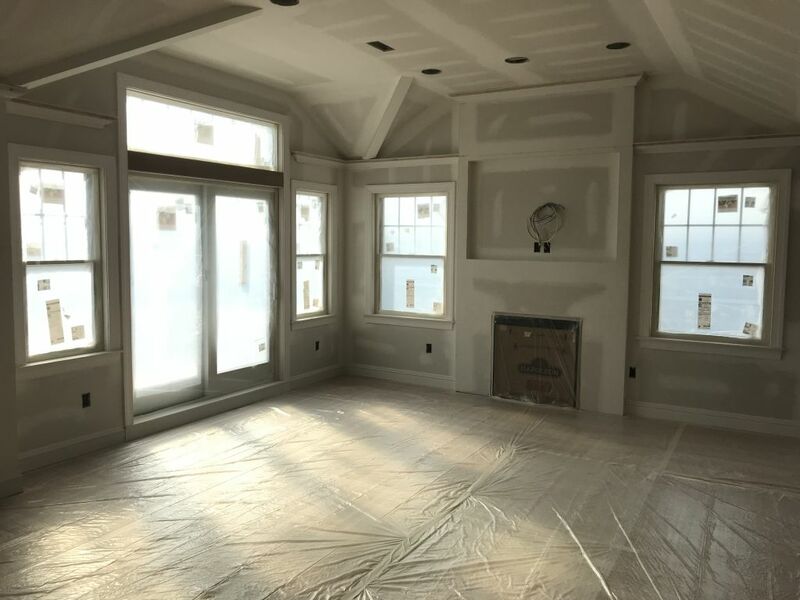 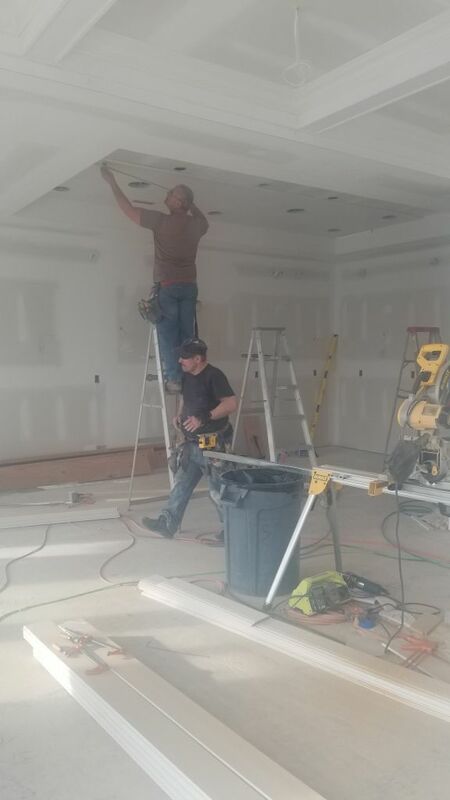 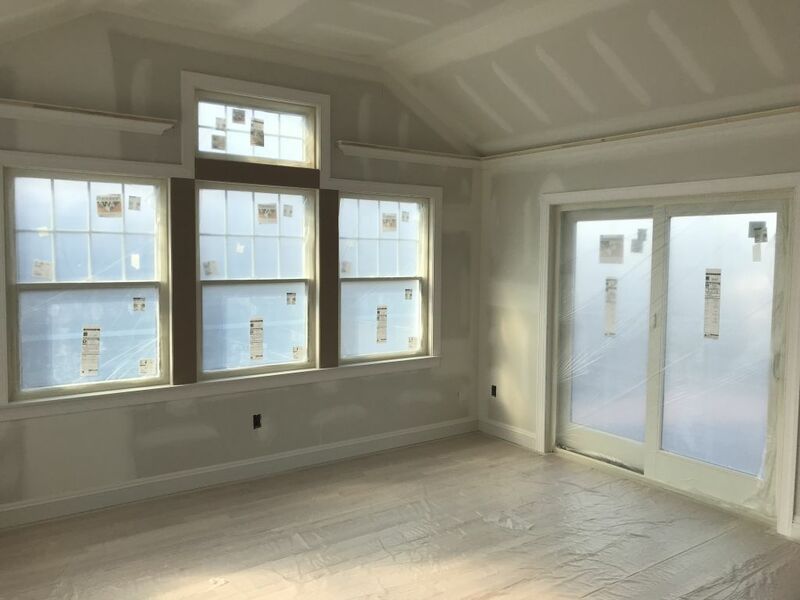 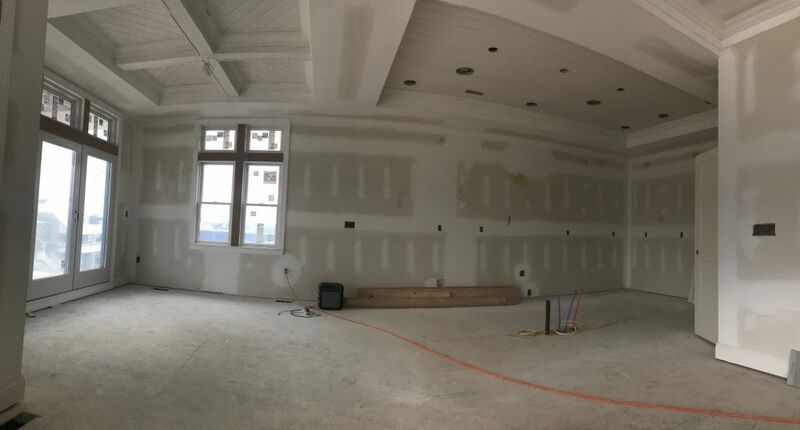 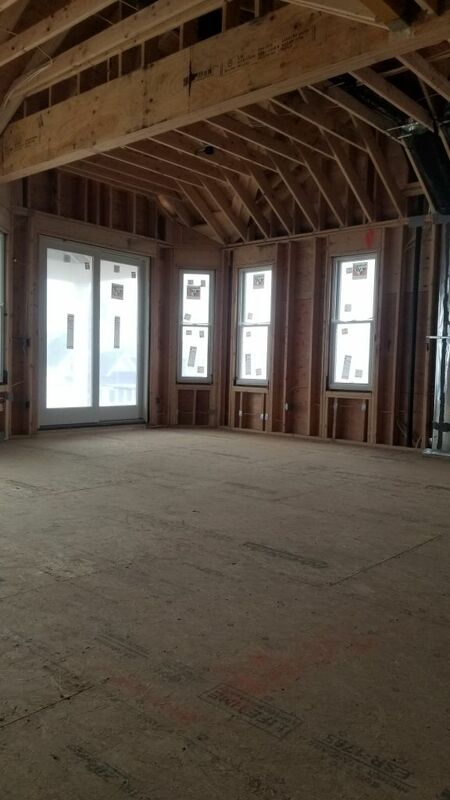 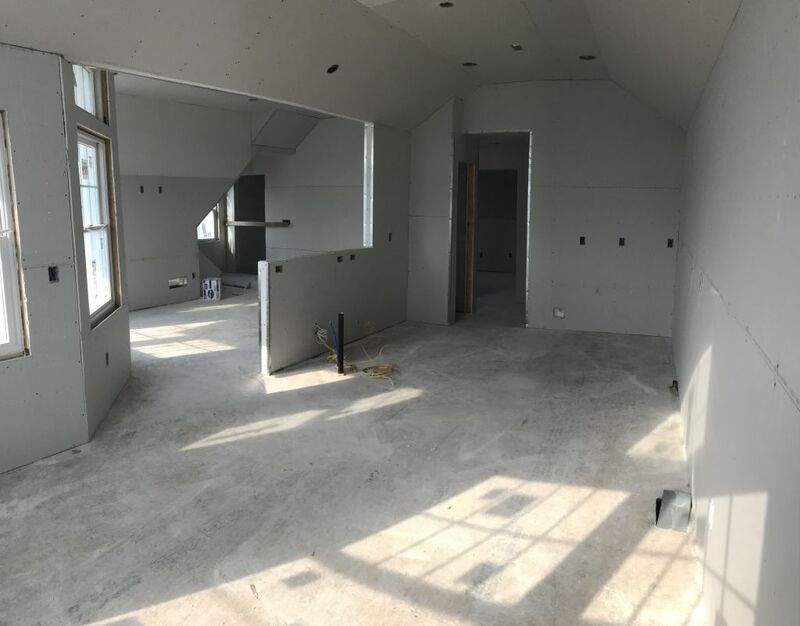 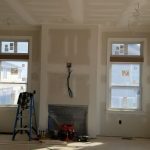 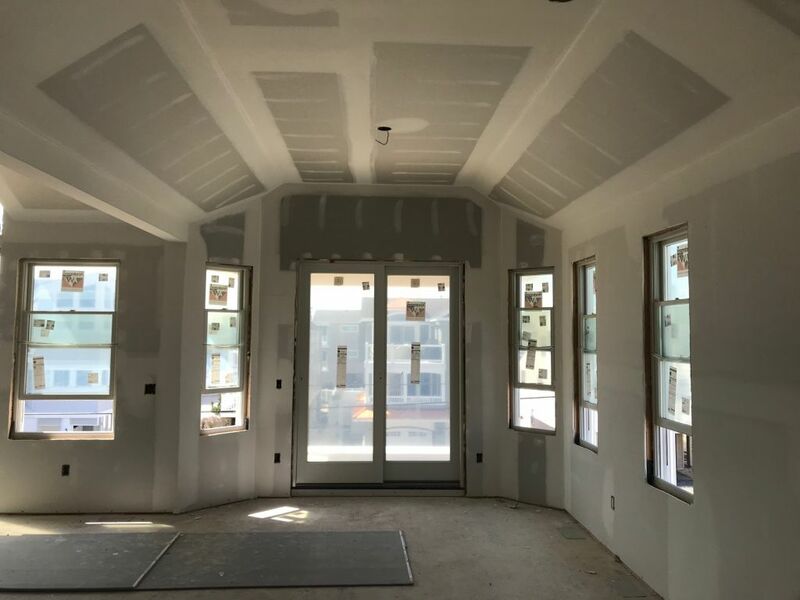 Second Floor Volume Ceilings in the Living Dining Room and Master. 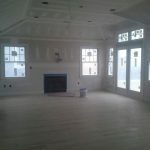 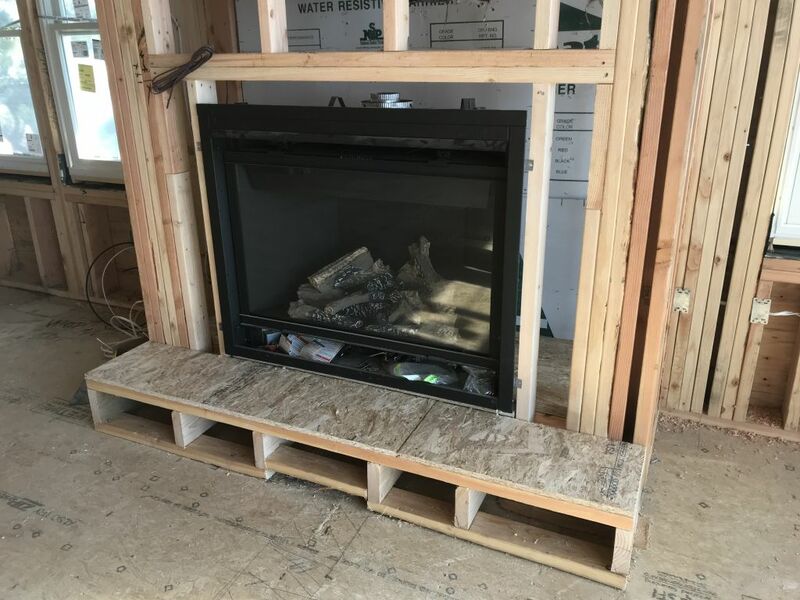 Large Deck off Living room/dining room and one off of the Master Bedrooms, Elevator, and a 42" Napoleon Gas Fireplace.